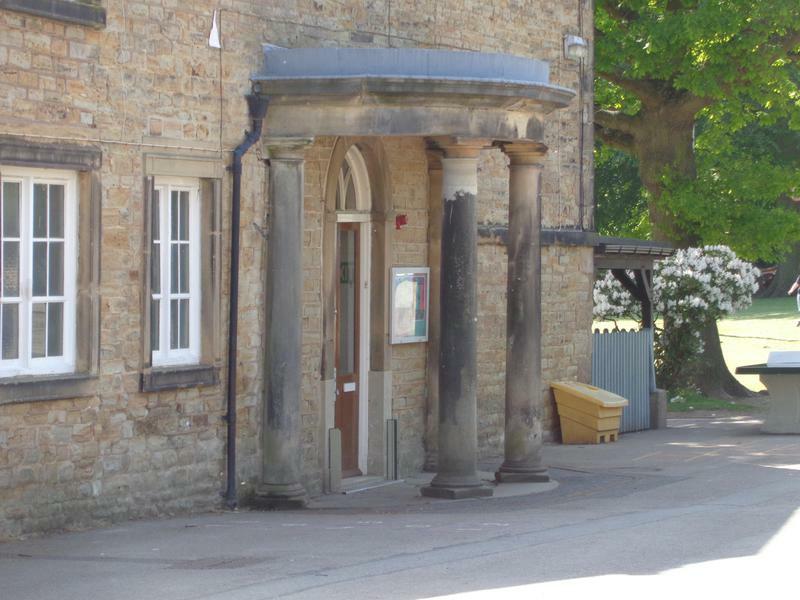 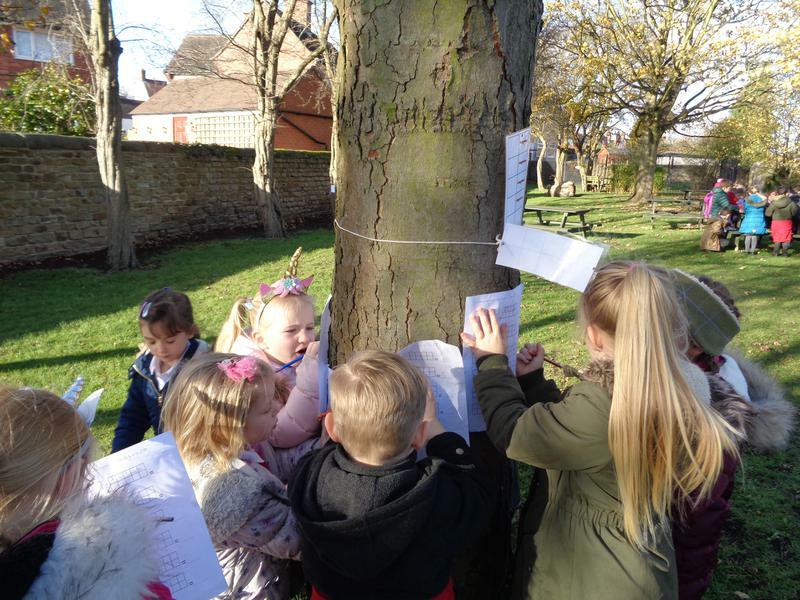 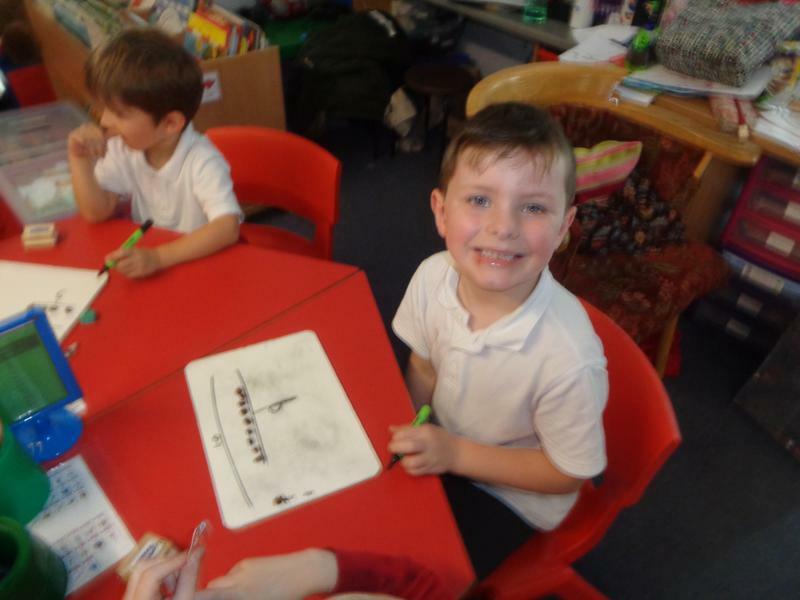 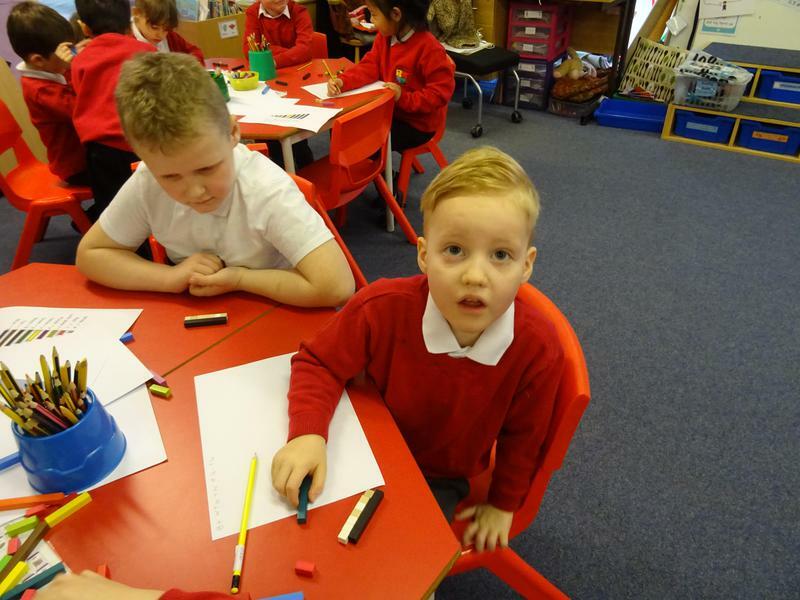 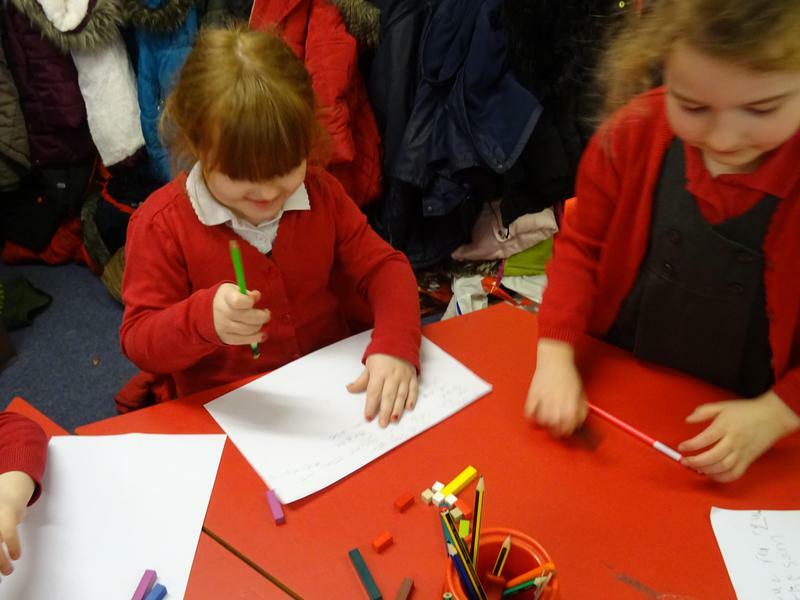 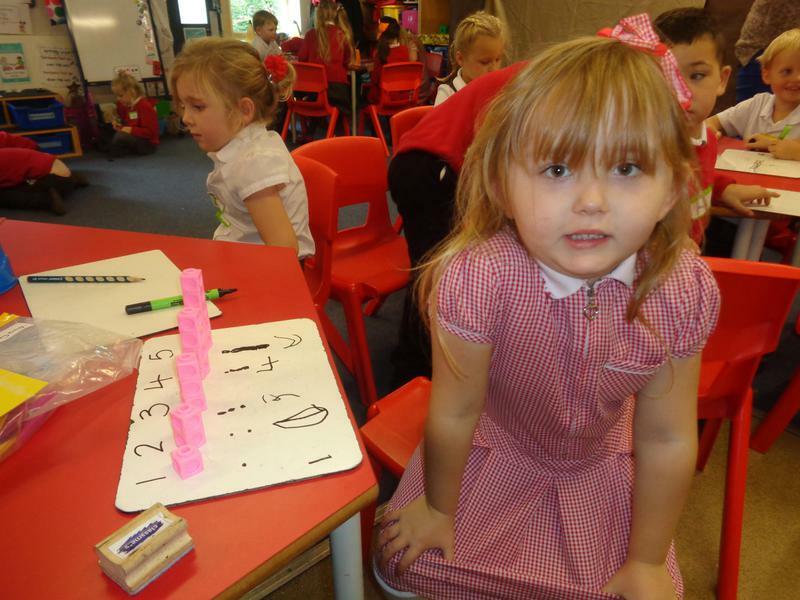 Here at Highfield Hall we encourage our children to investigate and explore in maths. 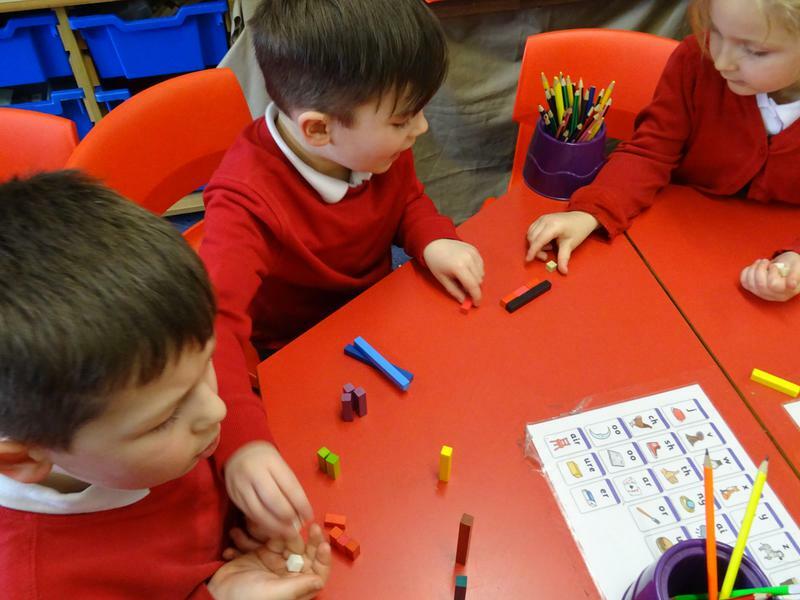 We use lots of concrete resources and real-life experiences to enable children to fully engage in maths and understand the concepts they encounter. 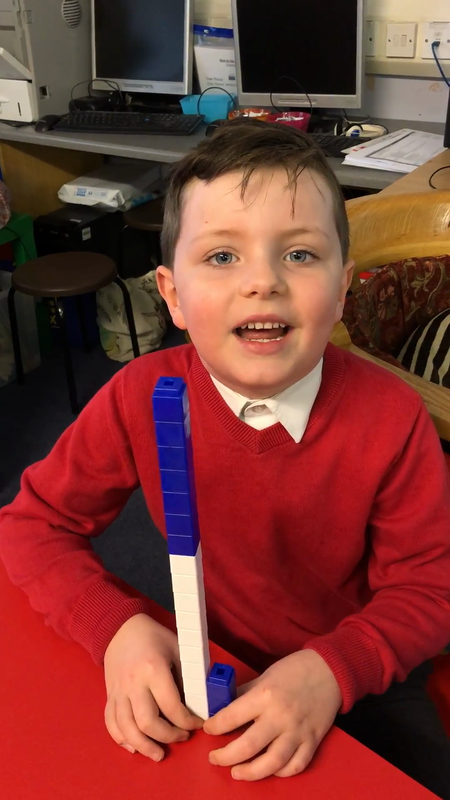 This is an approach recommended by maths specialists and consultants across the globe to enable children to fully understand key underlying principles. 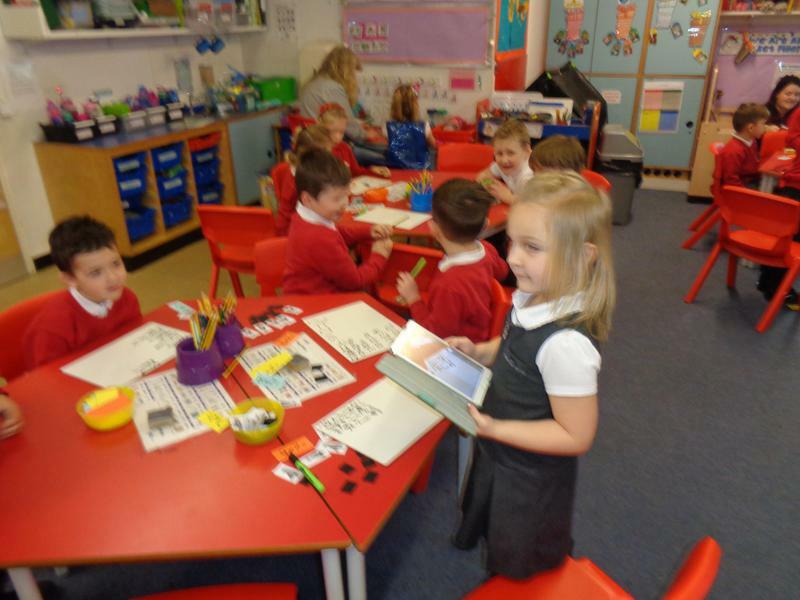 In this way we are ensuring children learn through understanding and experience. 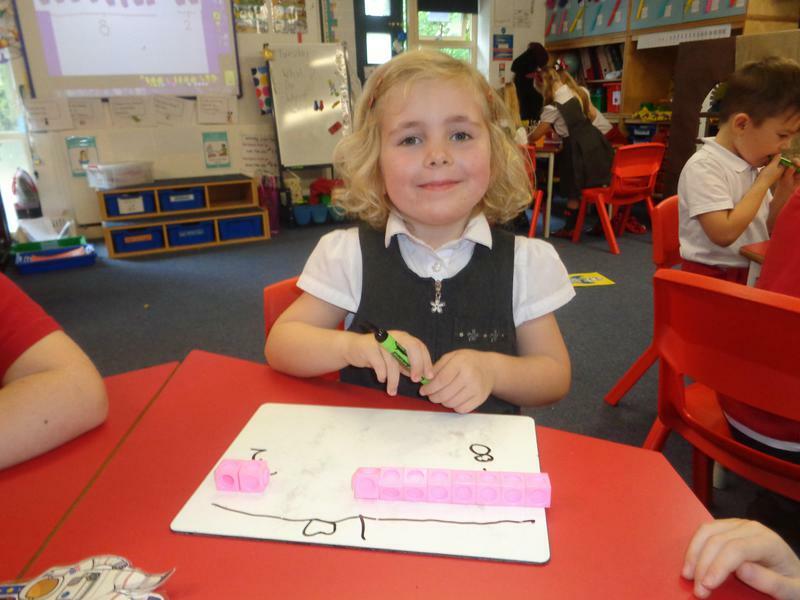 We have been learning all about numbers and what they mean. 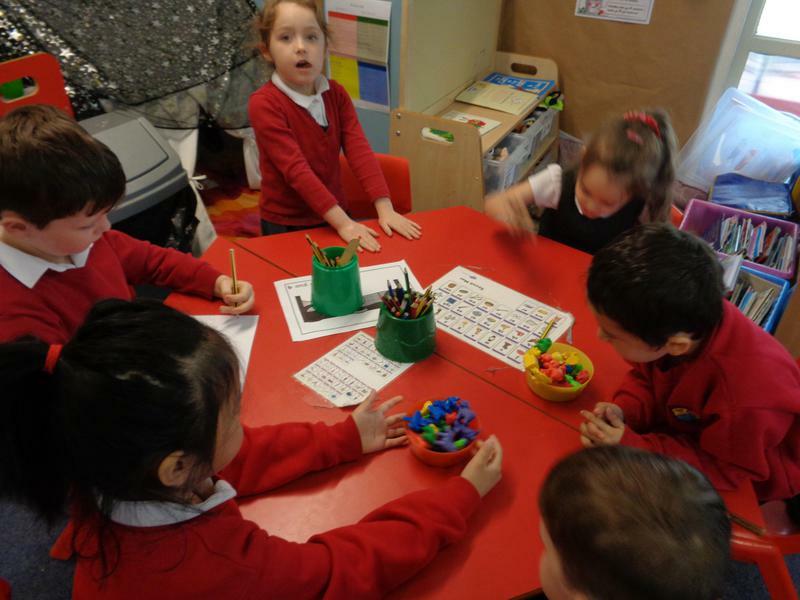 We thought about what we saw in our heads when we thought of a number and talked about what numbers mean to us. 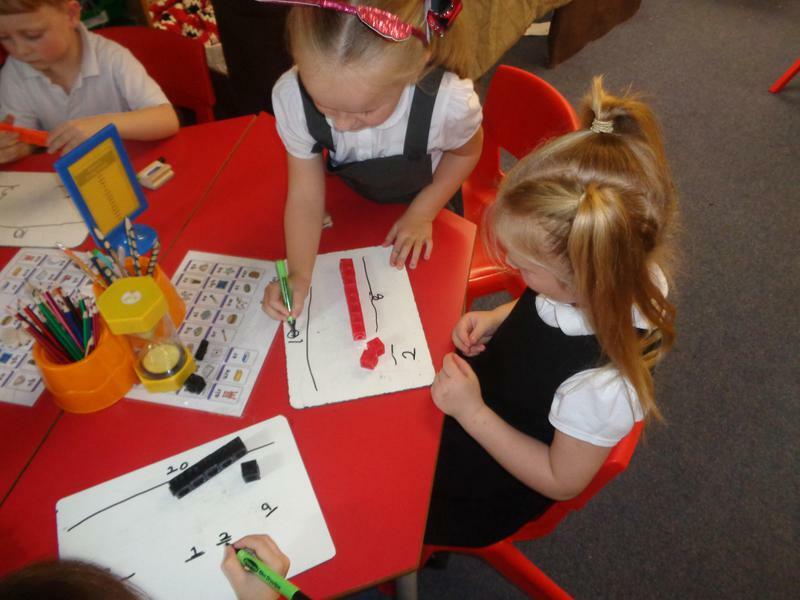 We made numbers in lots of different ways and explored how numbers are different. 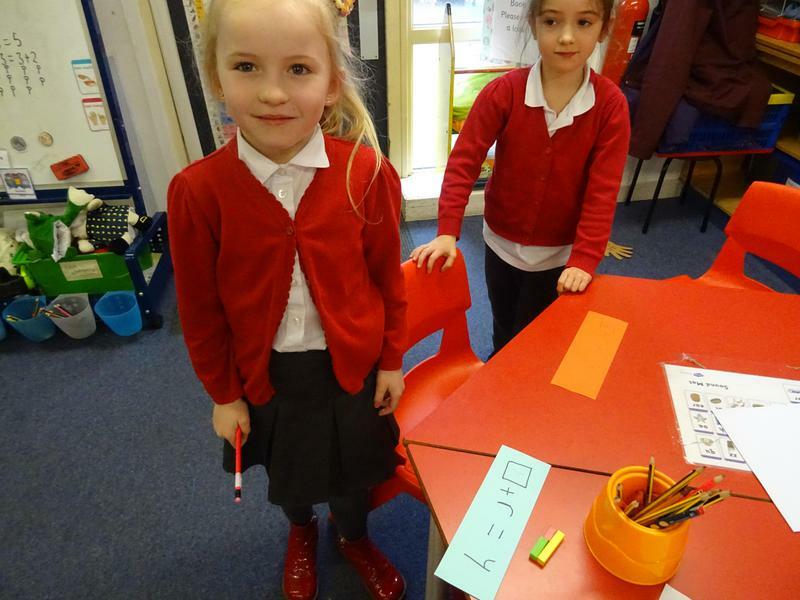 We explored questions such as "What does 5 mean?" 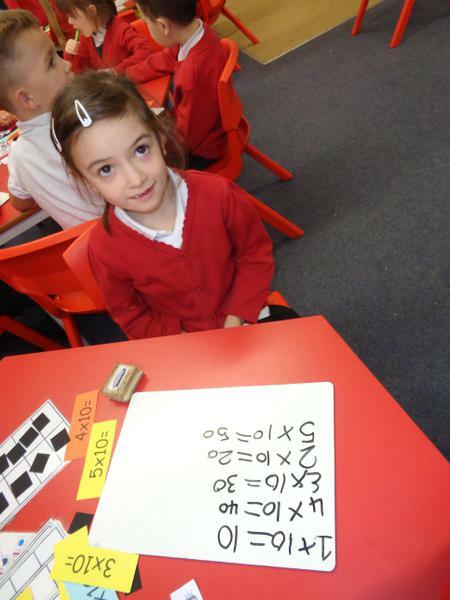 and "How are 5 and 7 different?" 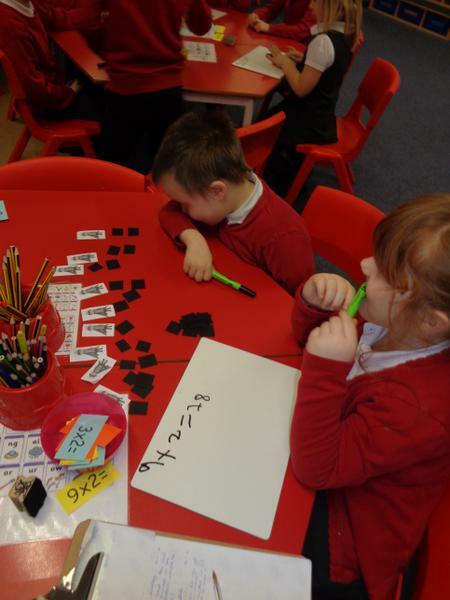 We chose which resources we wanted to use to show our thinking and to explore numbers further. 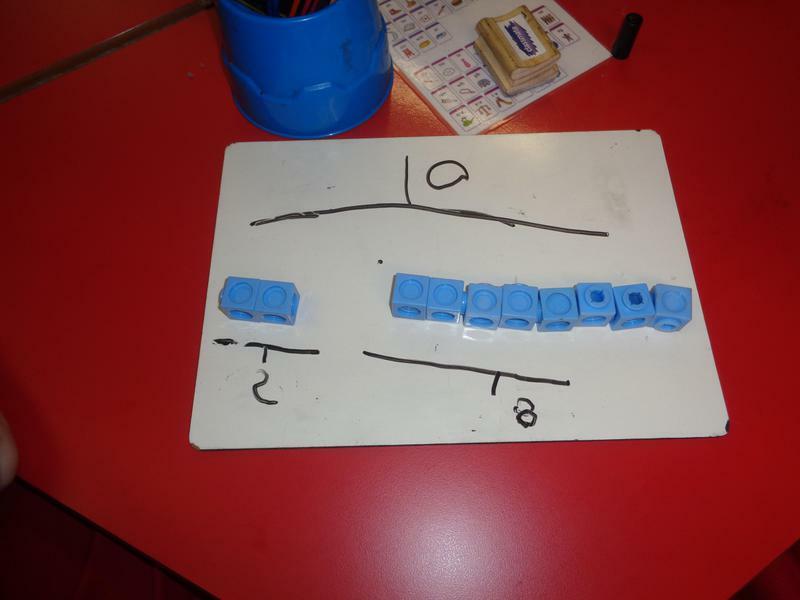 We have started learning about the bar model and how we can use this to represent addition. 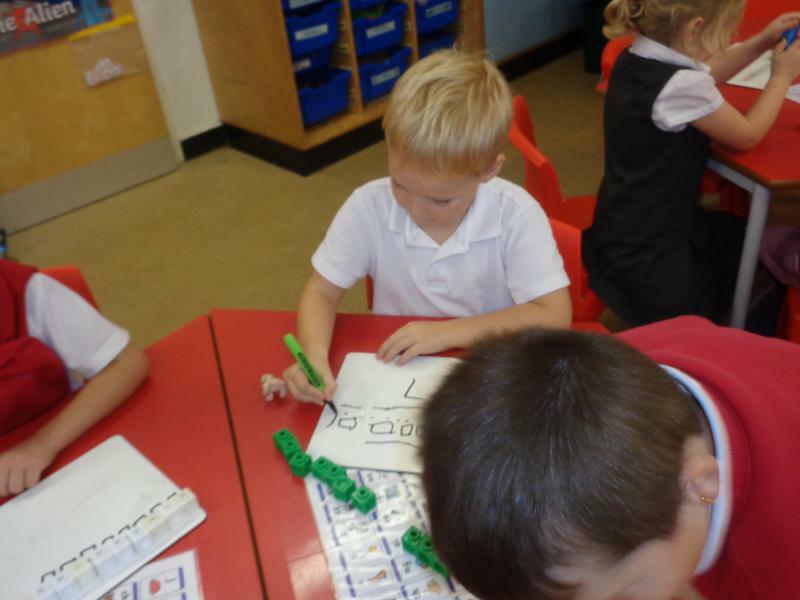 We used number facts we have already learnt to start thinking about how we can add parts together to make a whole! 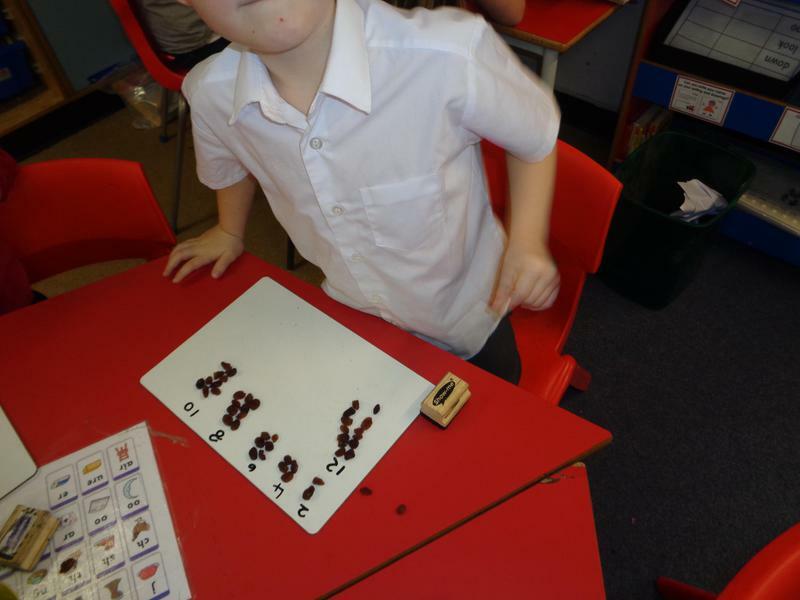 We are really good at our number bonds to 10 so we used raisins to make a bar model of number bonds to 10. 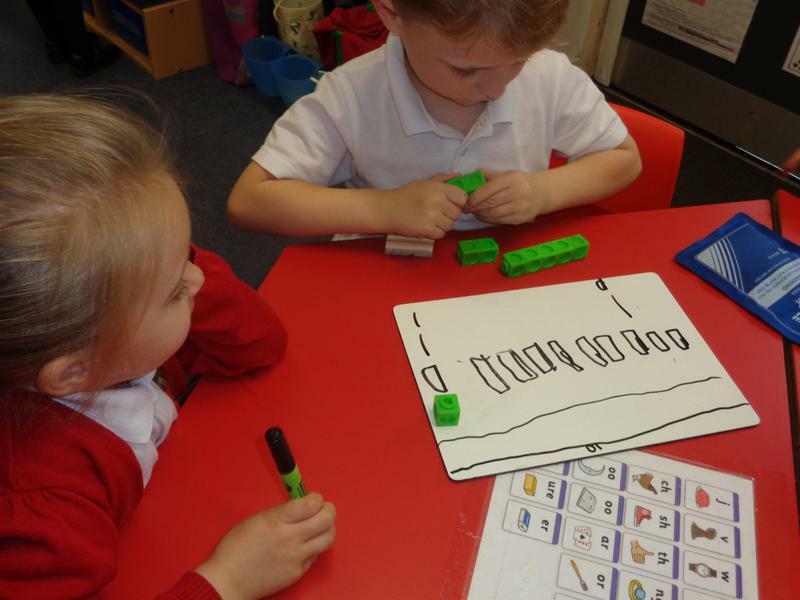 We then found all the ways you can make 10 with 2 parts and wrote the numbers to show the size of each part and the whole. 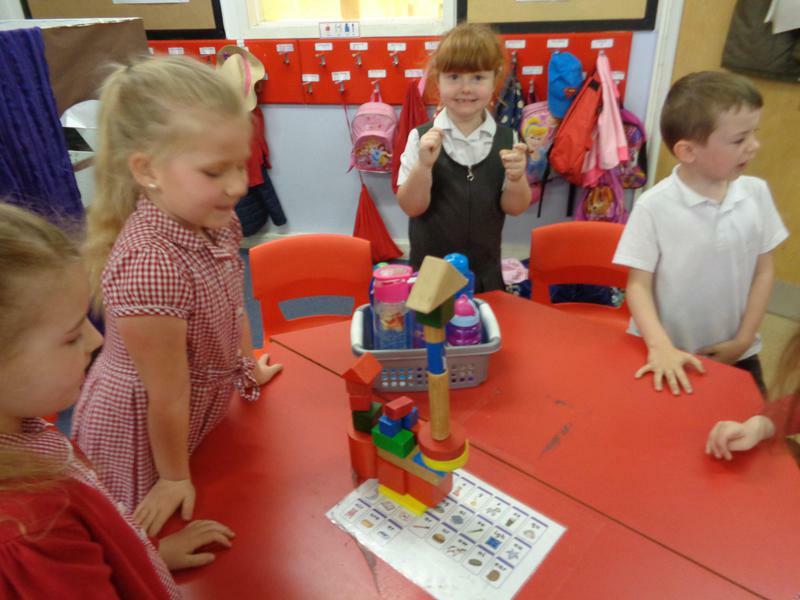 We did this really well and had lots of fun! 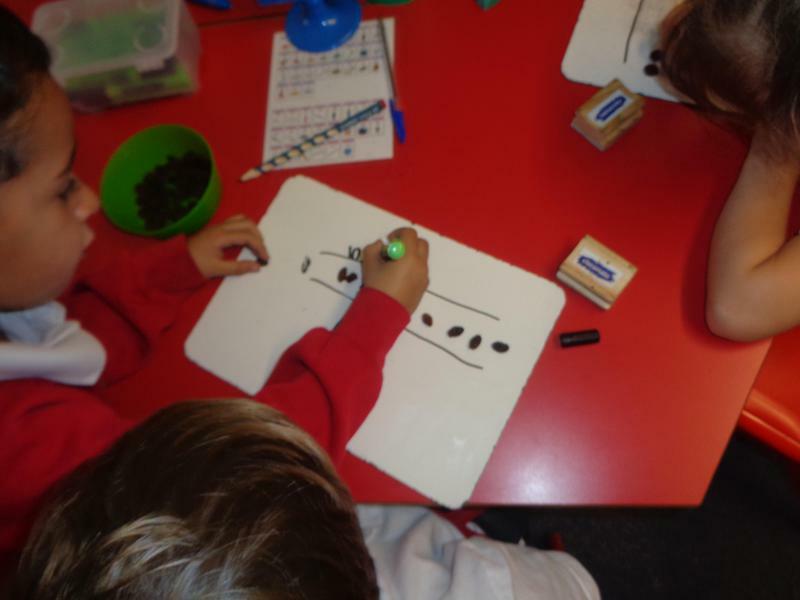 Using raisins to make part, part, whole bar models of number bonds to 10. 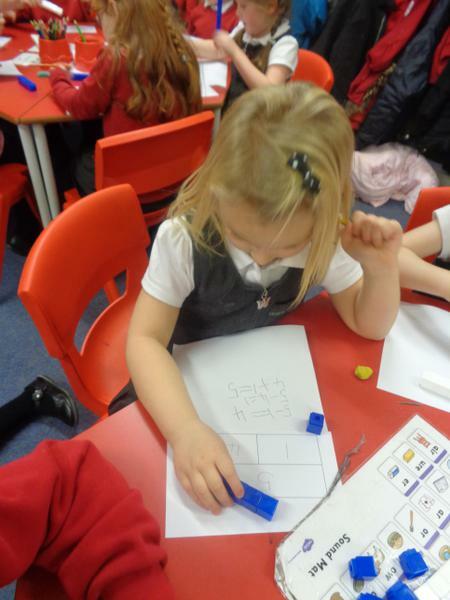 Now that we are beginning to understand part, part, whole we have been using cubes and whiteboards to show how numbers can pair together to make 10. 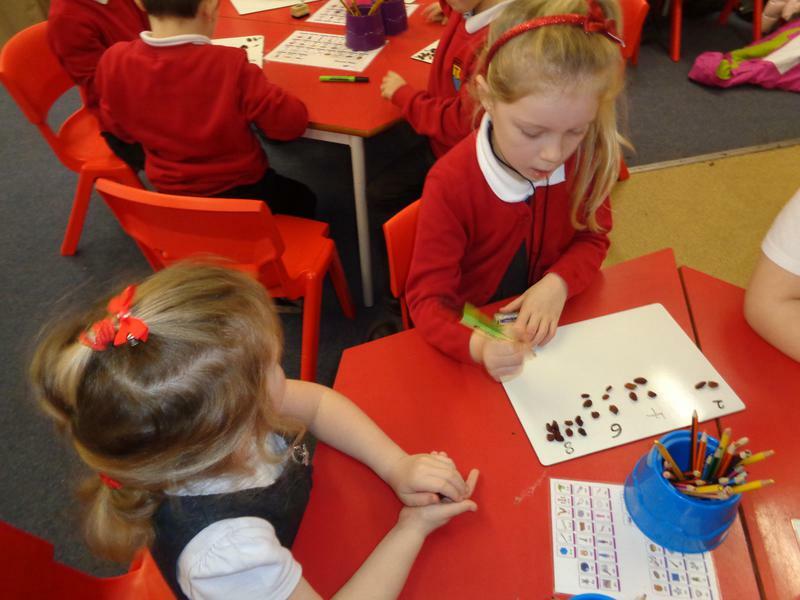 We really understand our number bonds to 10 and this has helped us to be sure our work is accurate. 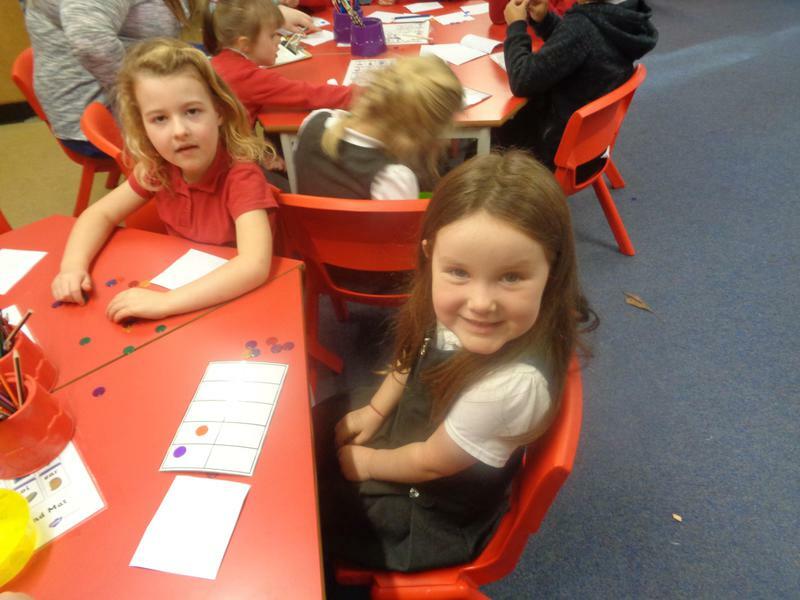 We love learning in maths and are very good at organising resources to help us learn. 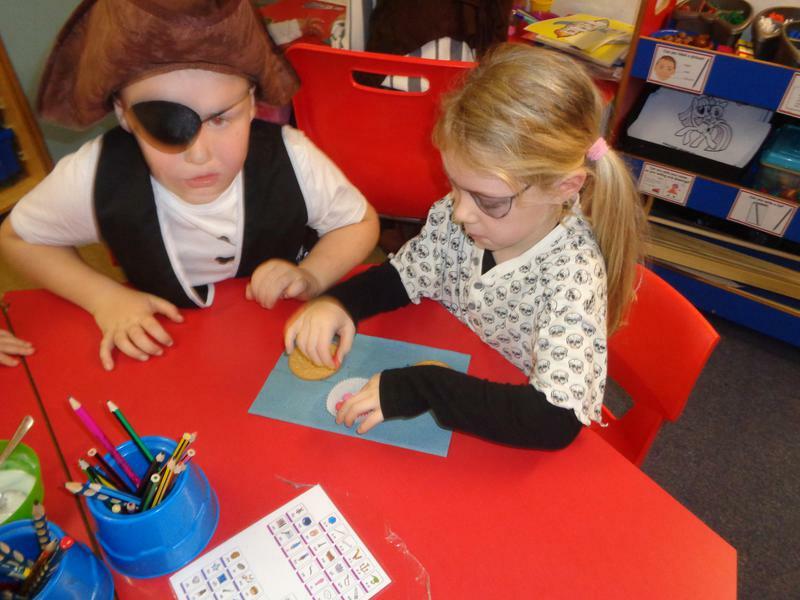 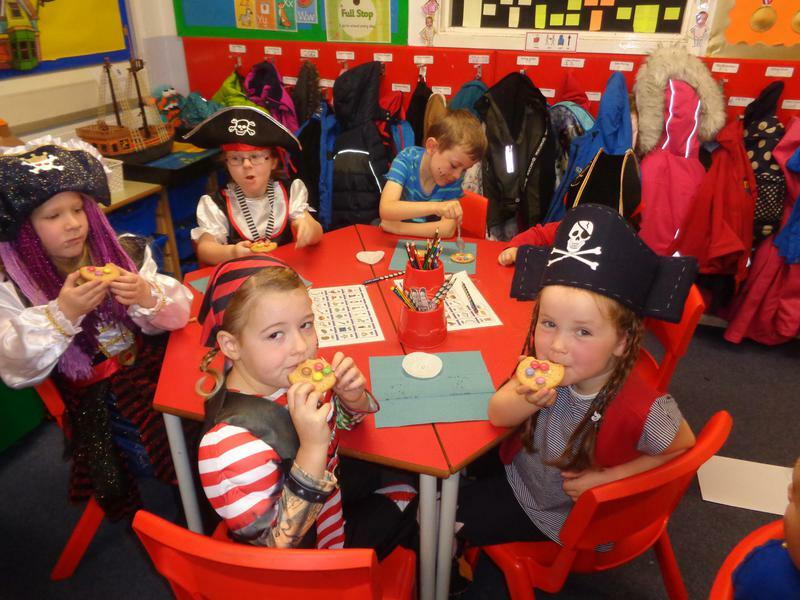 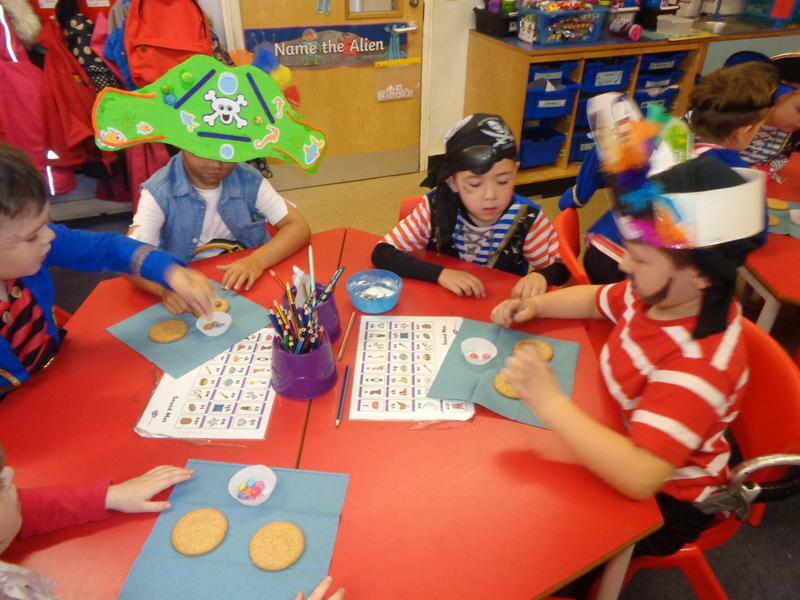 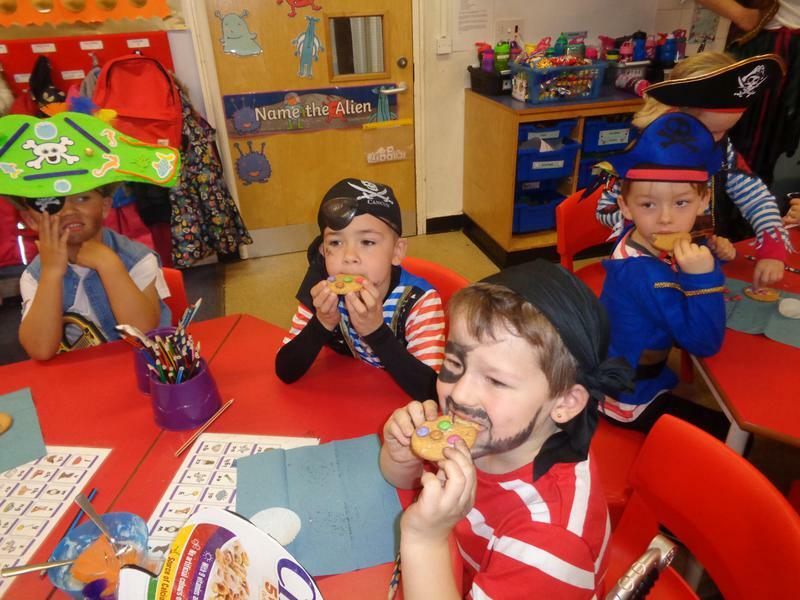 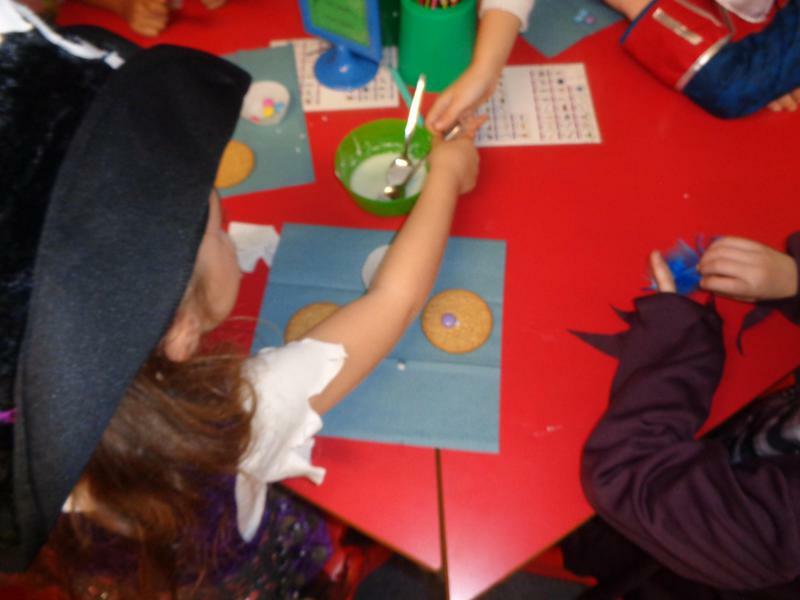 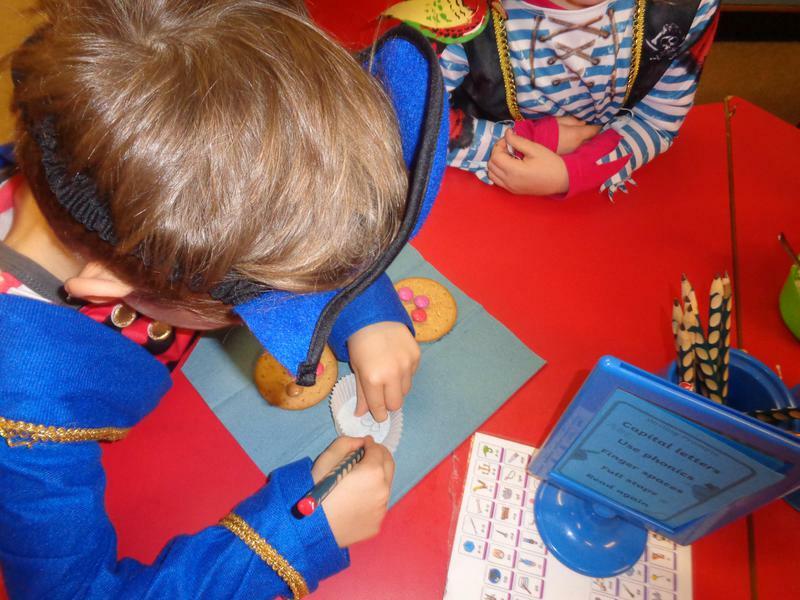 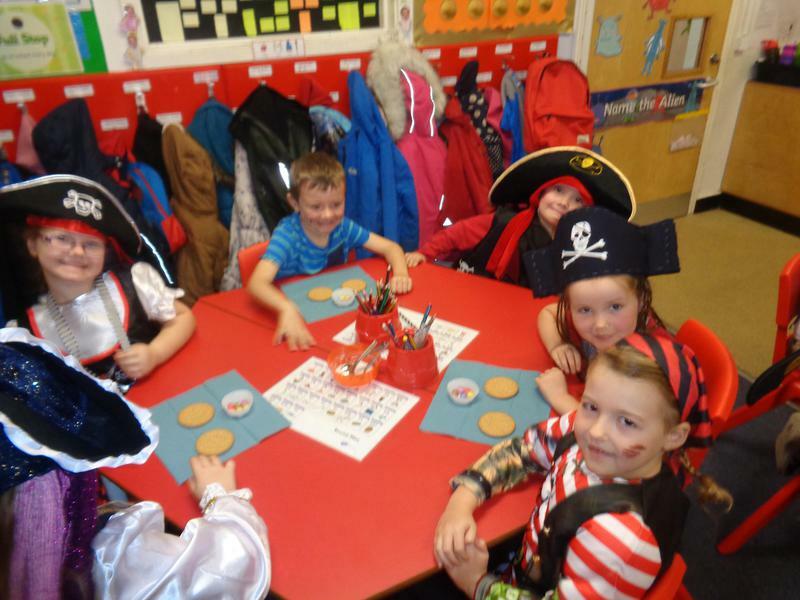 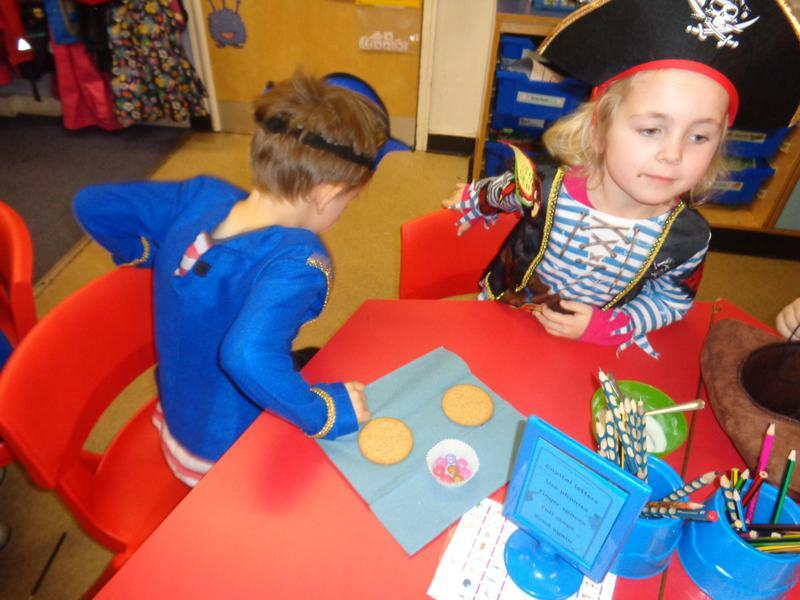 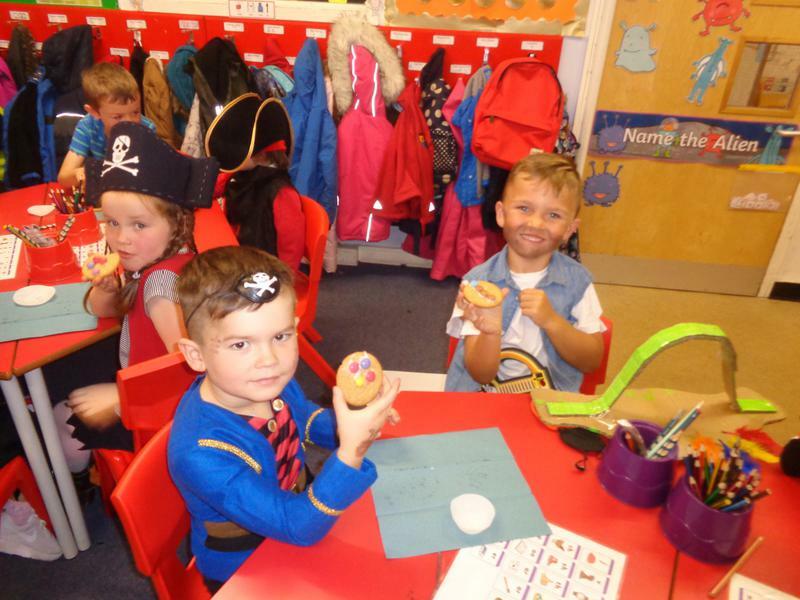 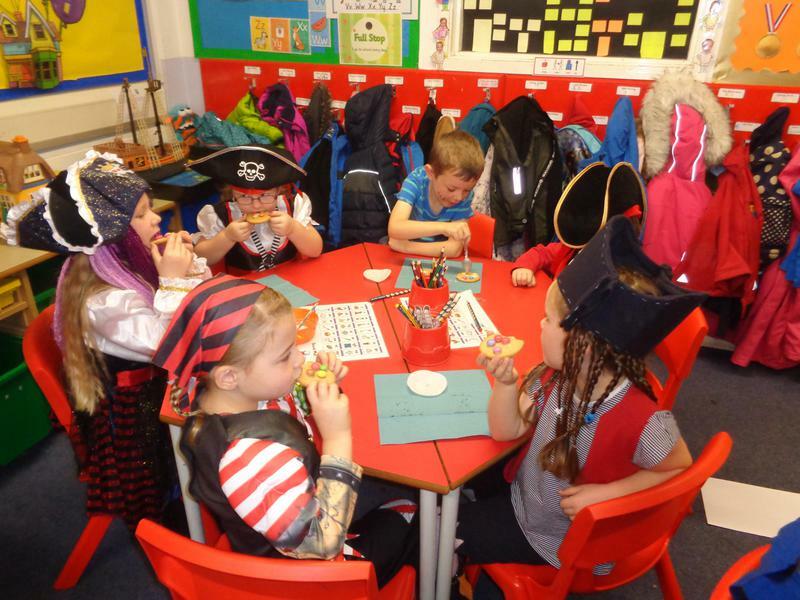 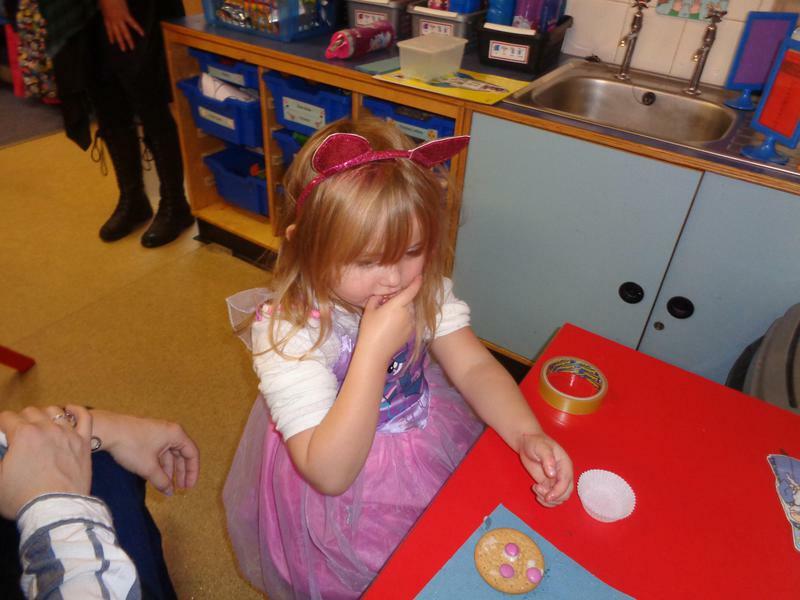 On Pirate Day, we used what we knew about part, part, whole to decorate our biscuits. 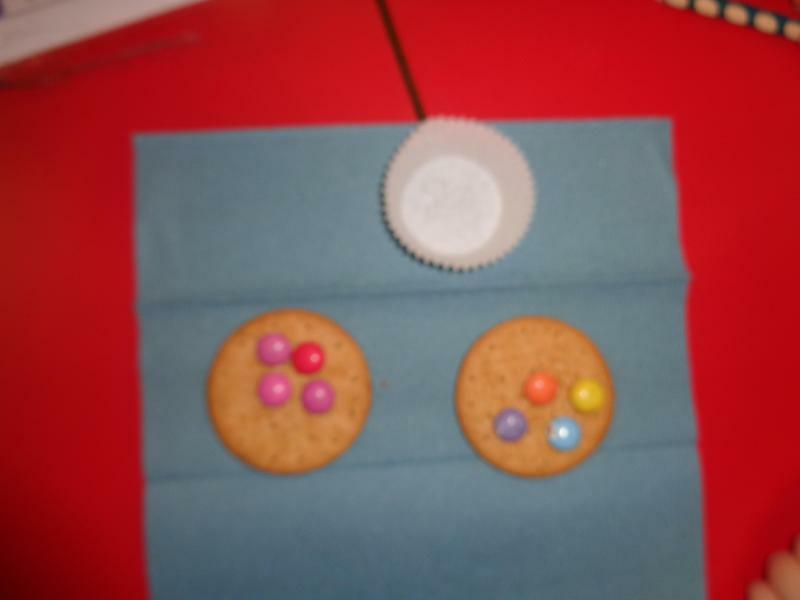 We also made sure we divided our smarties equally so that it was fair. 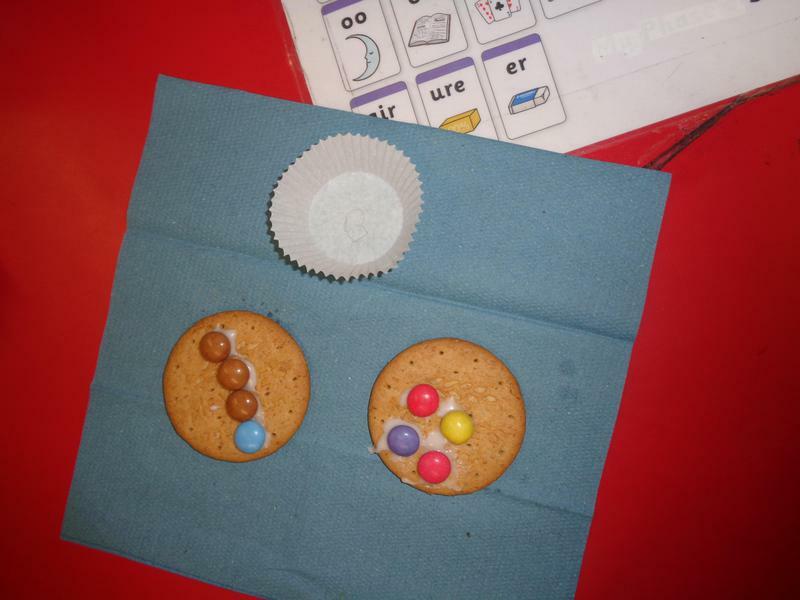 Once we had divided our smarties and decorated our biscuits we then thought about the whole. 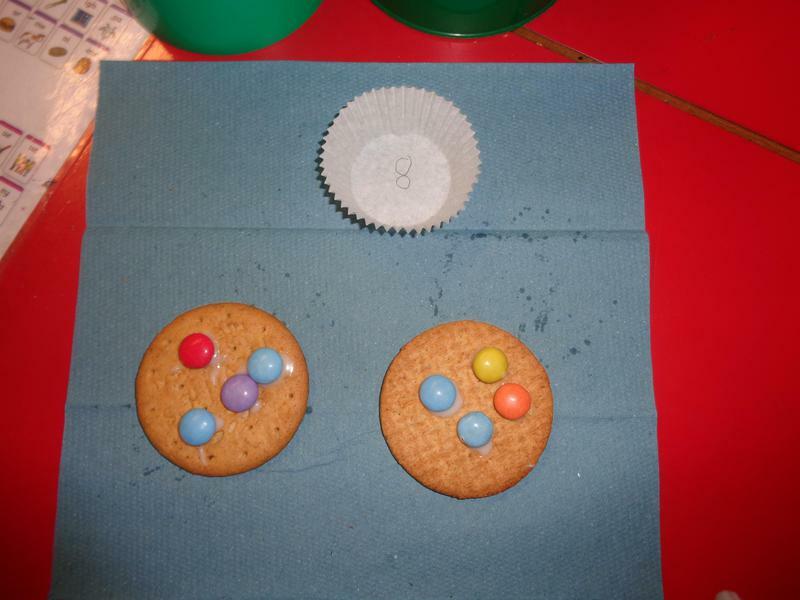 Each decorated biscuit was a part, the parts came together to make the whole. 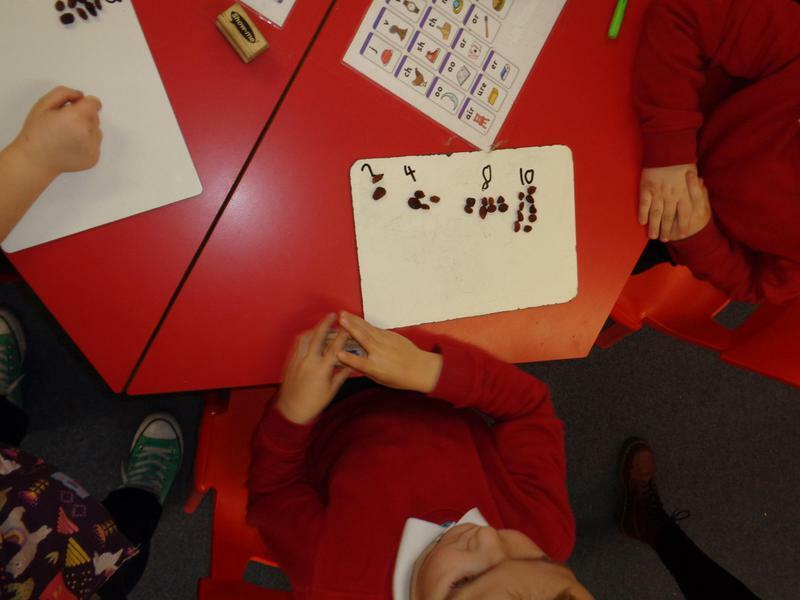 We each had 4 smarties in our part and we found the 'whole' was 8. 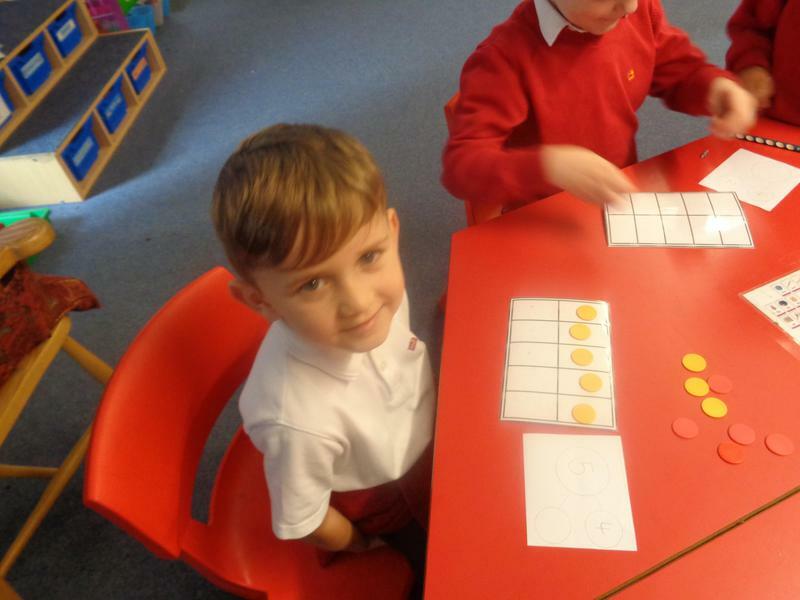 We love maths and we are all so good at it! 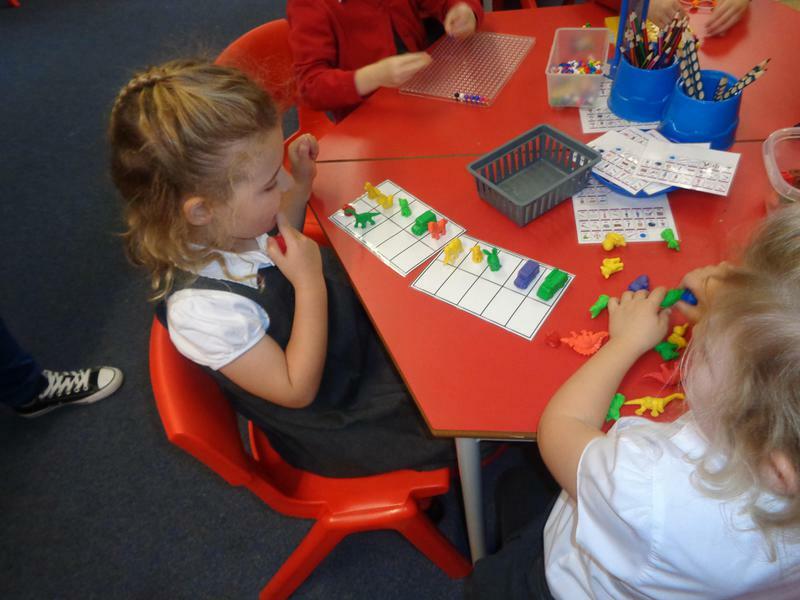 Mrs Jones' class are getting really good at knowing what numbers are without counting (subitizing) and using resources to investigate. 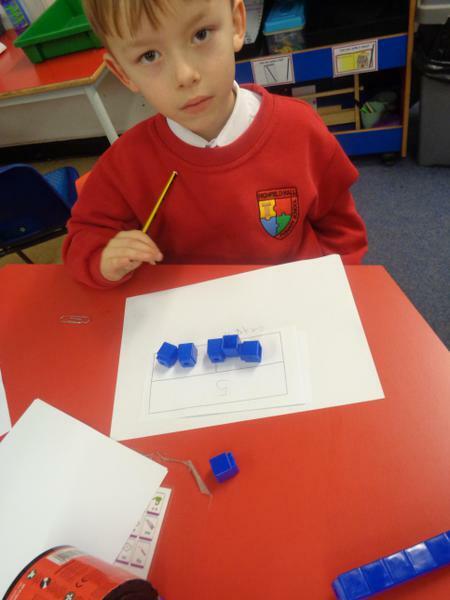 This term we have been continuing our work on how the number system works and using the part part whole models. 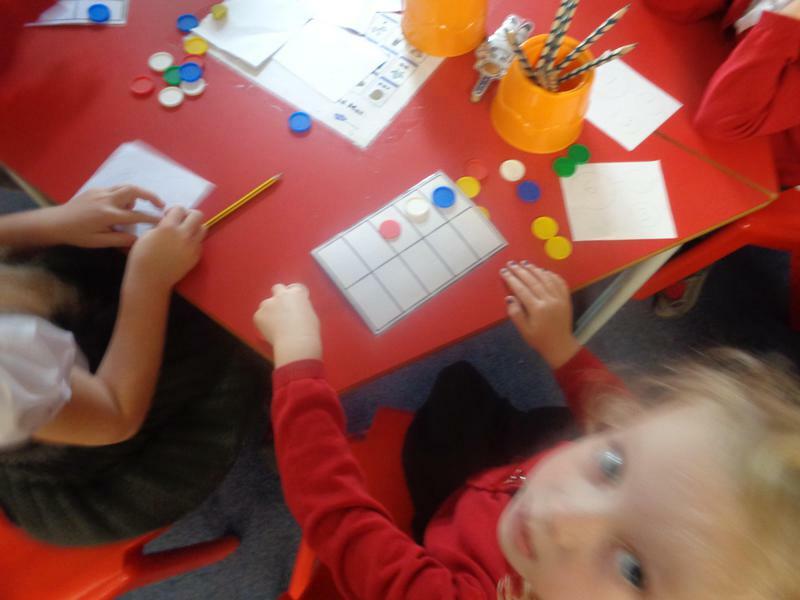 We generate our own numbers and use practical equipment such as ten frames, counters and unifix to calculate. 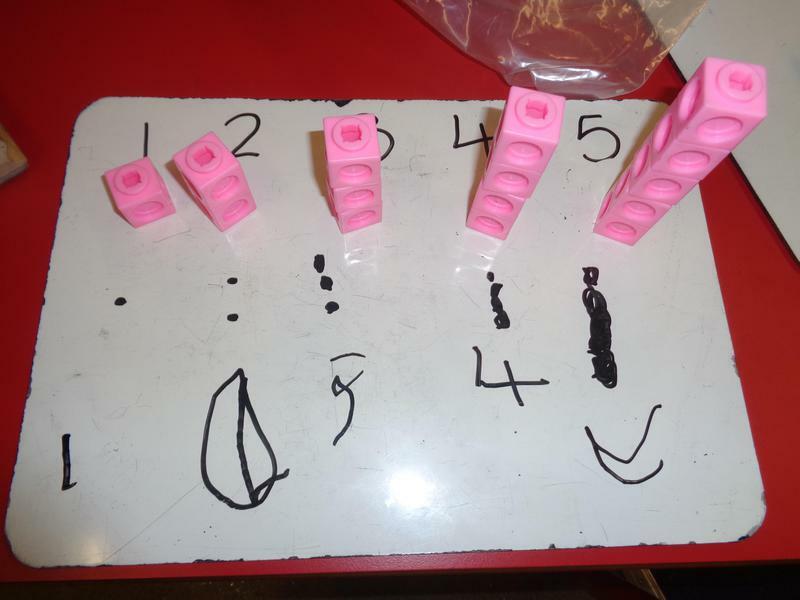 We have looked at two different models for the part part whole method. 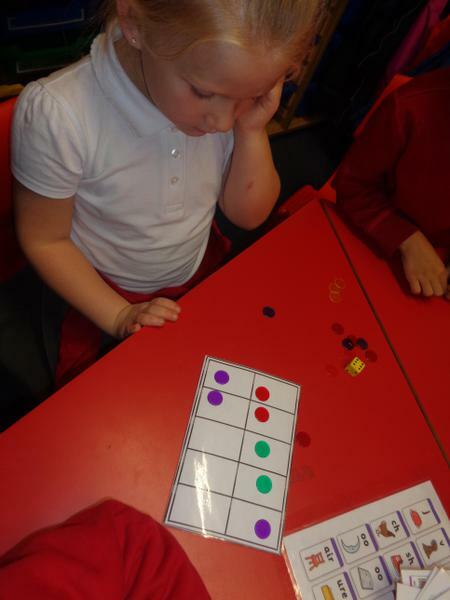 We use 10 frames to help us calculate. 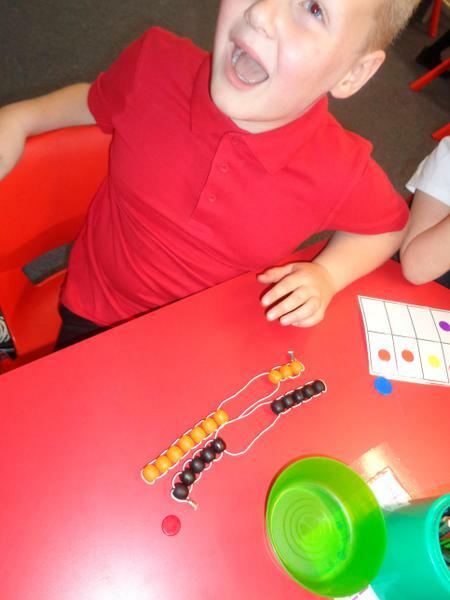 We can use part part whole and ten frames for addition and subtraction! 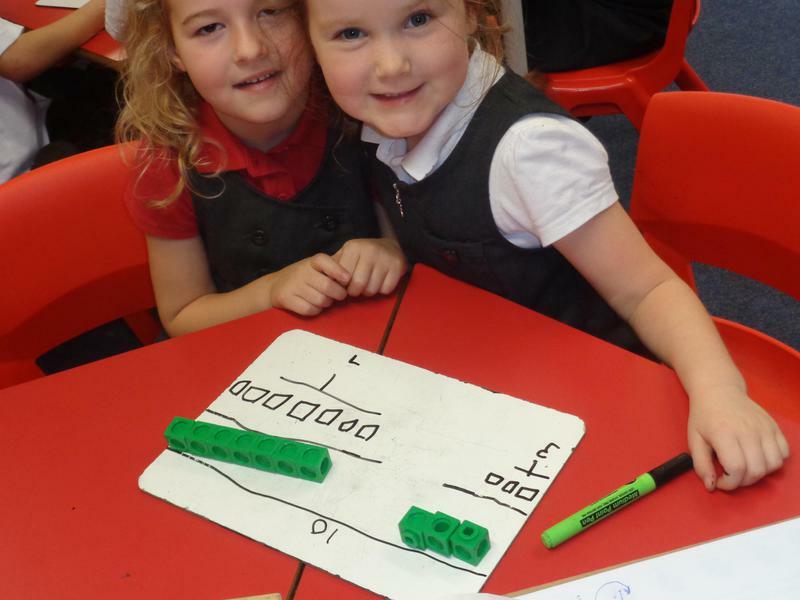 We used unifix and ten frames to investigate how all the numbers in a complete part part whole model worked together. 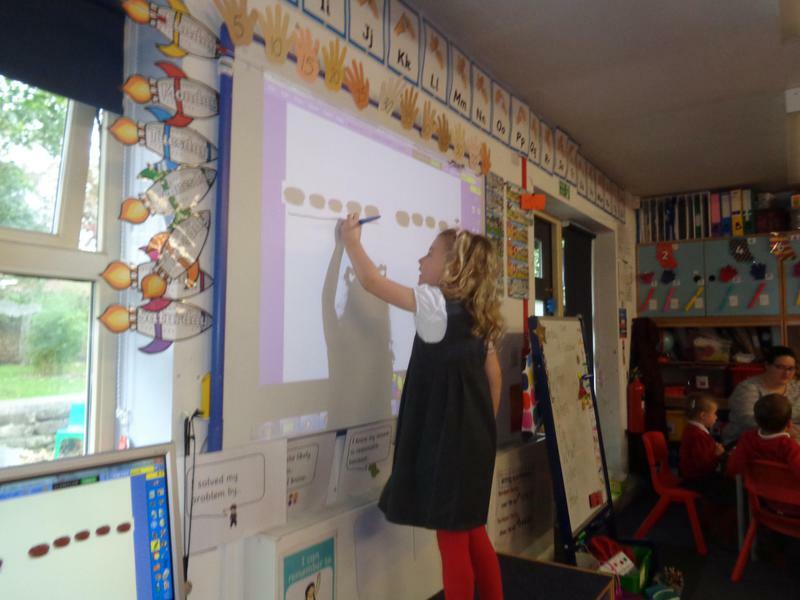 We found we could use addition and subtraction and that the numbers could be used in different orders and it would still work. 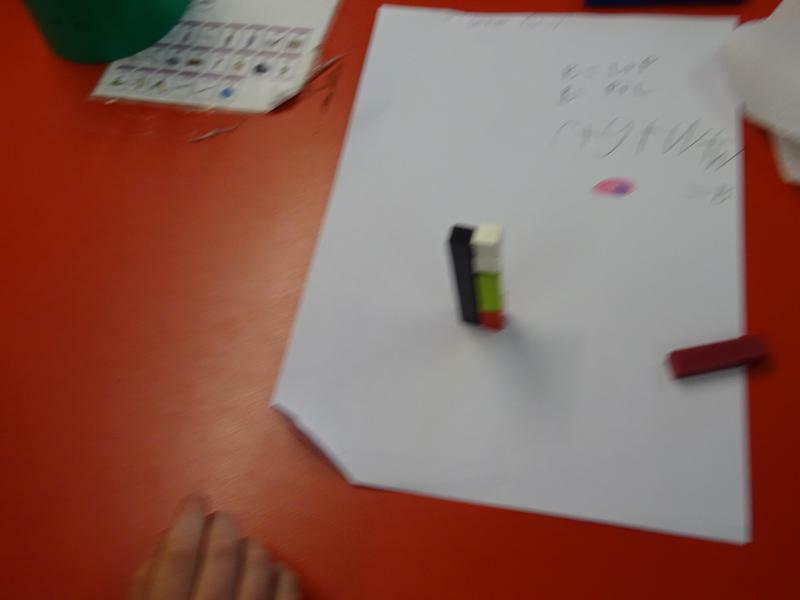 We found that Part+Part=Whole and Whole-Part=Part. 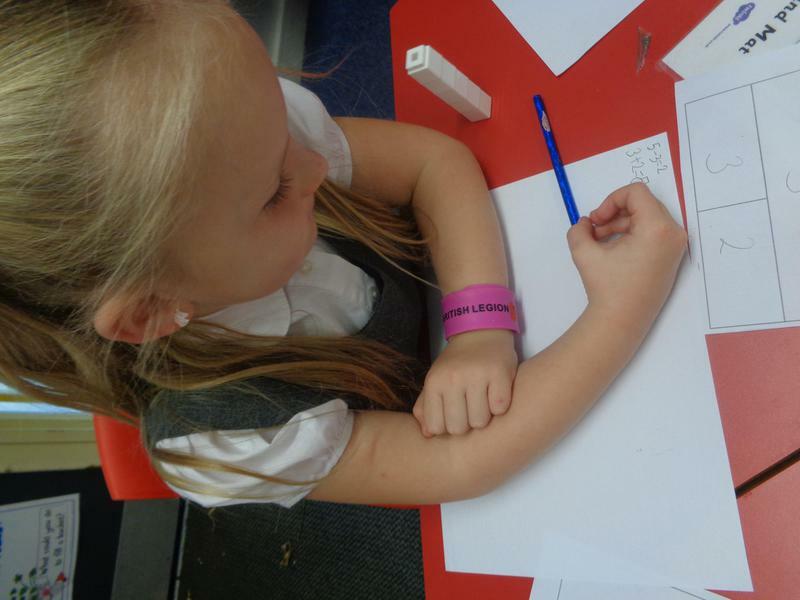 Through investigating we discovered that there were four calculations we could write for each complete part part whole model. 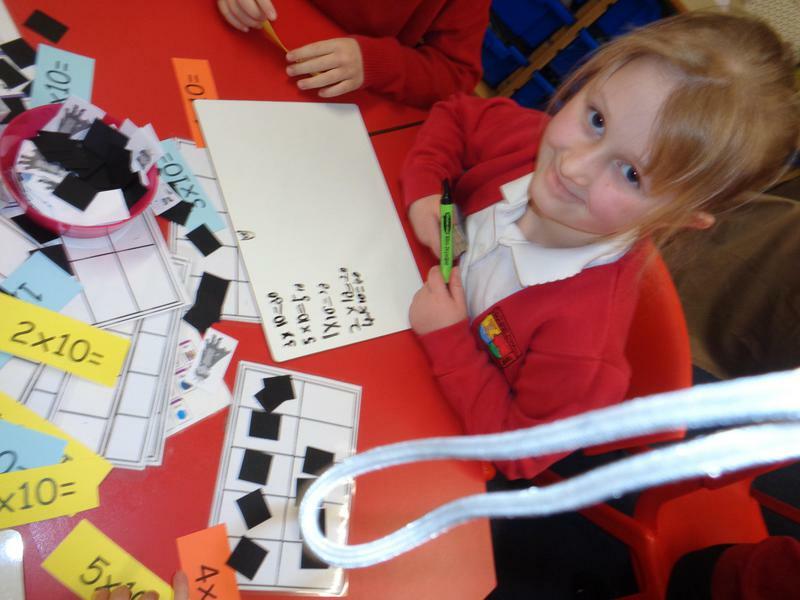 We are doing a history of maths week across school. 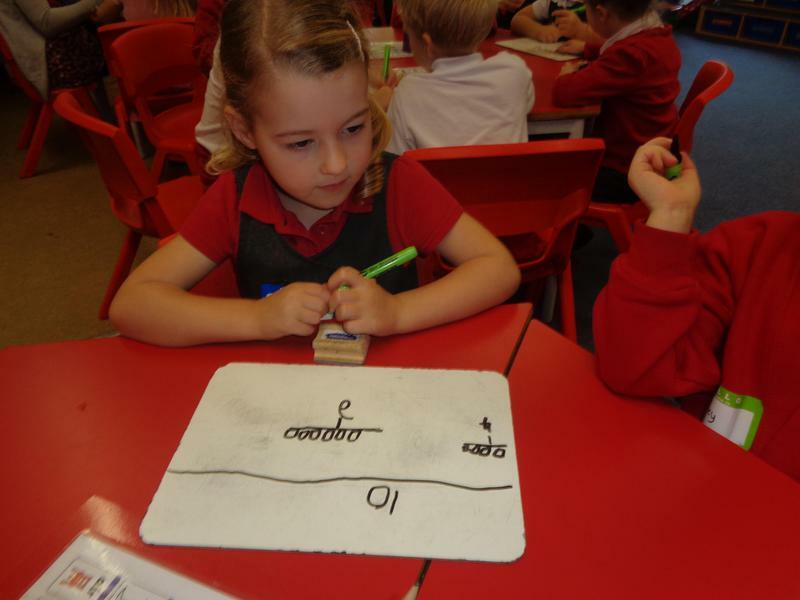 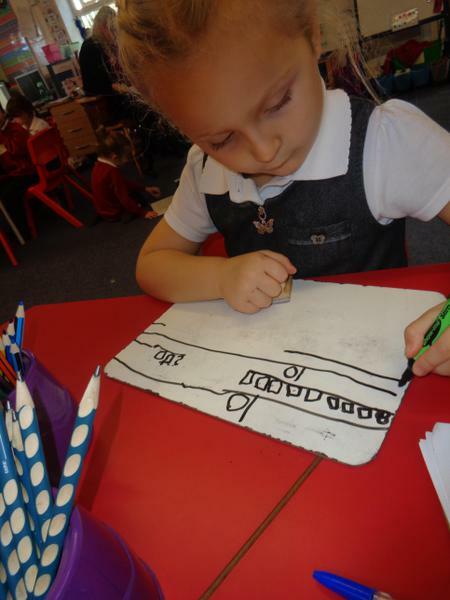 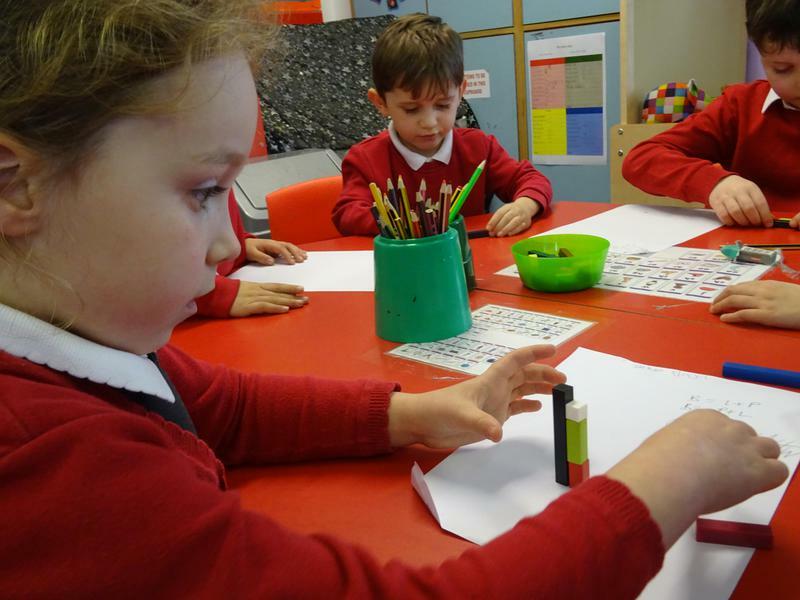 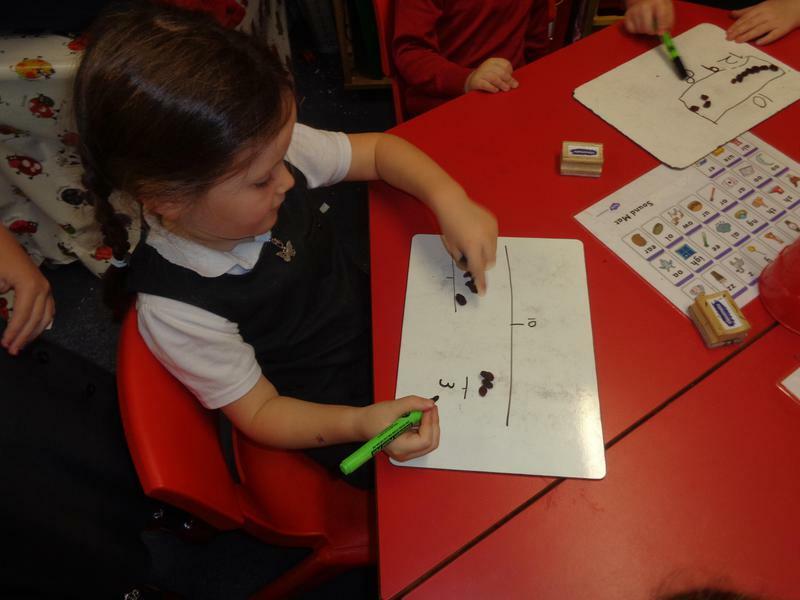 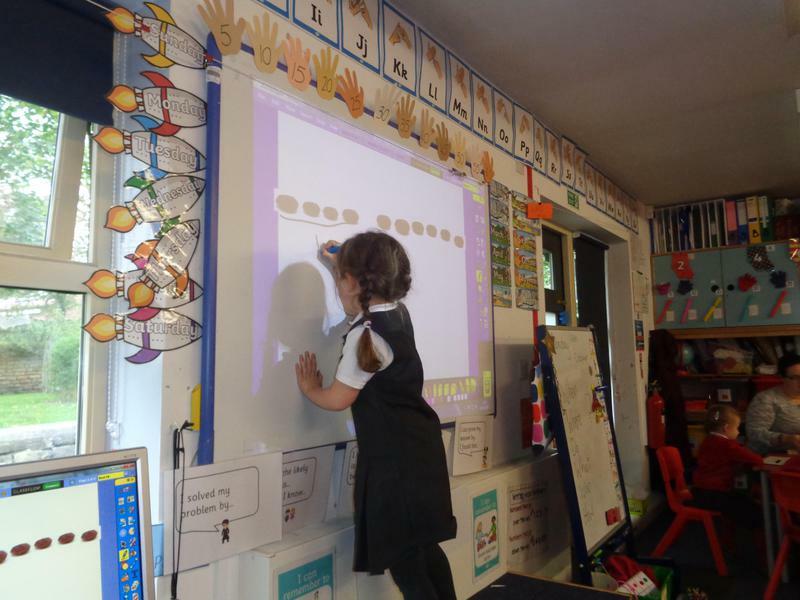 Year One decided to look at how numbers began. 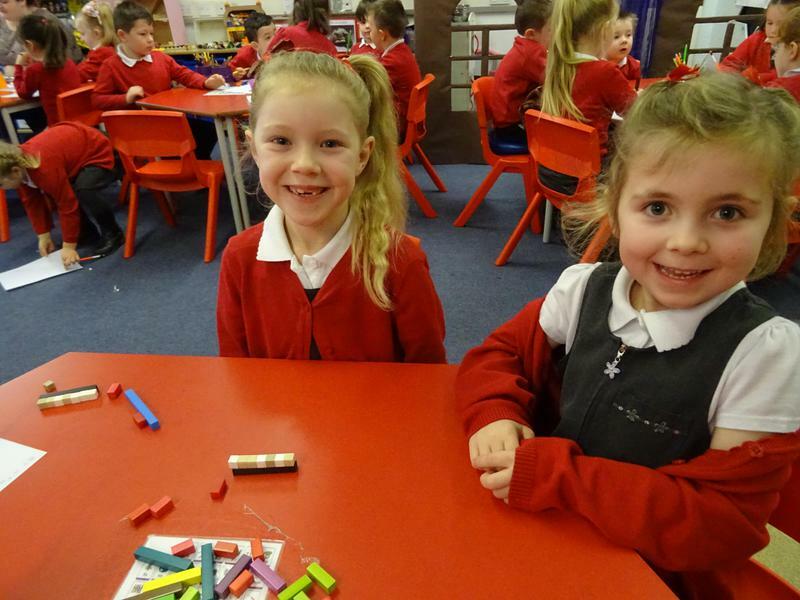 Why are they important? 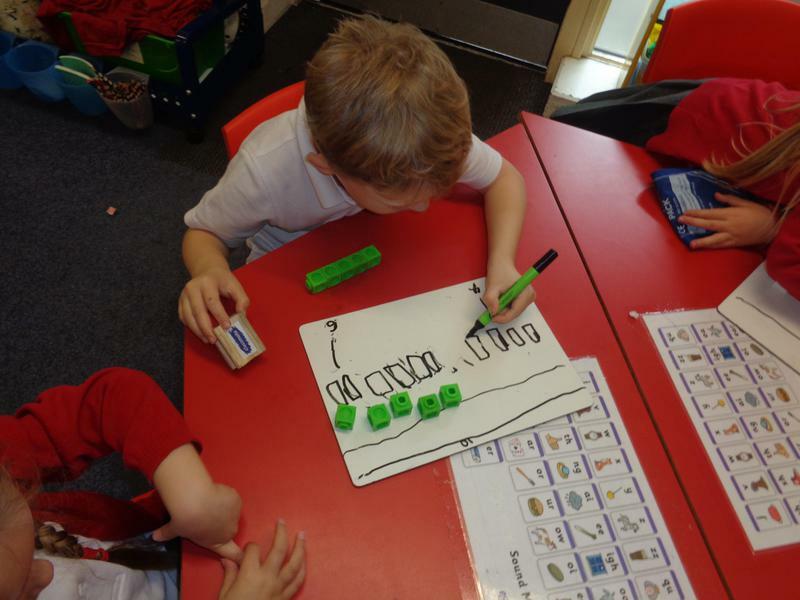 What would happen if we didn't have numbers and couldn't count? 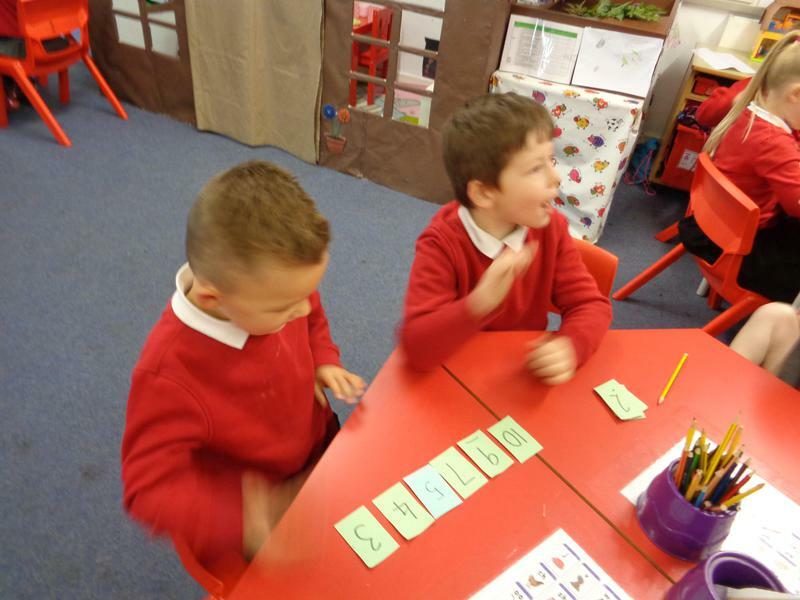 We thought about how we use numbers to measure time and so we couldn't have birthdays or Christmas. 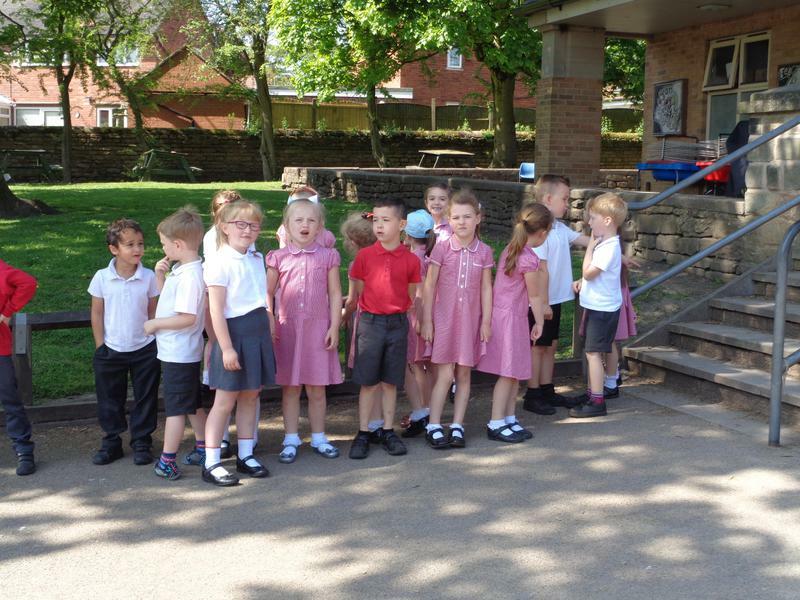 We wouldn't know how old we were or how long until dinner. 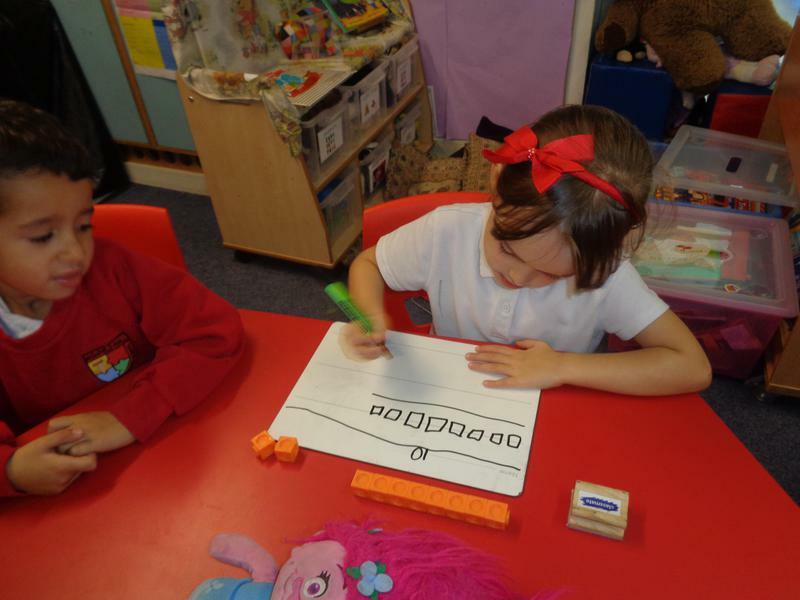 There are so many things we use numbers for; maths is part of everything we do! 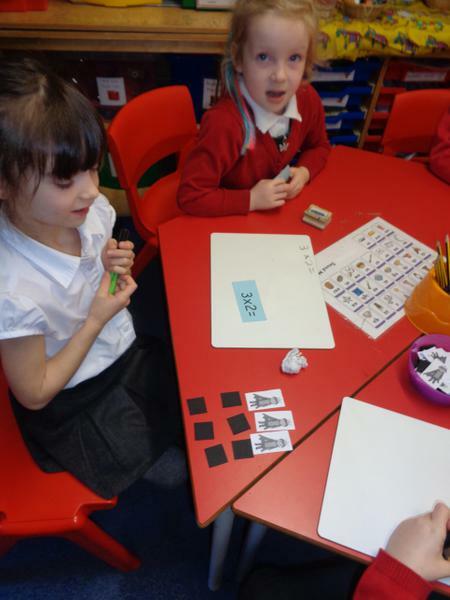 There were times long ago in history where numbers didn't exist and we thought about how people would have managed. 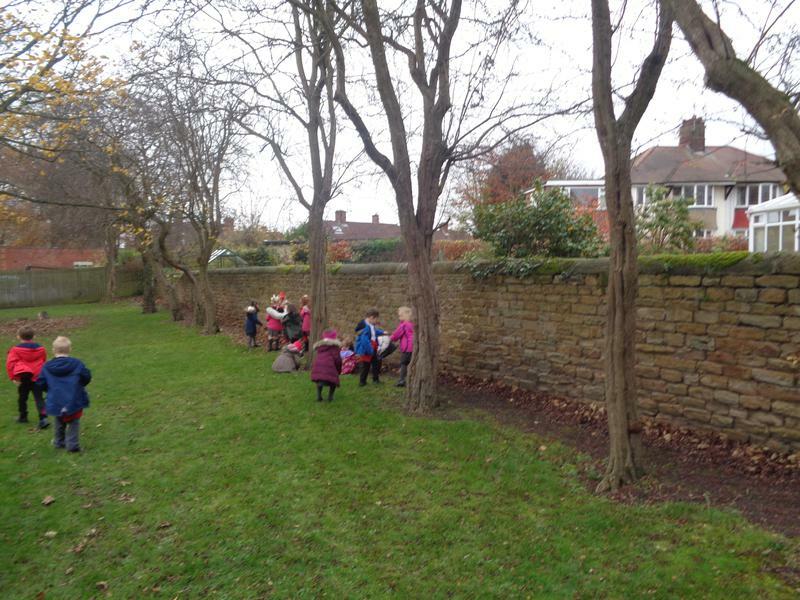 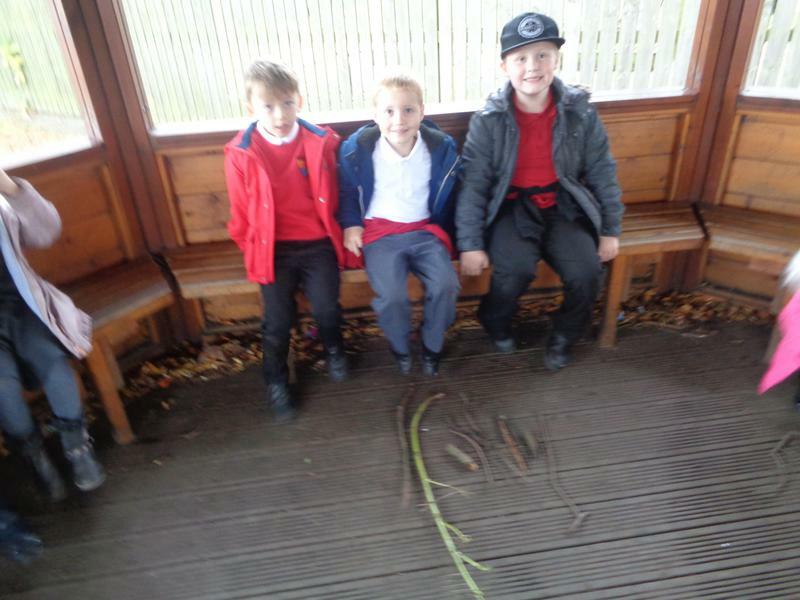 We went outside to gather sticks to make a fire. 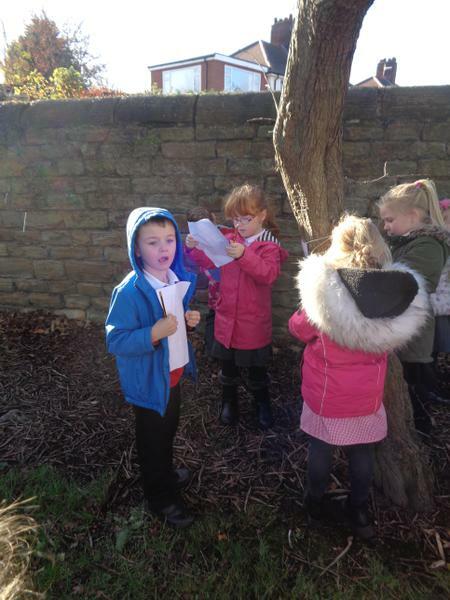 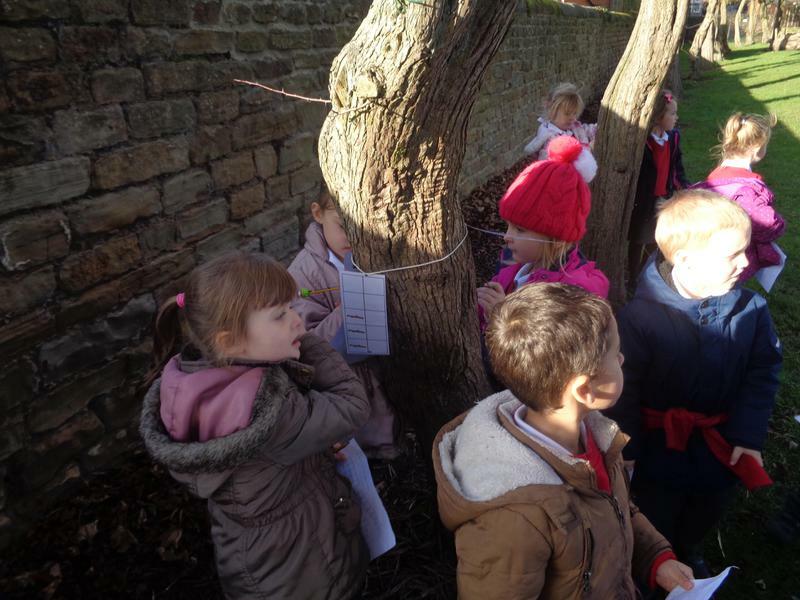 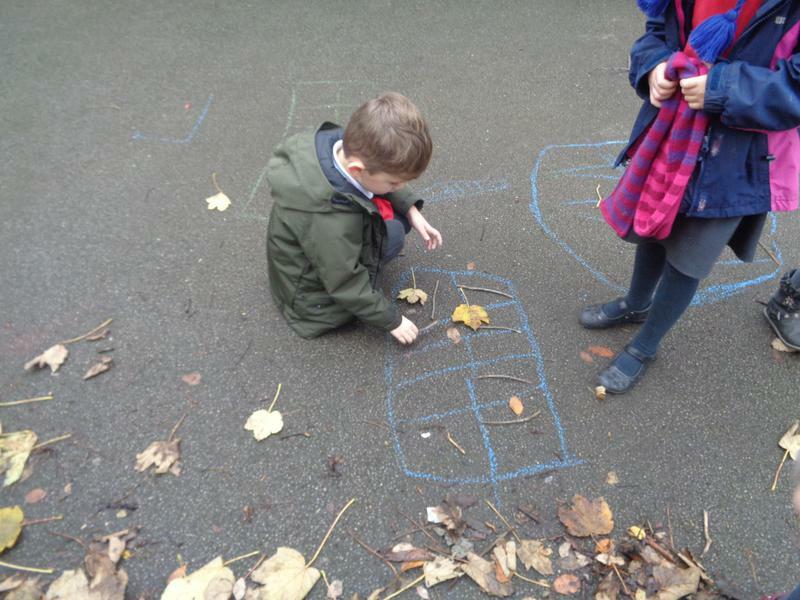 Mrs Jones told us to gather sticks but couldn't tell us when we had the right amount as numbers didn't exist. 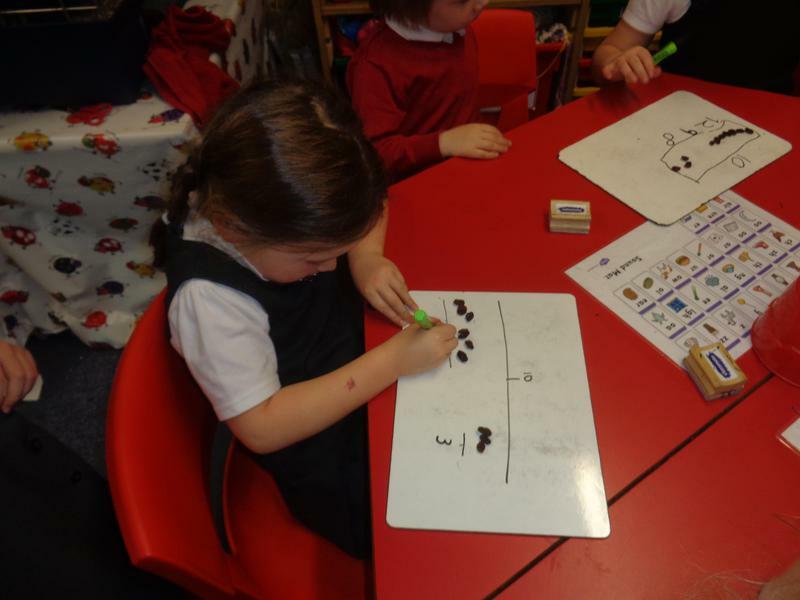 Cavemen simply knew when they had 'enough' so Mrs Jones could only say if we had enough, too many or too few. 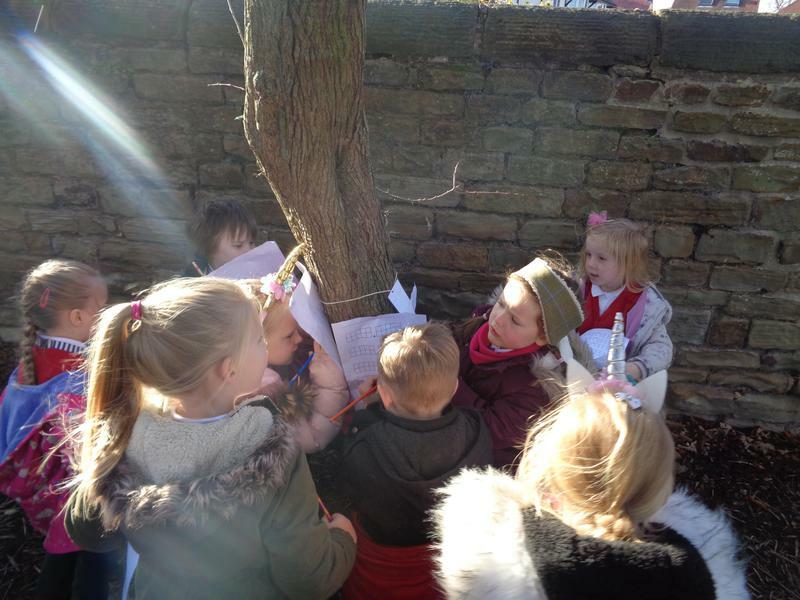 Eventually we all had enough sticks to make the perfect fire. 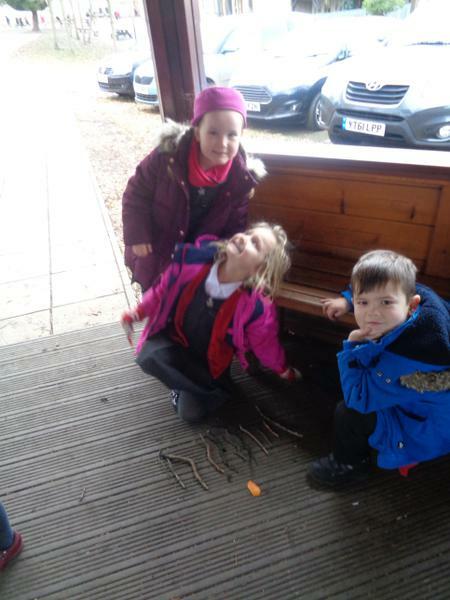 It took a very long time for everyone to gather just the right amount of sticks because we didn't have numbers. 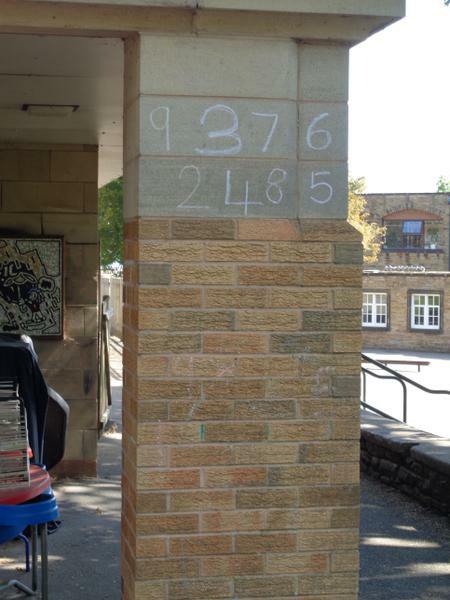 This really made us think about how important numbers are and why having a common system is valuable. 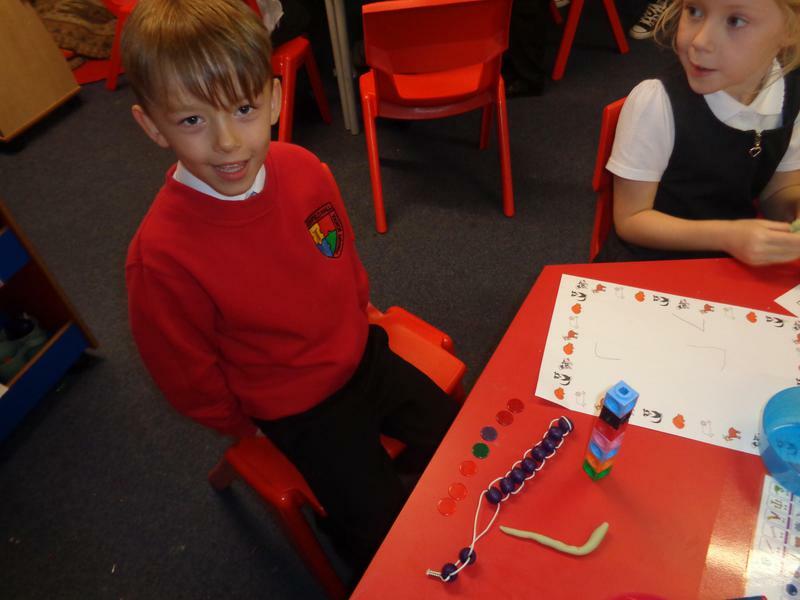 We also had lots of fun! 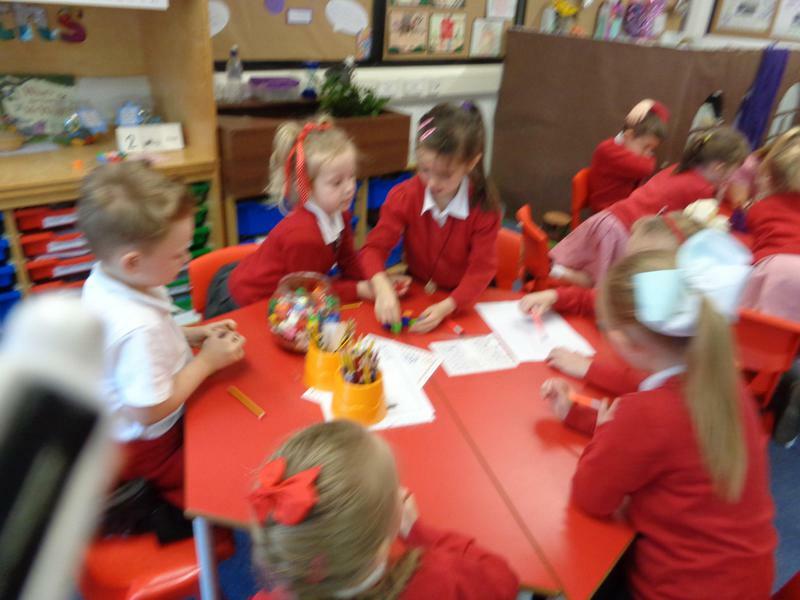 We compared our sticks with those our friends collected. 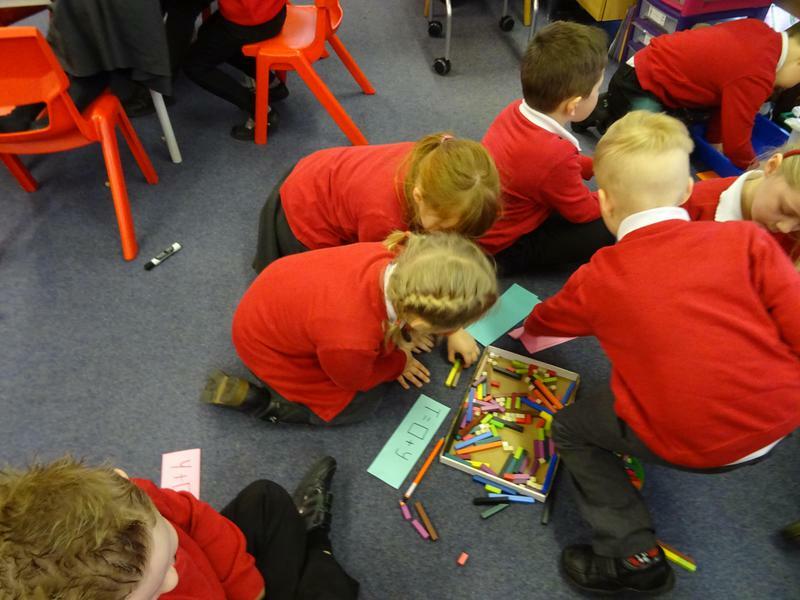 We found it difficult to compare accurately when we just put them in piles or in lines - it wasn't always easy to see who had more. 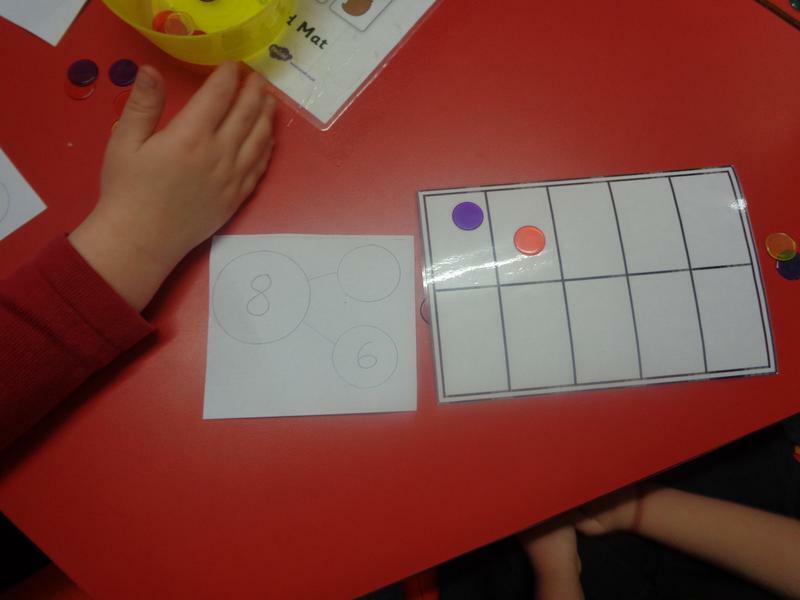 We thought we needed to use something to help us and decided ten frames would make it clearer. 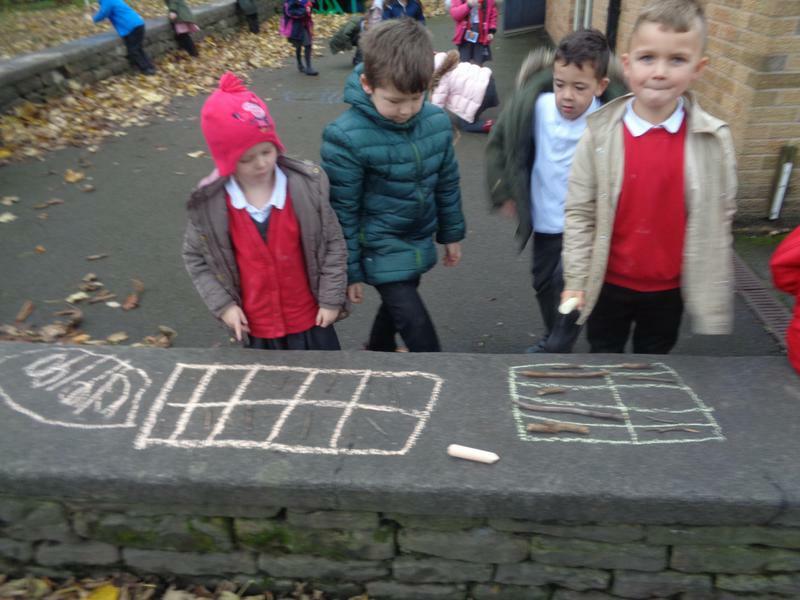 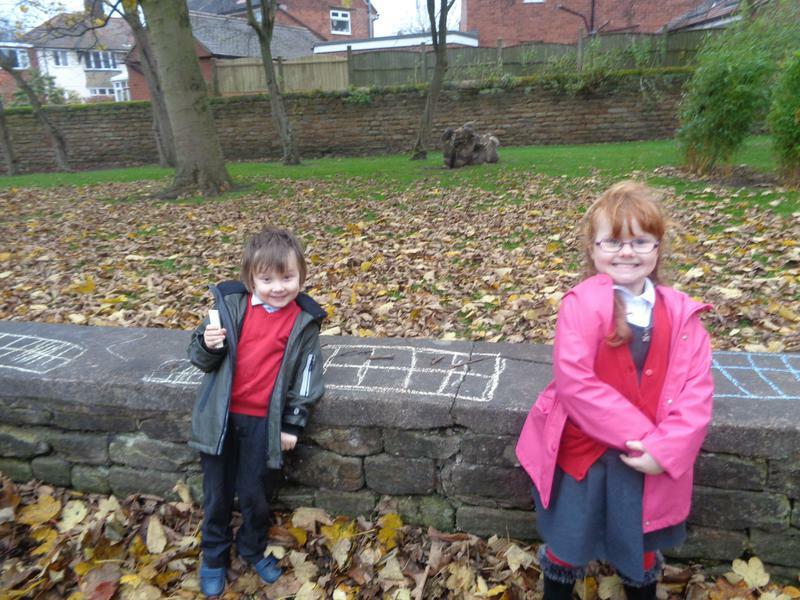 We used caveman stones (chalk) to draw our own ten frames and then placed our sticks in them. 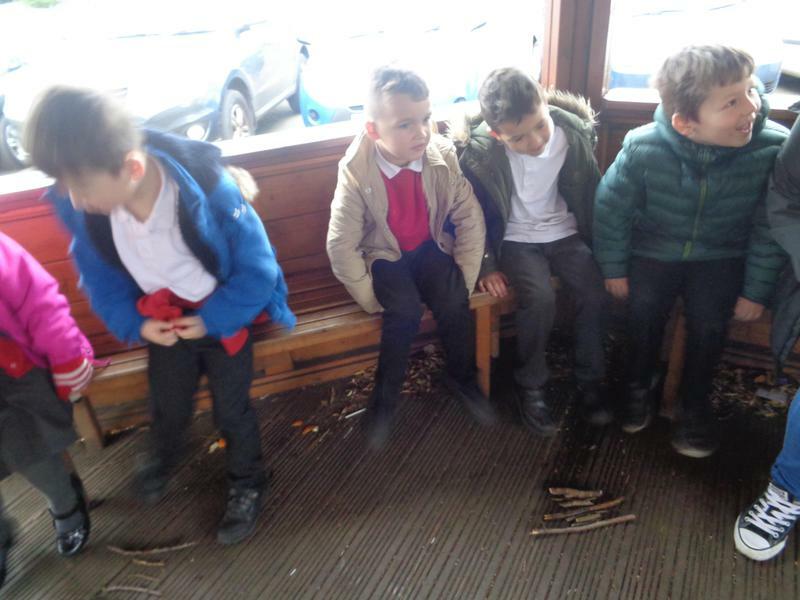 We then were able to see who had more/fewer sticks to make their fire with. 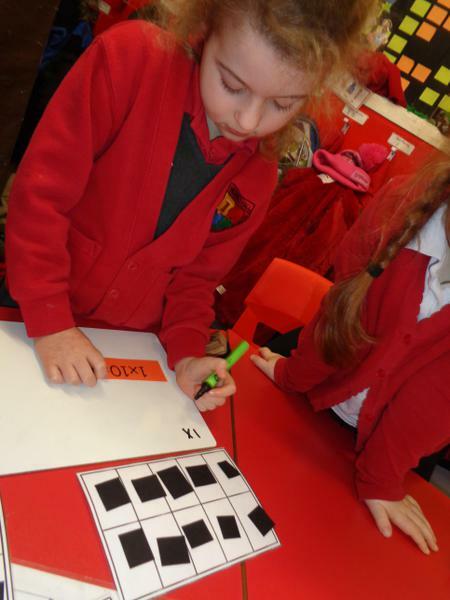 We were also easily able to subitize and could say how many we had each got. 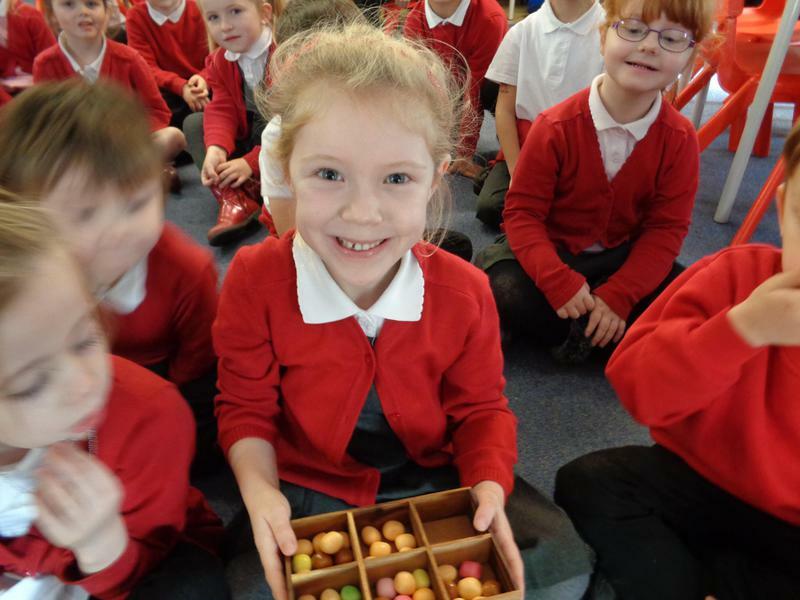 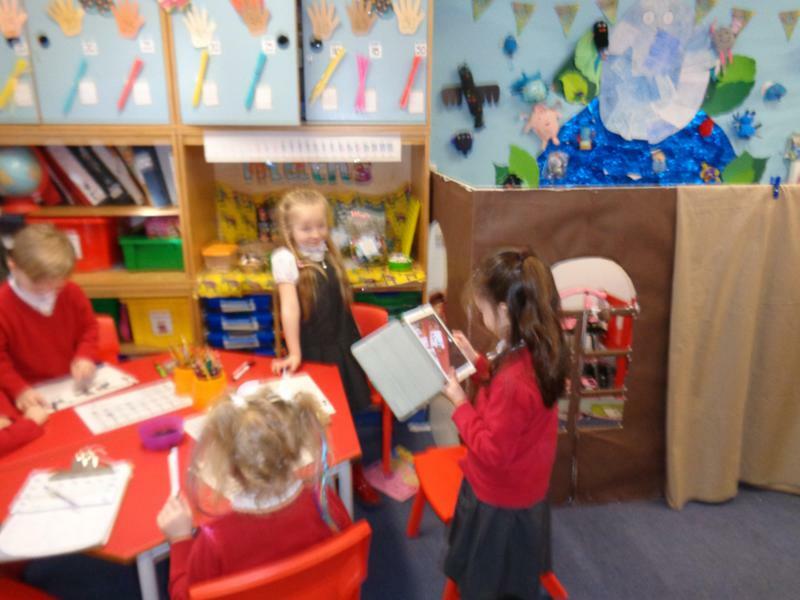 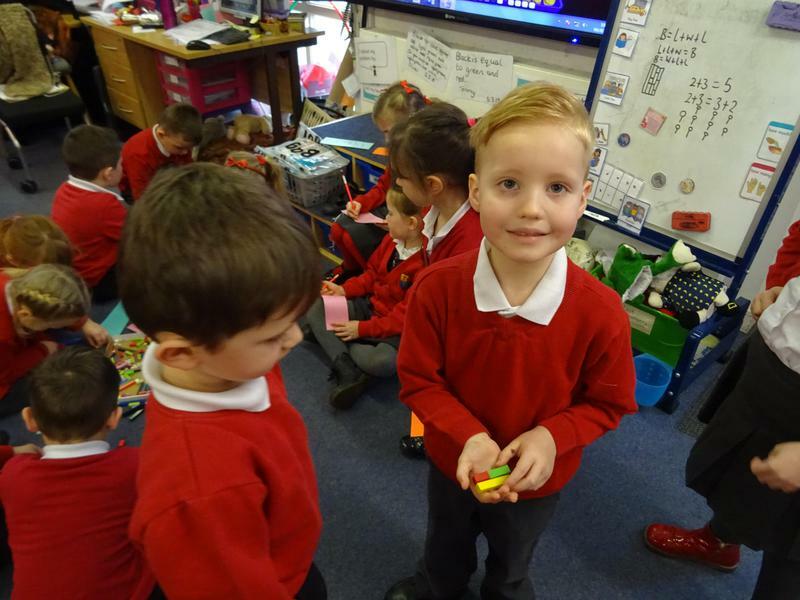 On Thursday 23rd November, a strange thing happened...a box mysteriously appeared in our classroom. 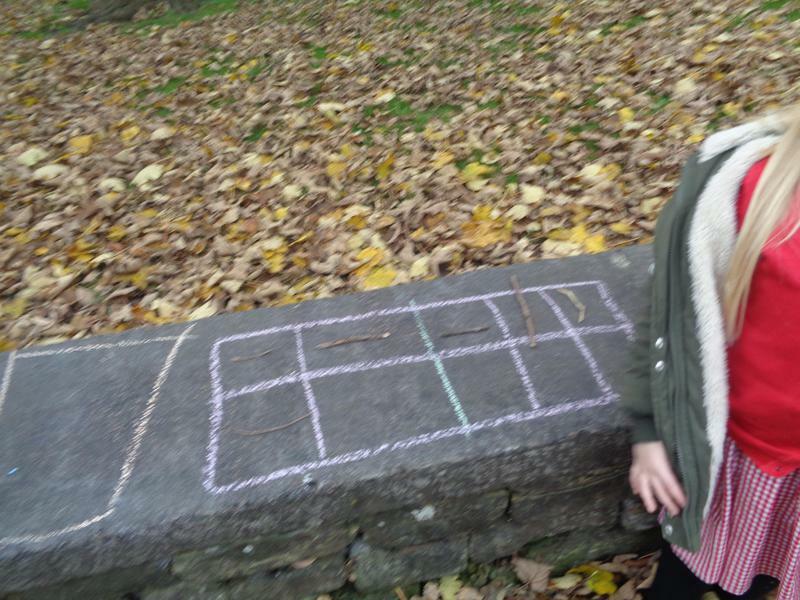 There were also sticks. 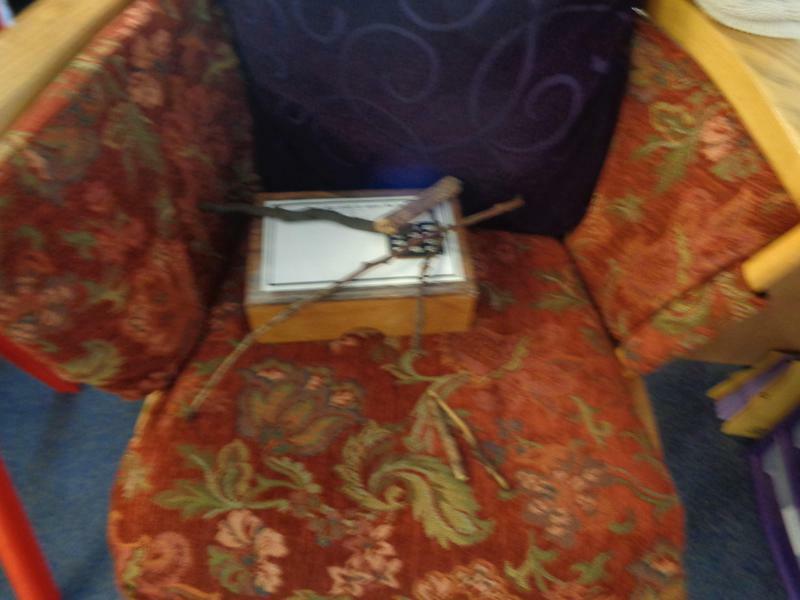 We think a caveman magically left a challenge for us. 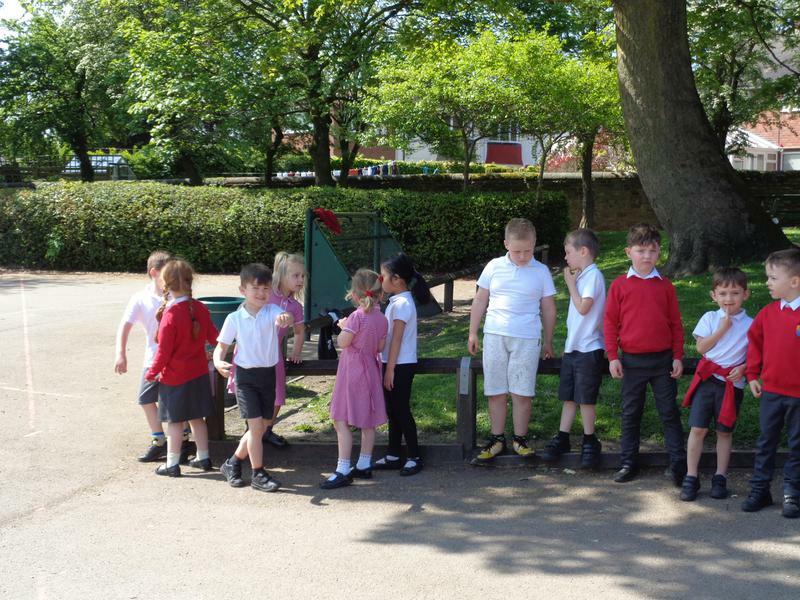 We had to collect clues and find a code to open the locked box. 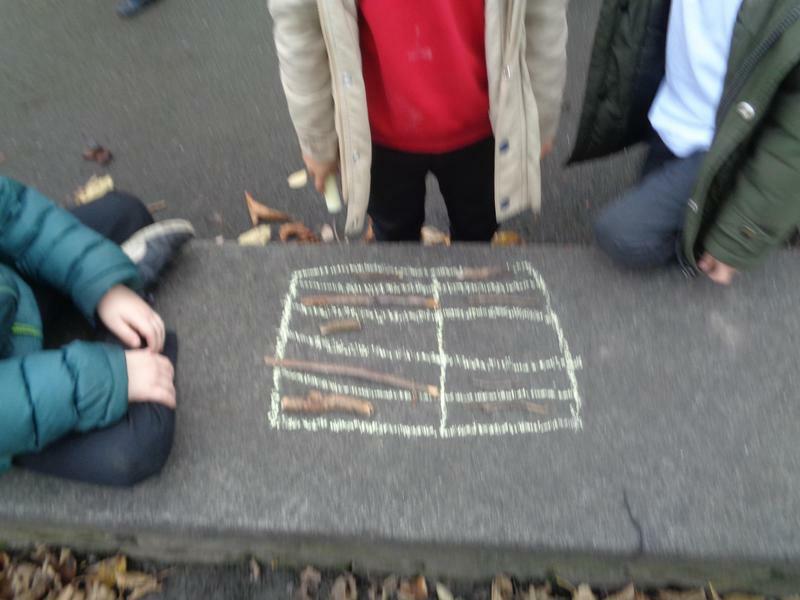 The caveman had left pairs of ten frames outside our classroom. 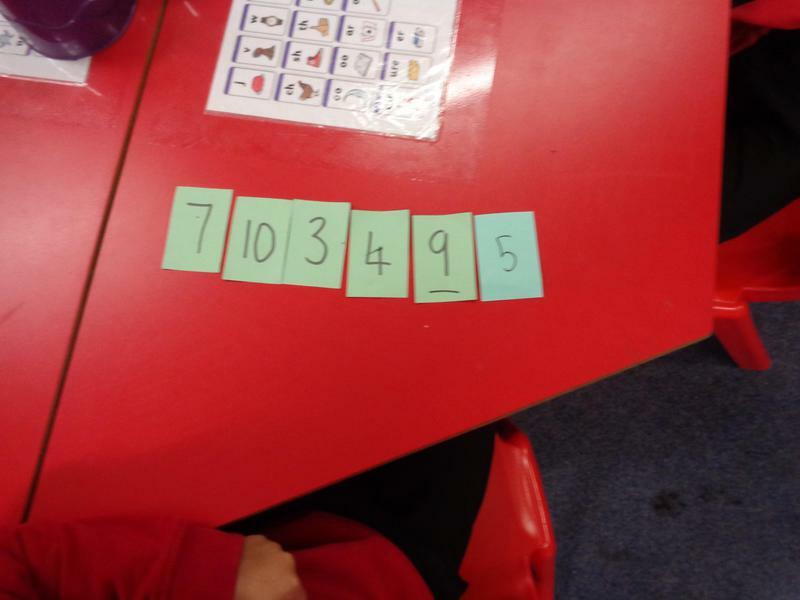 We used addition to create 6 numbers. 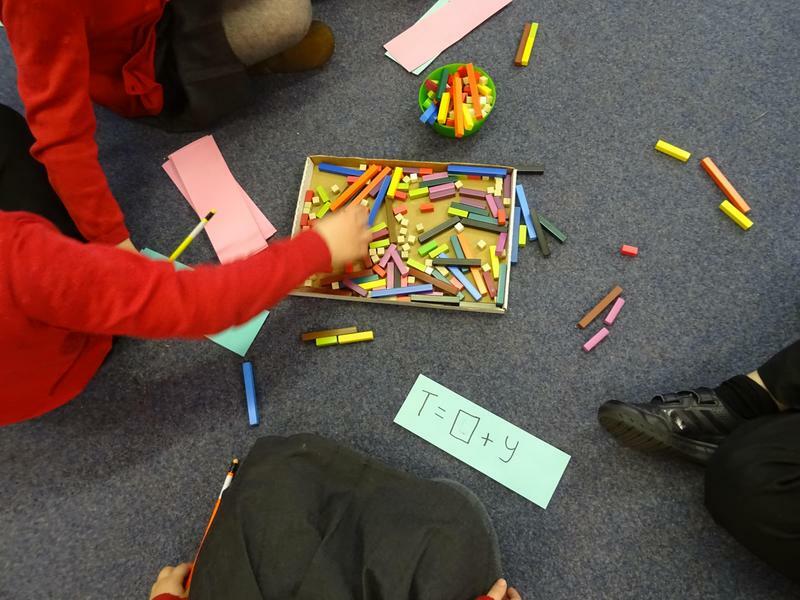 Once we had collected all the numbers we tried to open the box using the numbers in the order we found them but it didn't work. 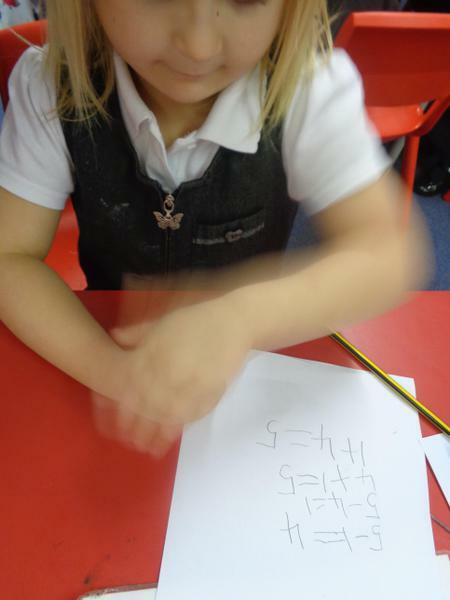 O suggested that maybe the numbers "have to be in a special order like on my mum's phone!" 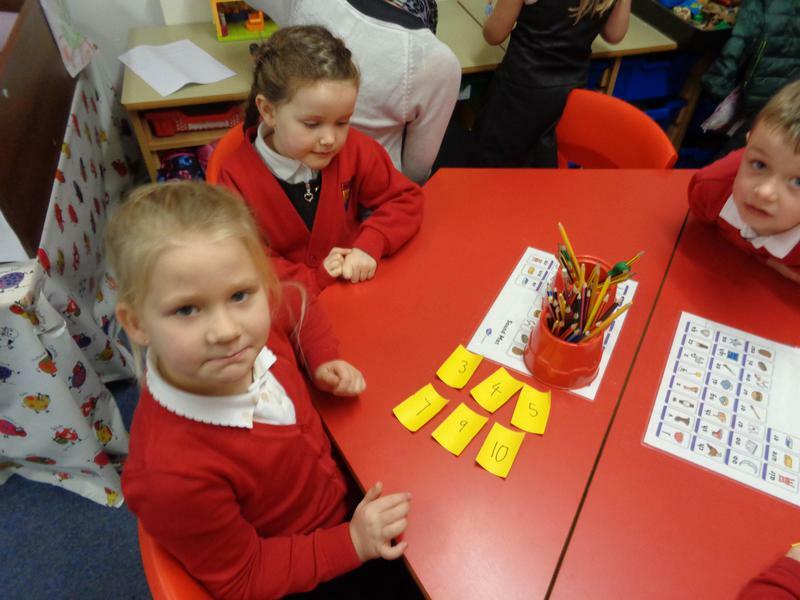 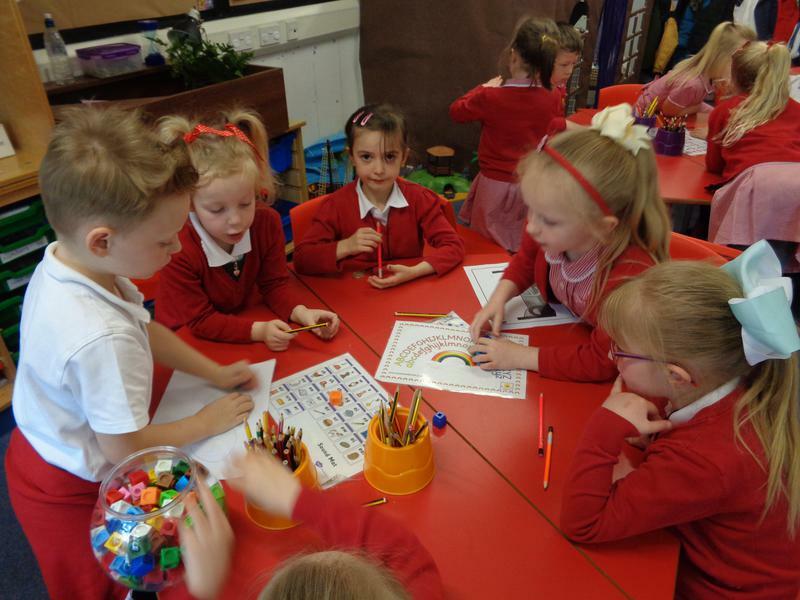 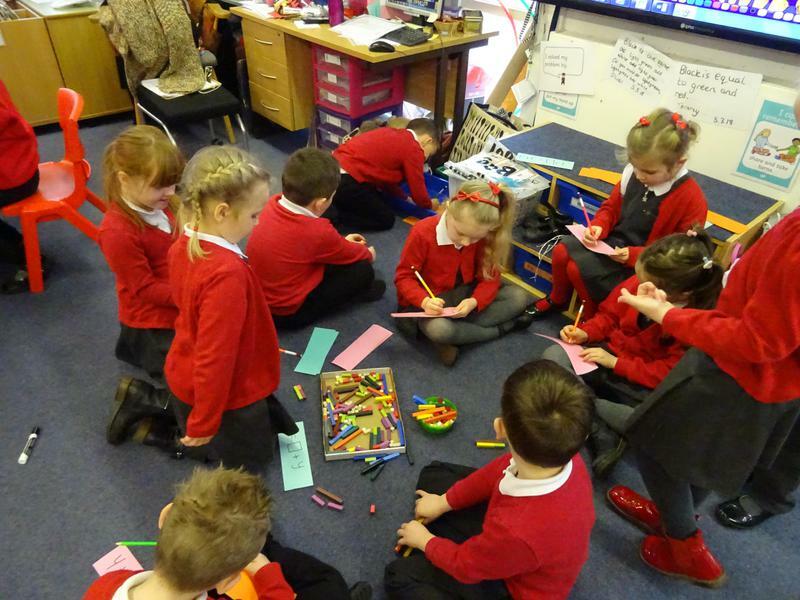 We all worked in teams to select the correct number cards and create a sequence to try. 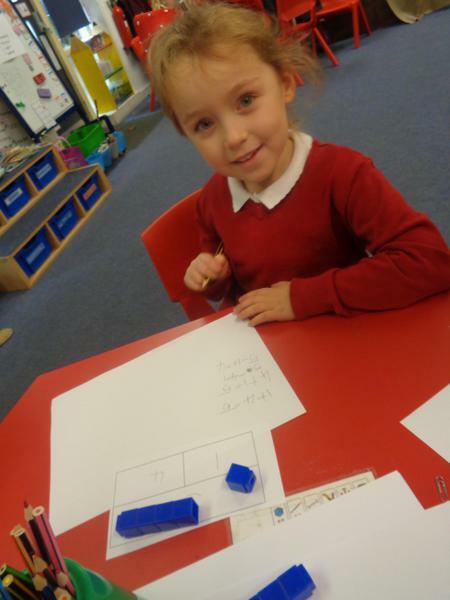 O said "I have put my numbers so they get smaller!" 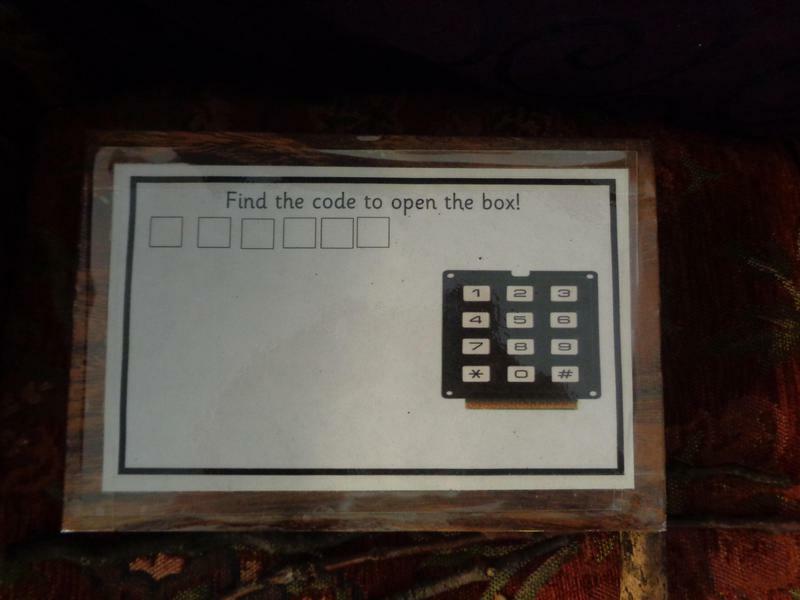 We tried this code and it didn't work. 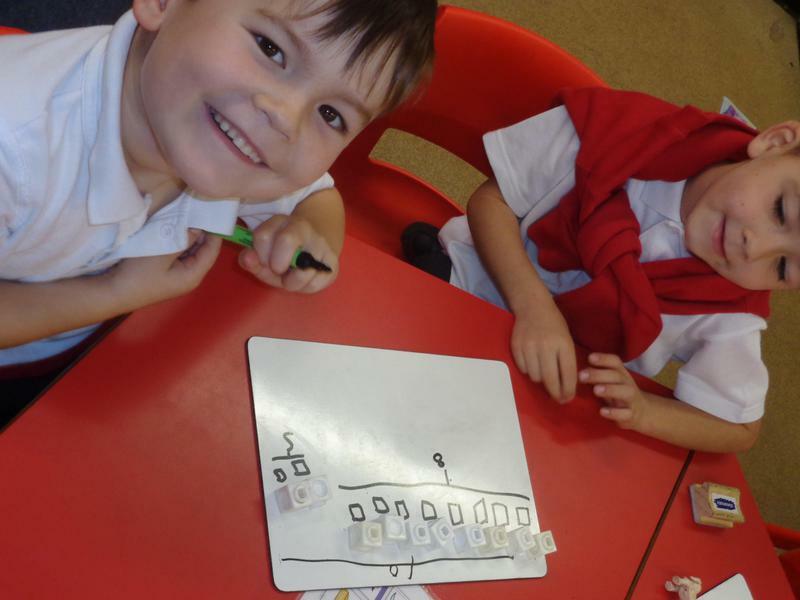 All the children then decided they would think about meaningful sequences and ordered their numbers from smallest to biggest. 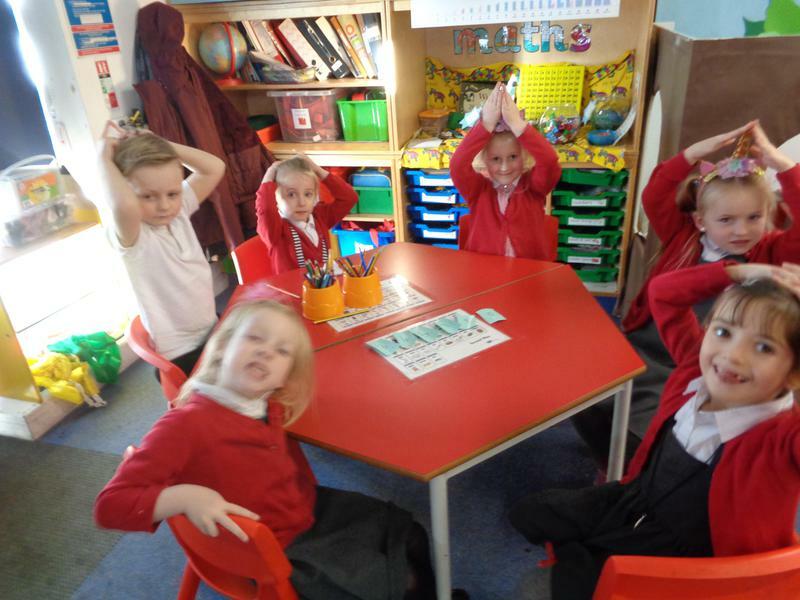 We all had the same code so we tried again and ... 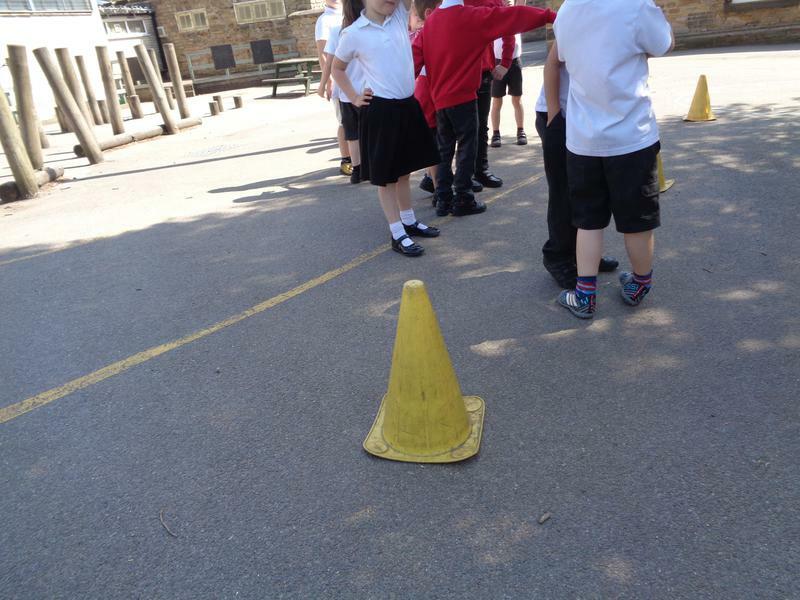 IT WORKED! 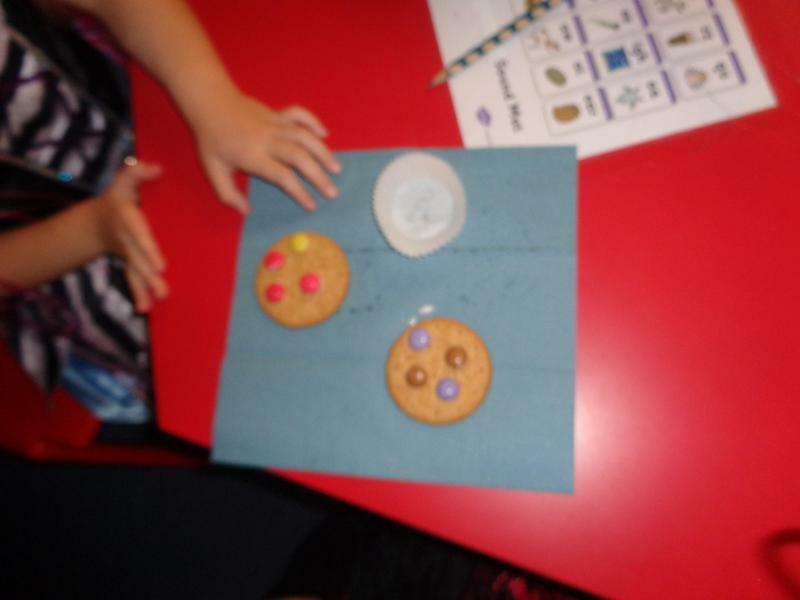 Inside was a cave painting and a sweet treat! 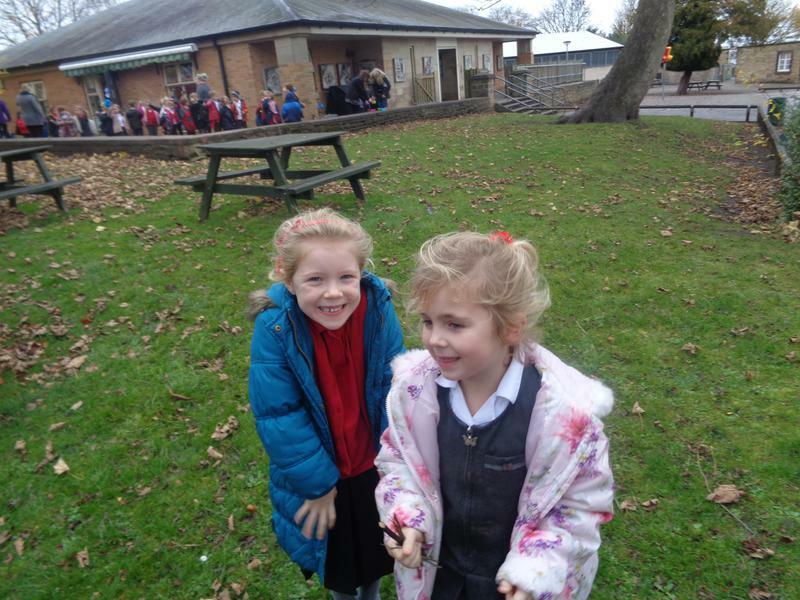 What an exciting day we had! 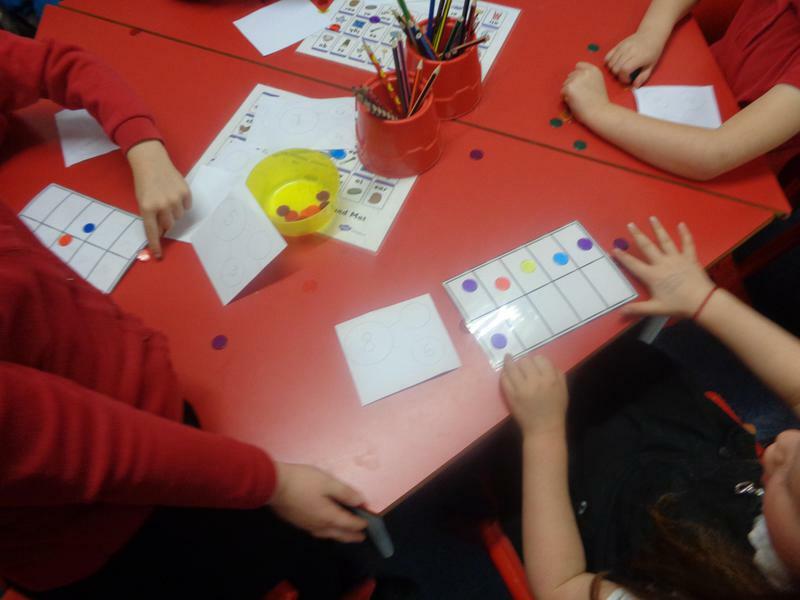 We started this term looking at number bonds to 10 to make sure we could remember and understand them. 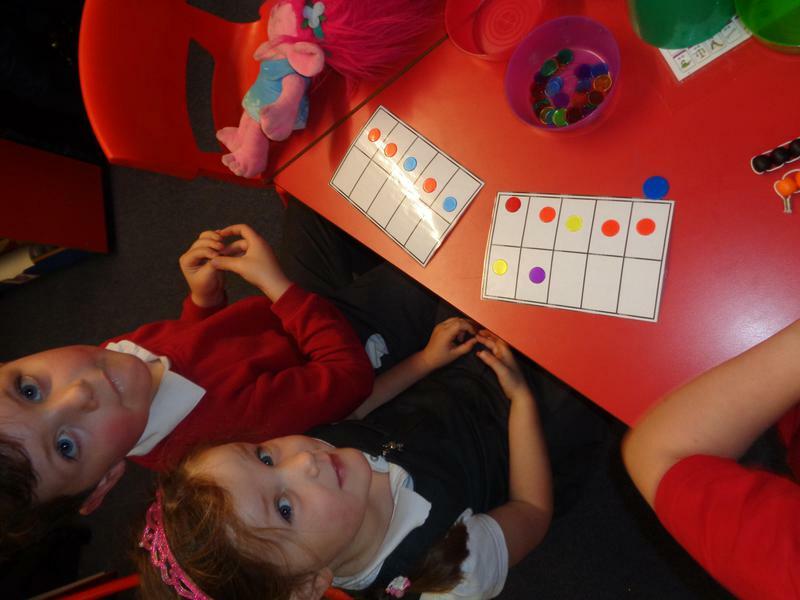 We did really well with this so we are now looking at number bonds to 20 and how we could work them out. 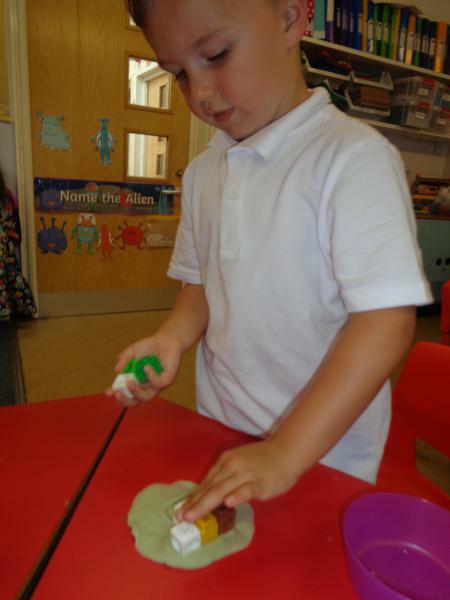 We did some investigating using materials we selected ourselves. 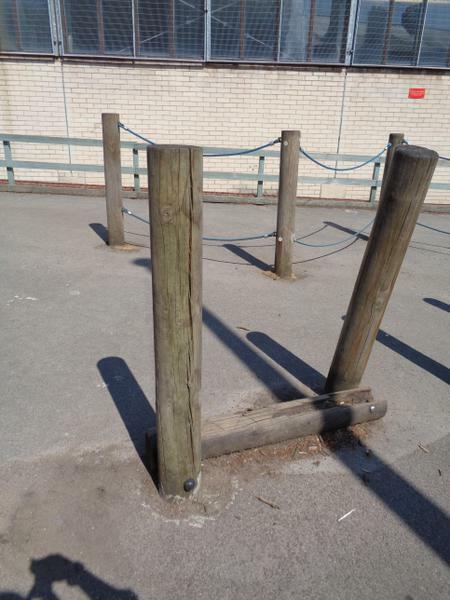 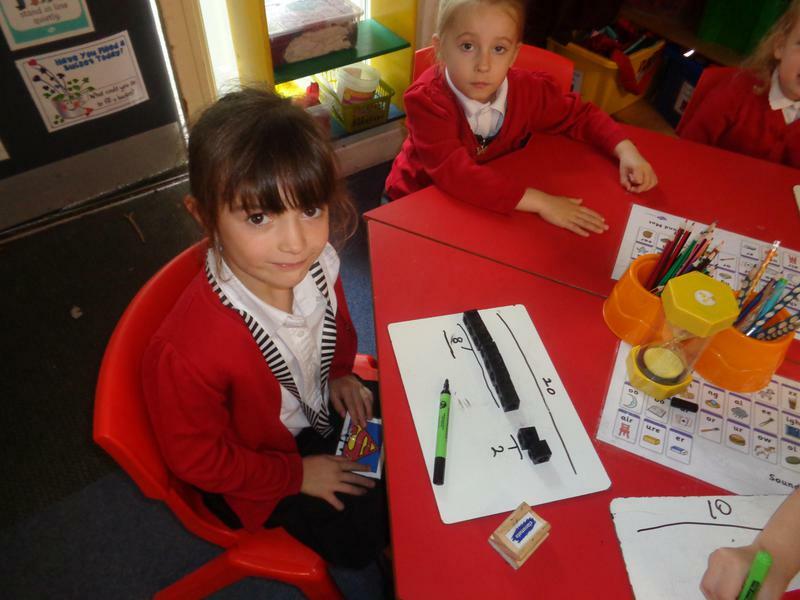 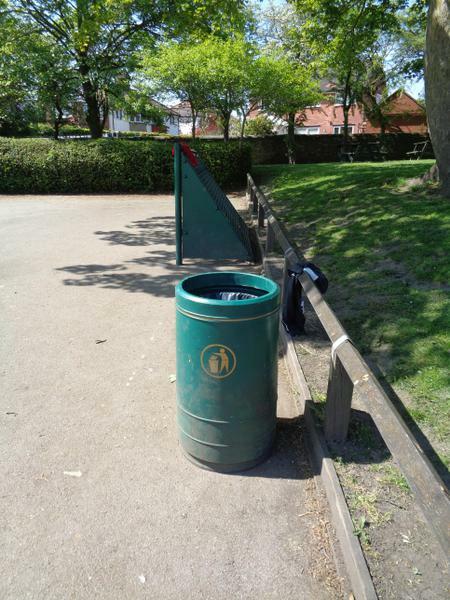 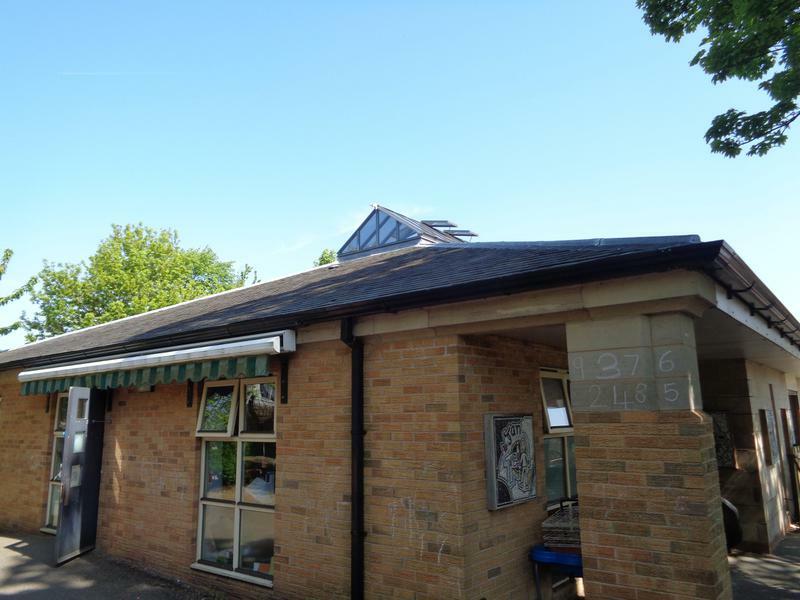 Some children chose to use unifix. 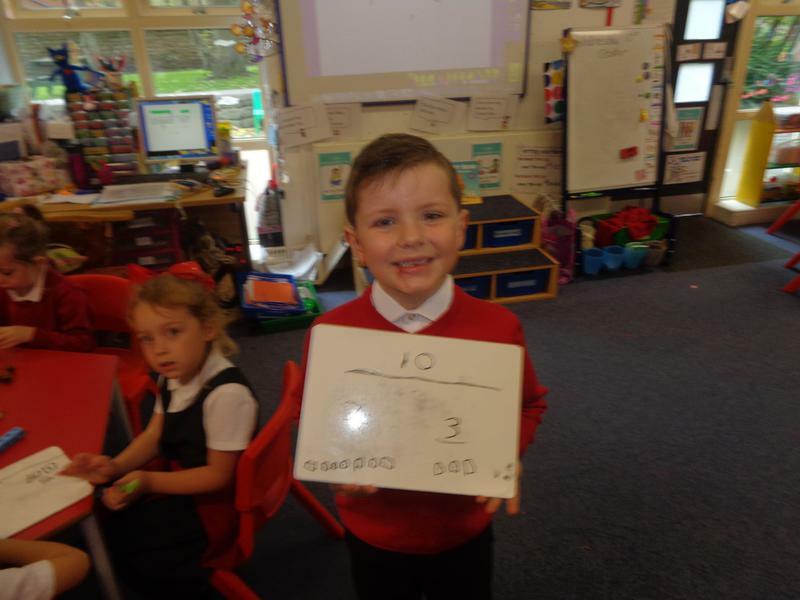 We knew we would need to have 2 sticks of ten as there are 2 tens in 20. 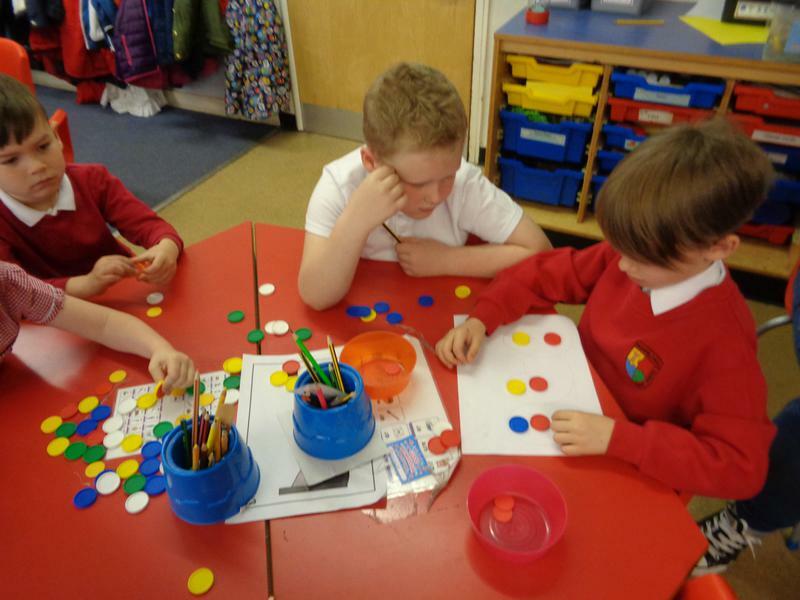 Most children knew how to work systematically to find all the possible ways of making 20 using 2 numbers. 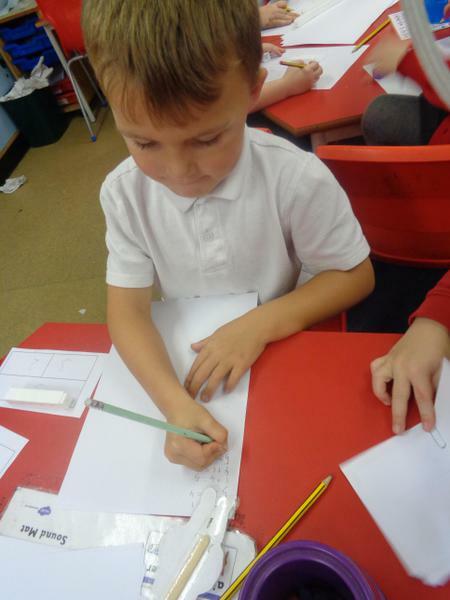 We even asked if we could have some paper to record so we knew how many different ways there were. 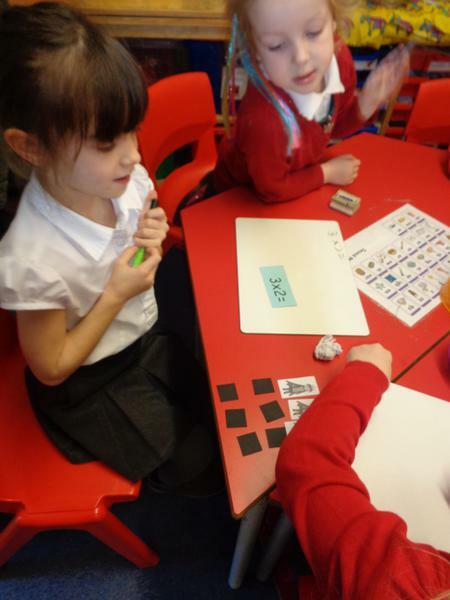 We are Maths Magicians! 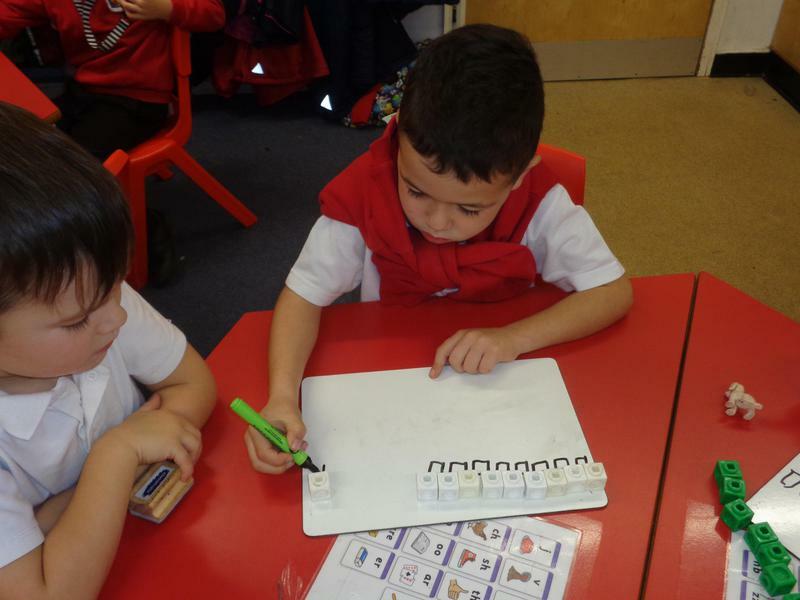 Throughout Spring 1, year one have spent a great deal of time working on counting in steps of 2, 5 and 10. 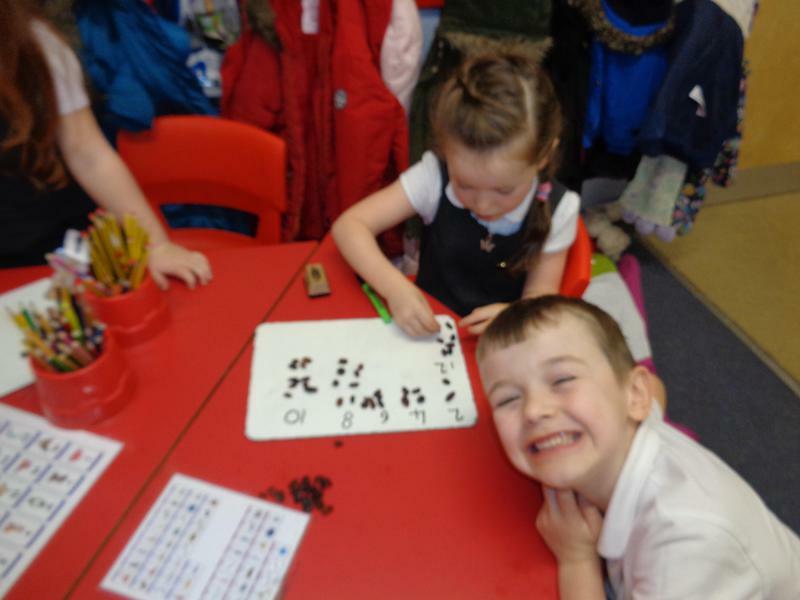 To provide a purpose for this learning we have been looking at multiples and groups of 2, 5 and 10. 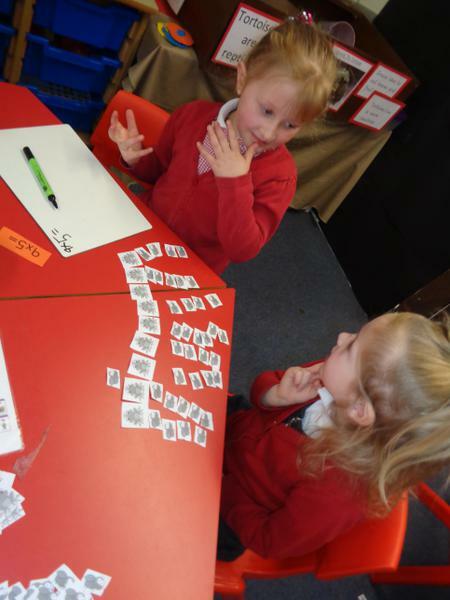 We have done this in a very practical way and linked to our topic of fairy tales when solving problems and reasoning. 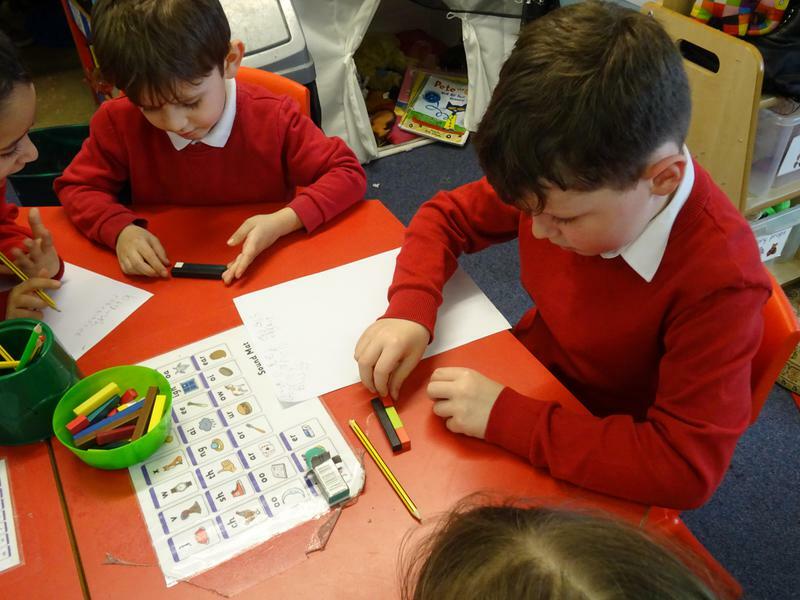 After being able to understand the role of equals and being able to find equivalent values using different colours of Cuisenaire rods, we started thinking about how to make the inventor's chocolate bars fair. 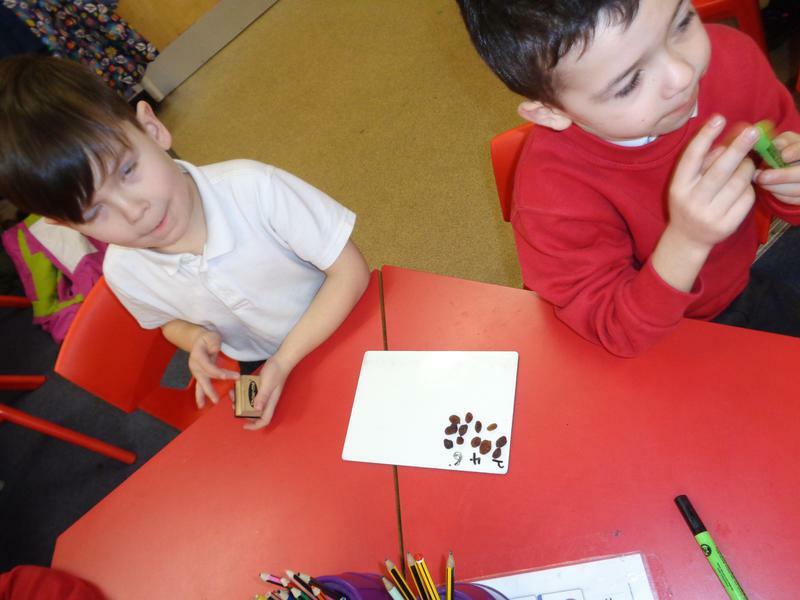 We decided we should make all the parts inside the chocolate bar the same. 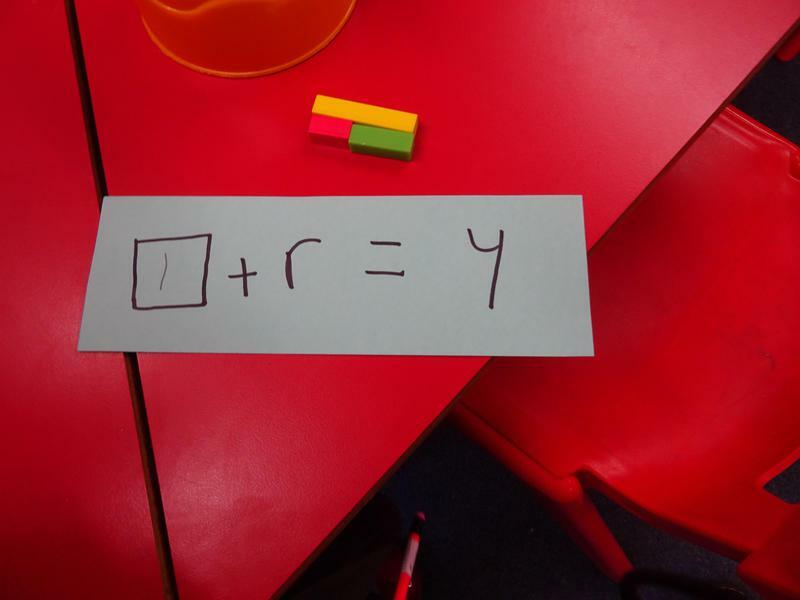 This means each part must be equal or exactly the same. 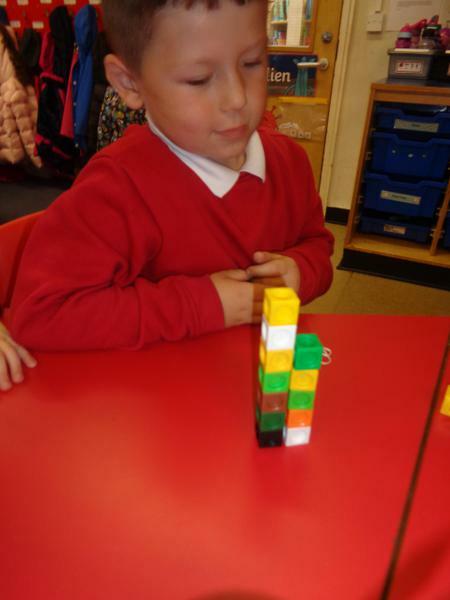 We thought about how we could do this and investigated what size the parts would have to be so that they were all equal and still equivalent to the whole bar when added together. 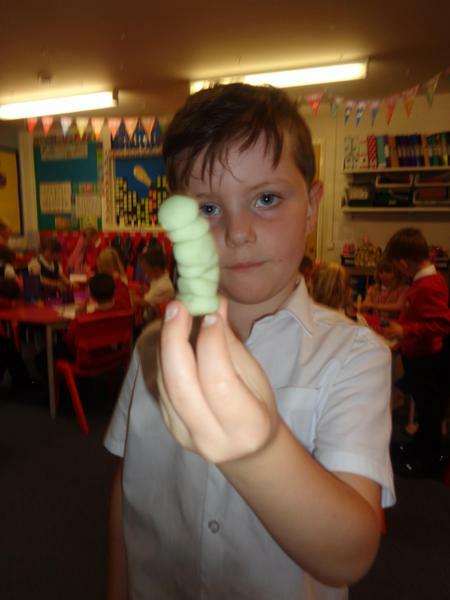 We tried this in lots of different sizes. 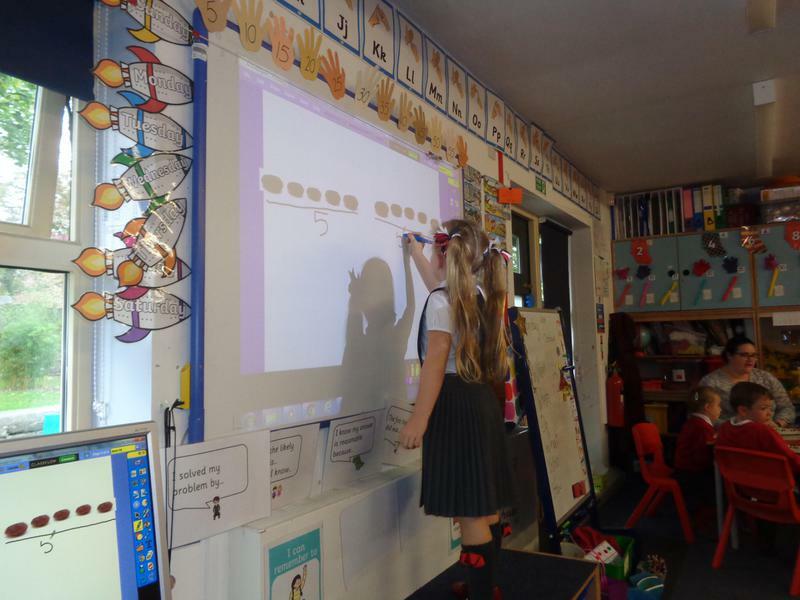 Mrs Jones says we all did this really well and are Marvellous Mathematicians! 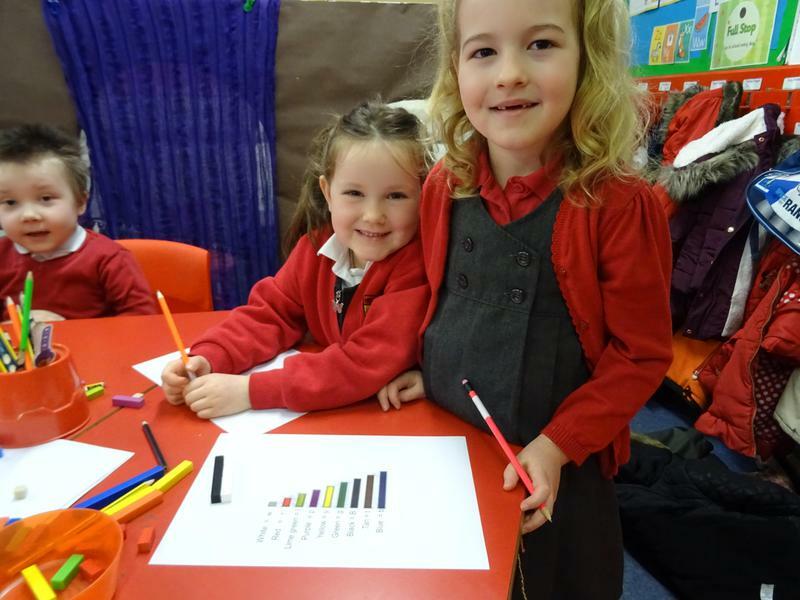 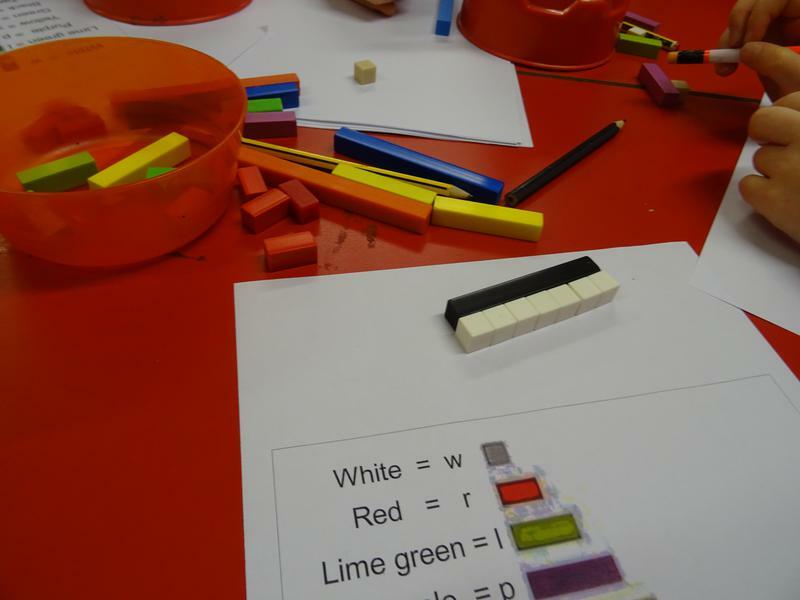 Some children also solved missing value problems using the Cuisenaire rods. 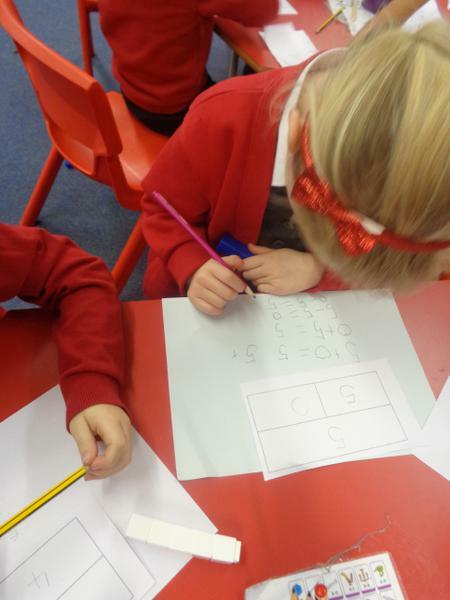 Children had to find the colour that was missing and prove their answers before writing their own problems. 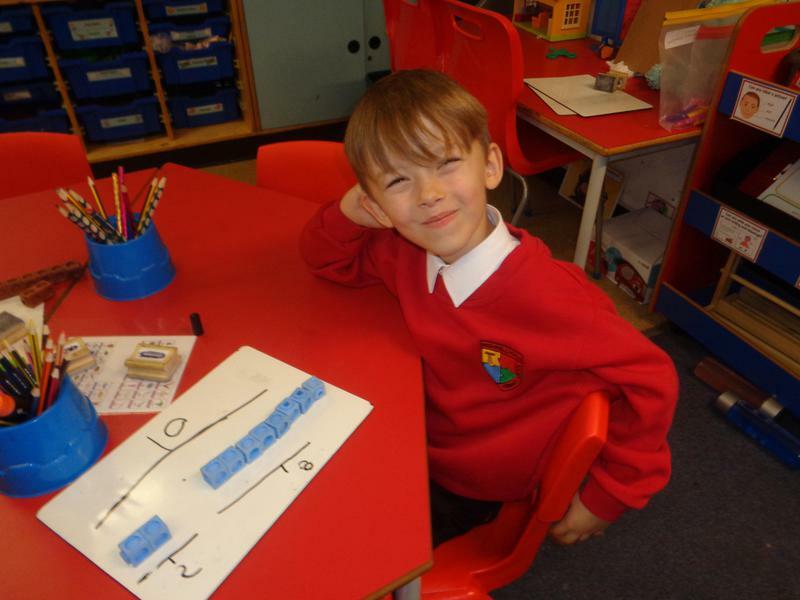 We have been learning about fractions. 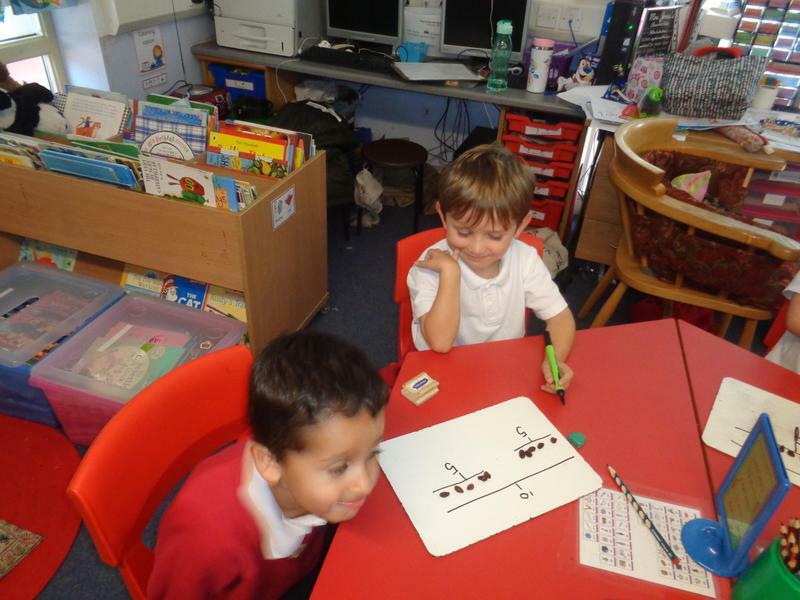 We know that 1/2 means we have to split something into 2 equal parts or groups. 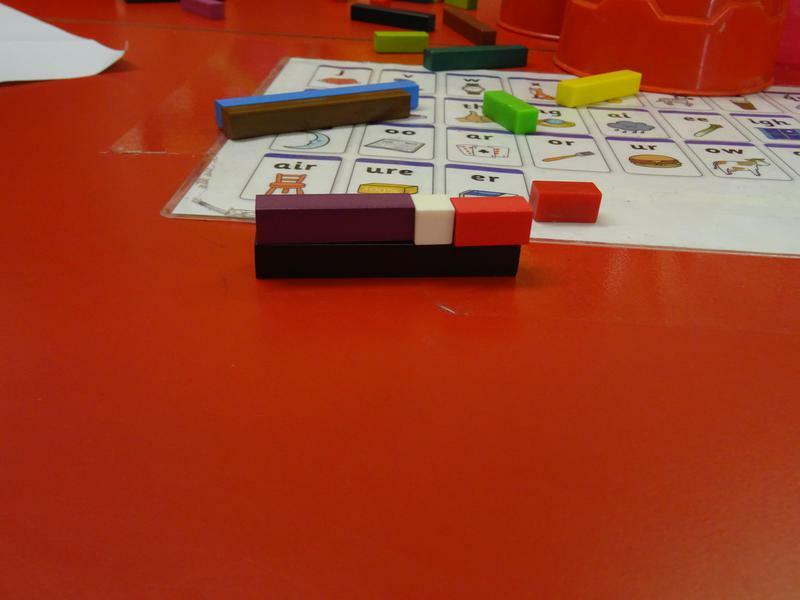 We know that 1/4 means we have to split something into 4 equal parts or groups. 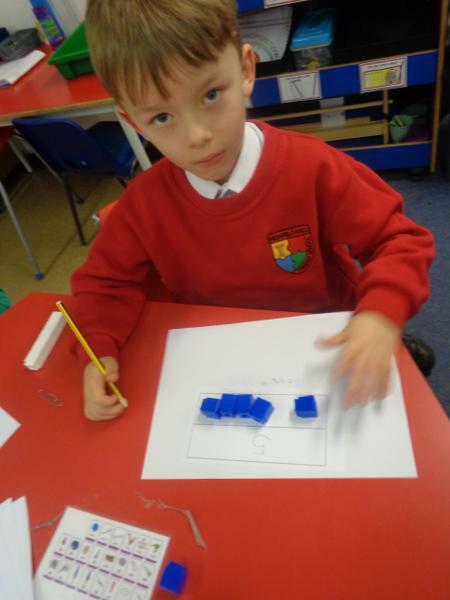 When we halved quantities we knew that we could put the counters into 2s and made arrays. 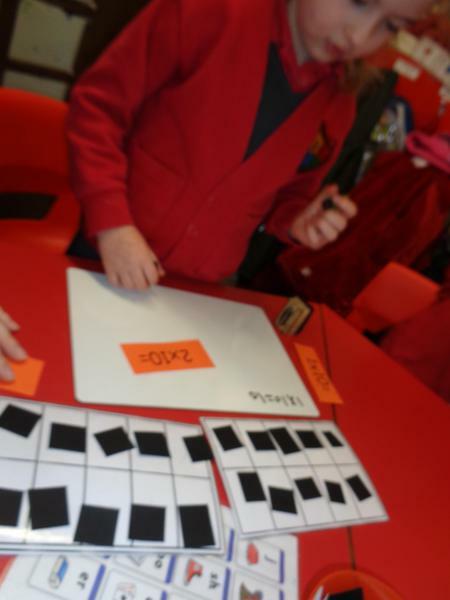 We then split the array in half to find how many were in each group. 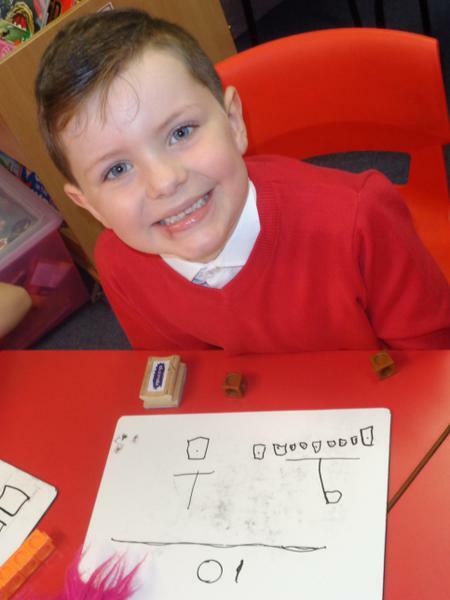 We enjoyed learning about fractions. 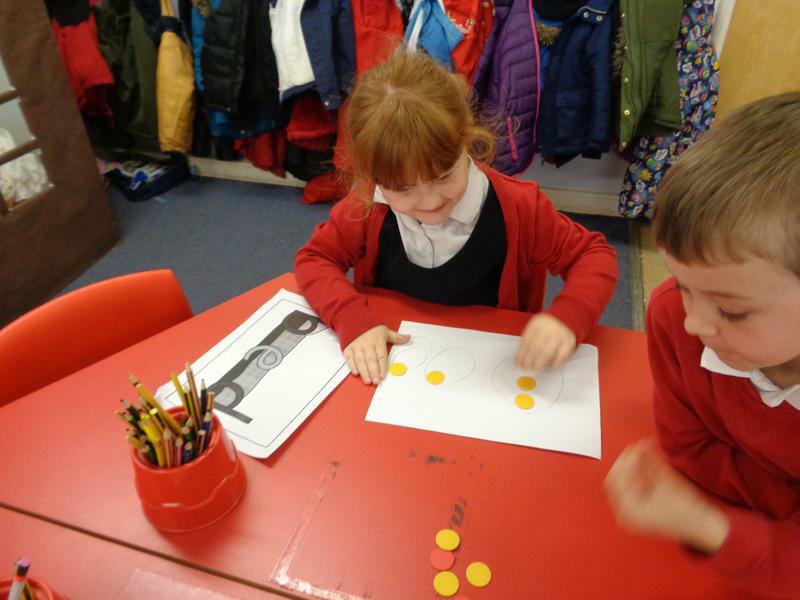 We have been thinking about doubling and halving, and how they are linked. 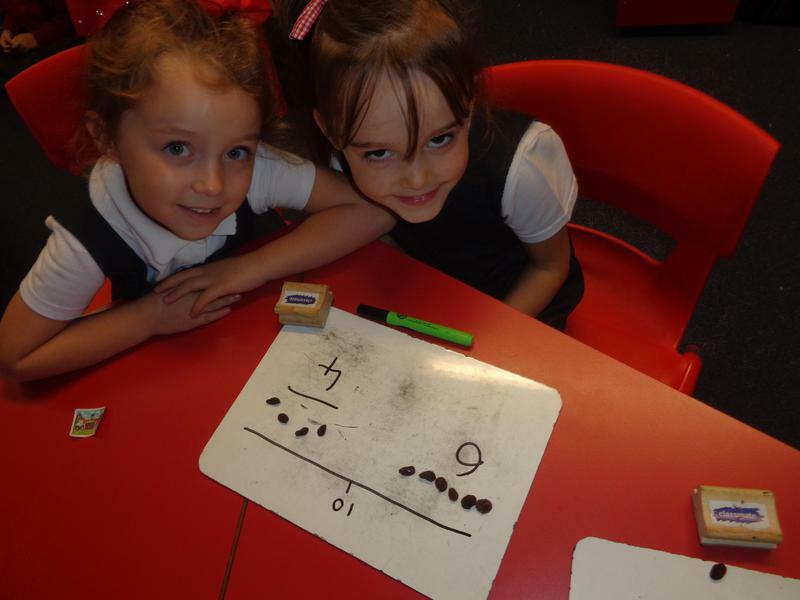 We can tell you double and halving facts for numbers to 10. 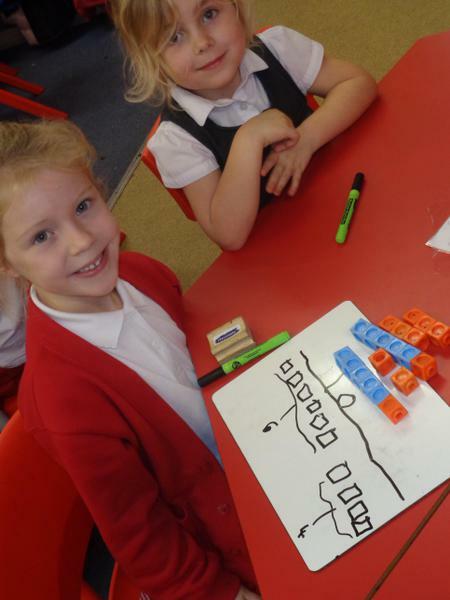 We know how to work out the answers to problems using doubling and halving with bigger numbers. 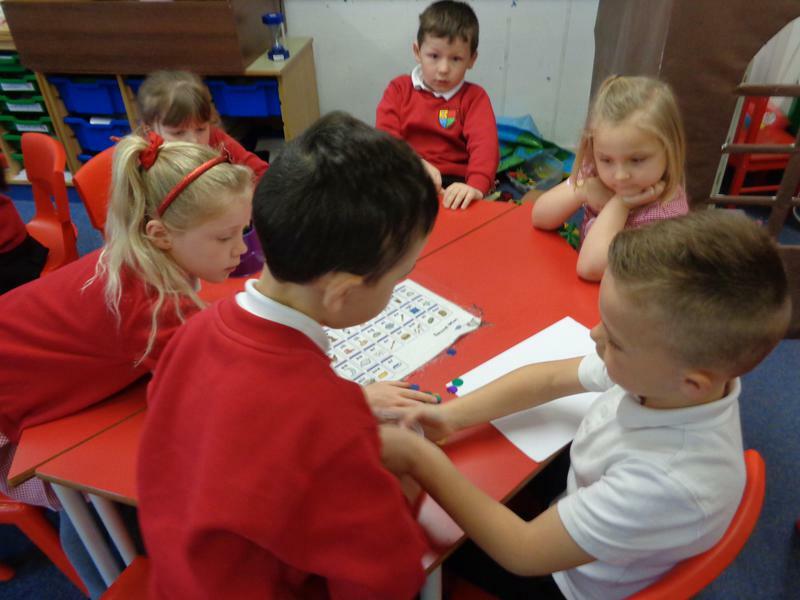 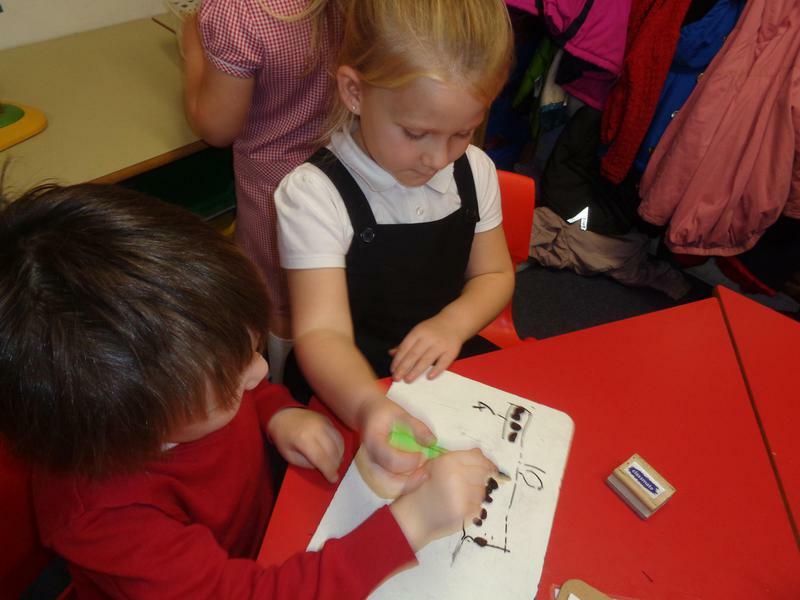 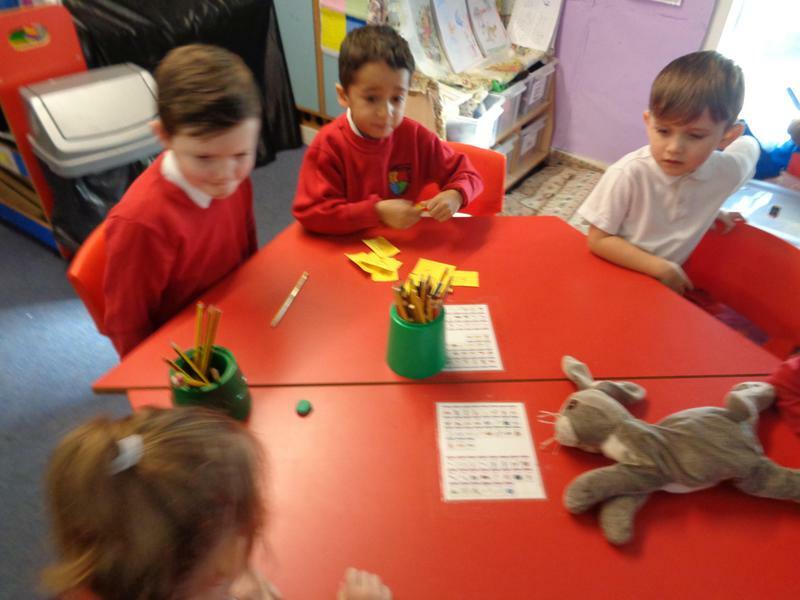 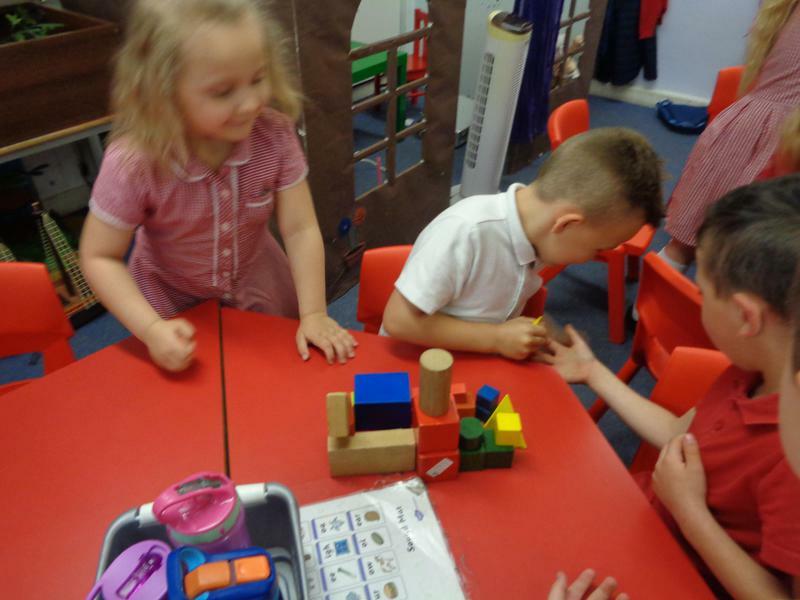 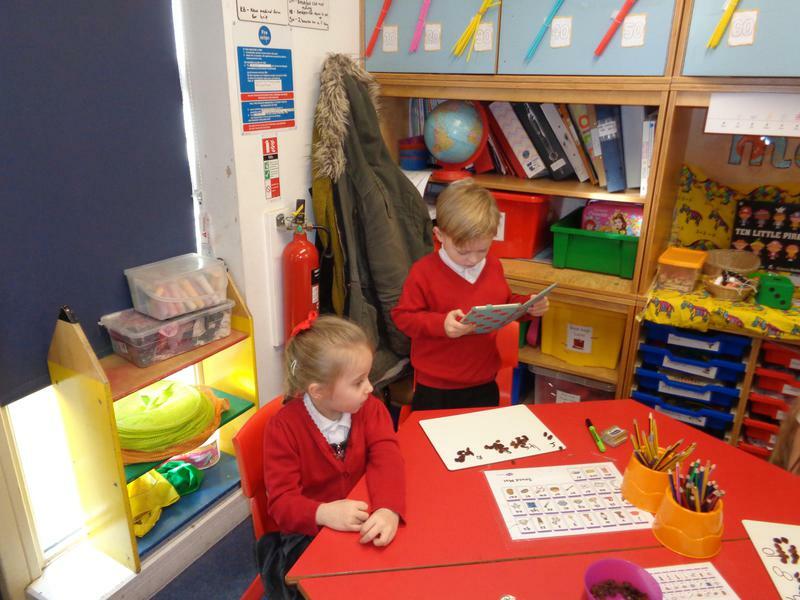 We do lots of talking in maths and can learn lots from our talking partners! 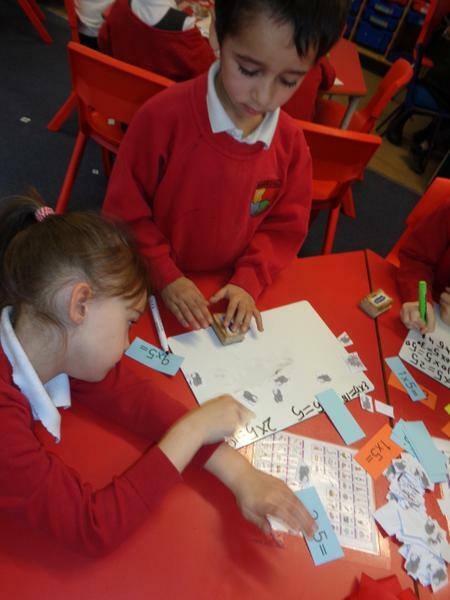 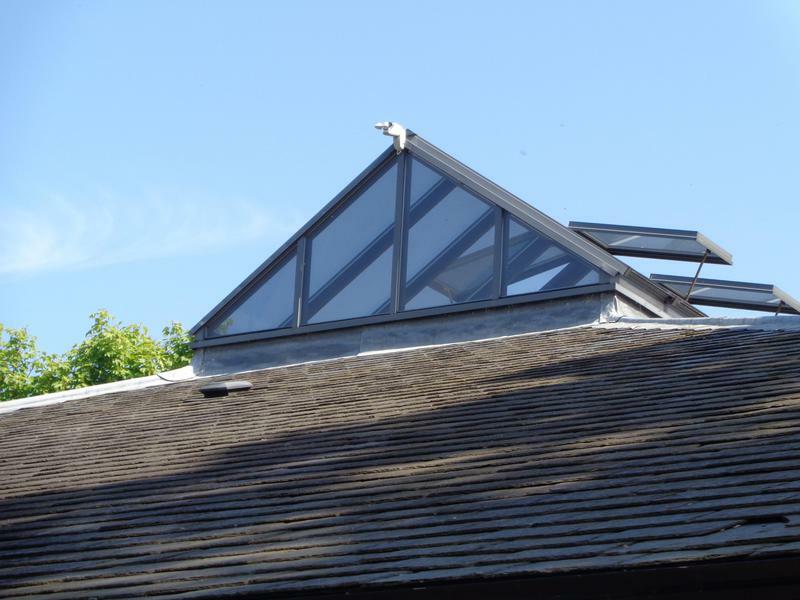 We frequently work in pairs and small/large groups to solve problems. 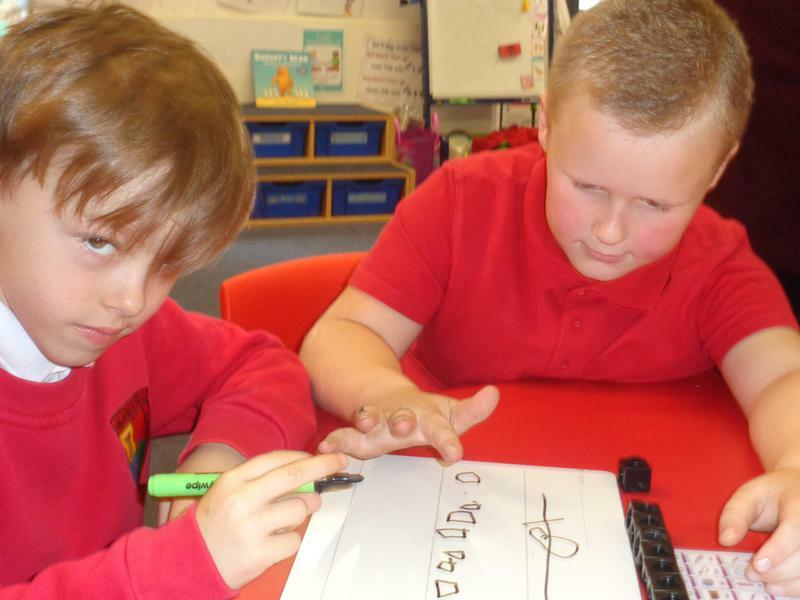 This week we worked in groups to solve multiplication problems. 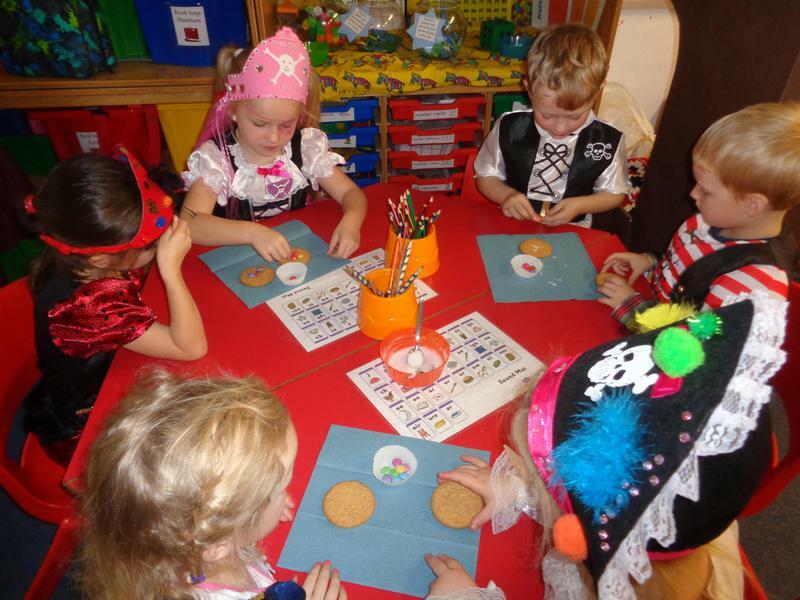 'Fred' had 5 friends who each had 3 sweets to give to him. 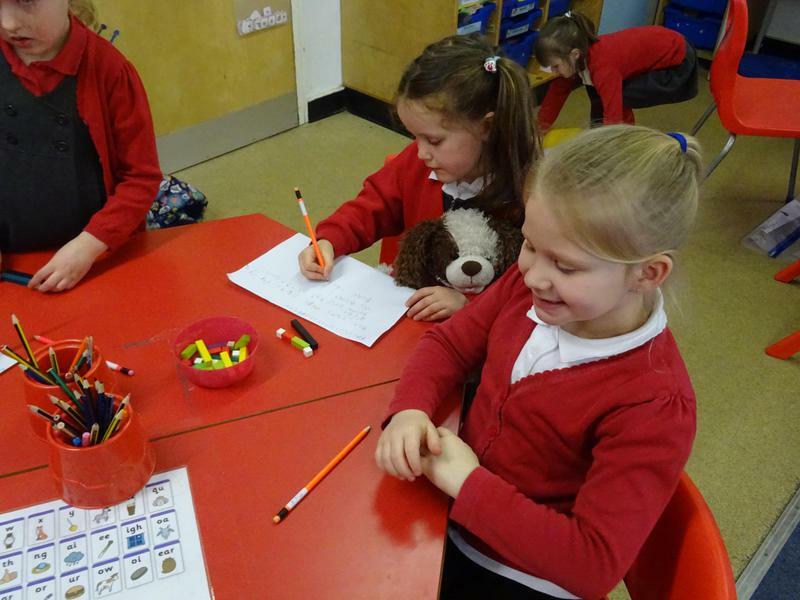 We were working out how many sweets Fred would have. 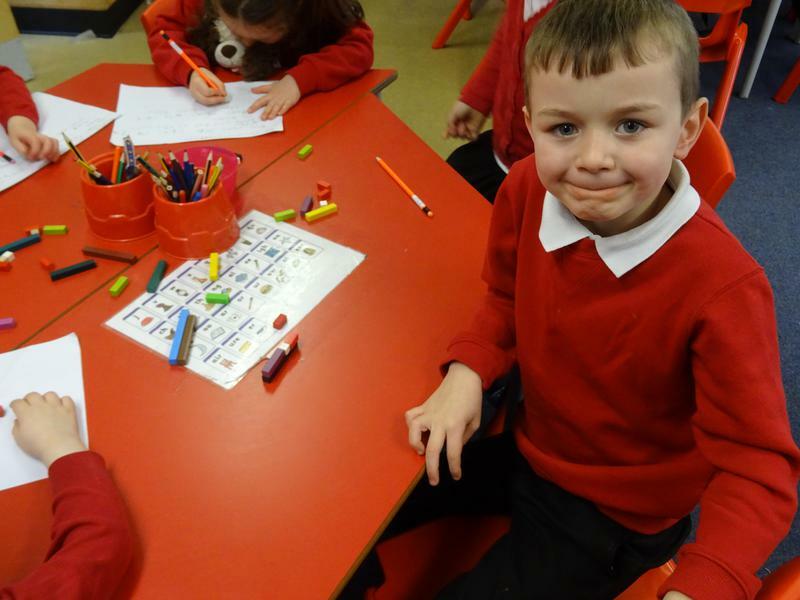 We then worked out how many sweets he would have if he had 3 friends. 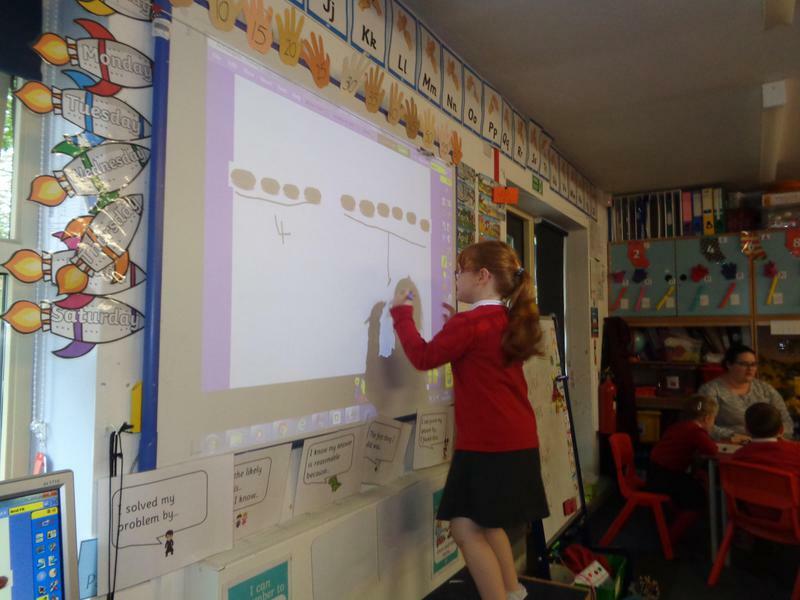 We have also been working on our own and in groups to solve division problems by sharing. 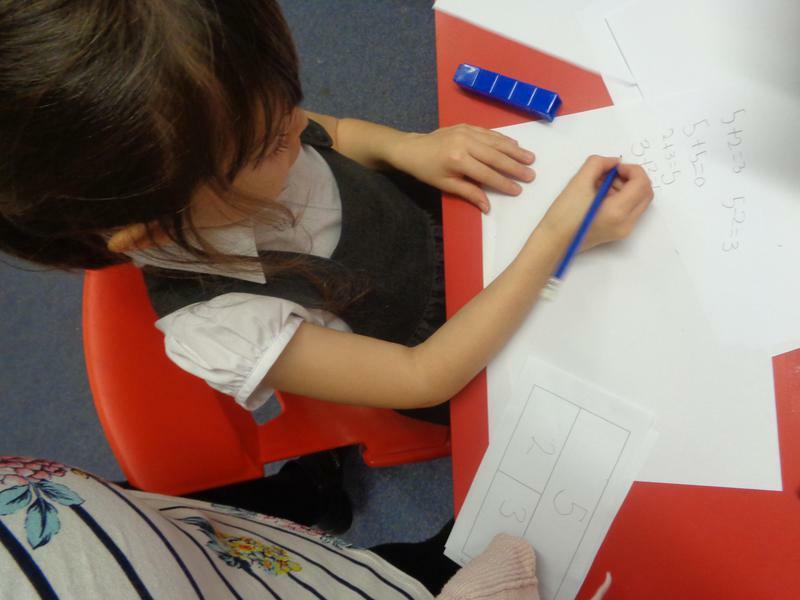 We have been working on the relationship between multiplication and division through some of our maths tasks this week - finding all the calculations which could be represented by arrays. 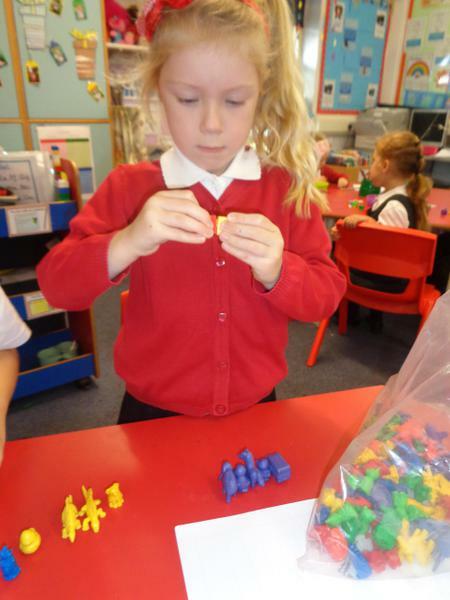 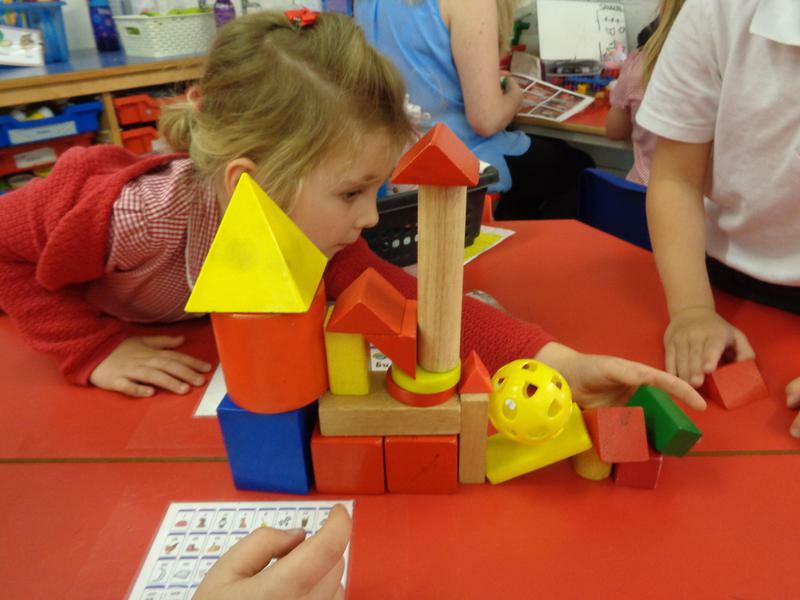 When we started learning about 3D shapes we did lots of investigating. 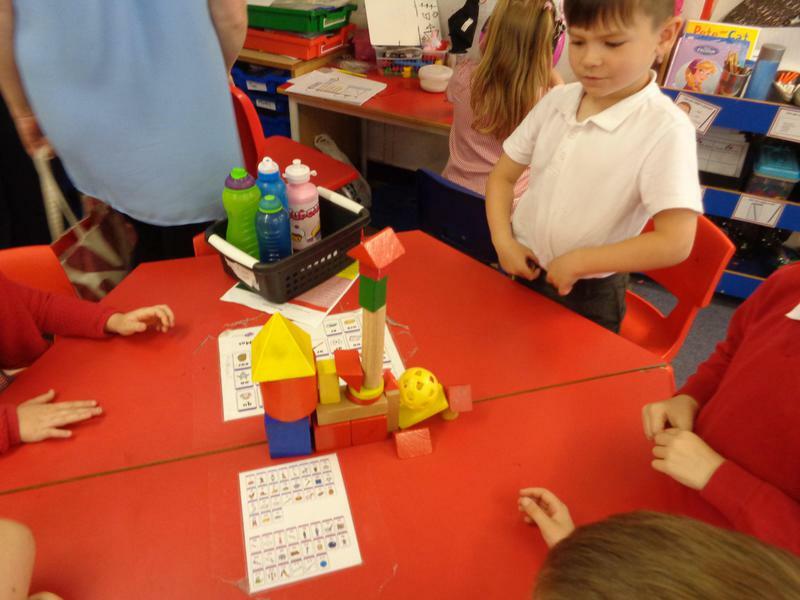 We thought about which shapes we could build with and why some shapes were better than others. 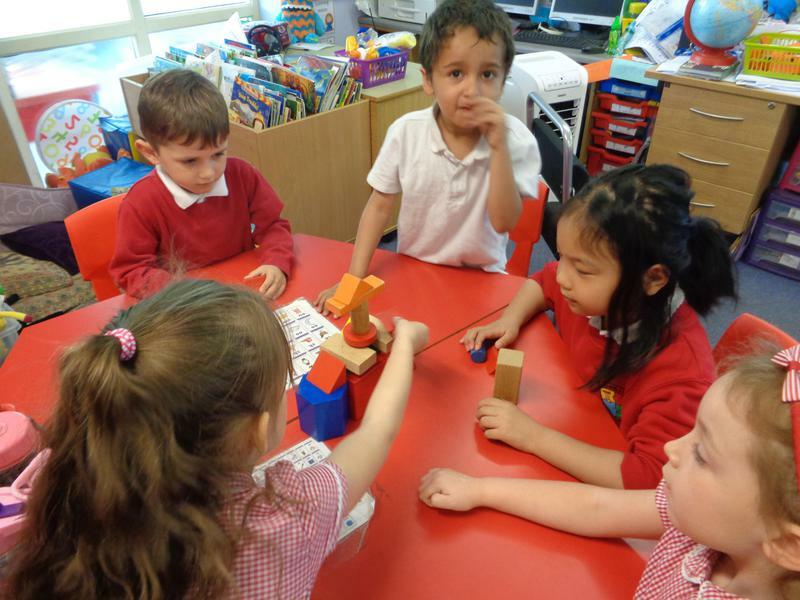 We talked to each other about what we found out and described our completed buildings to other groups. 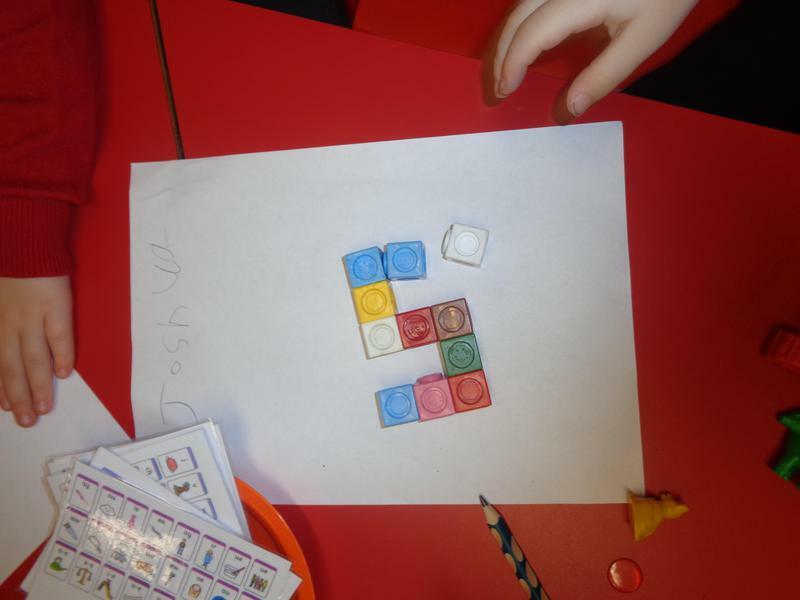 We had to explain our choices to the class and use the names of the shapes! 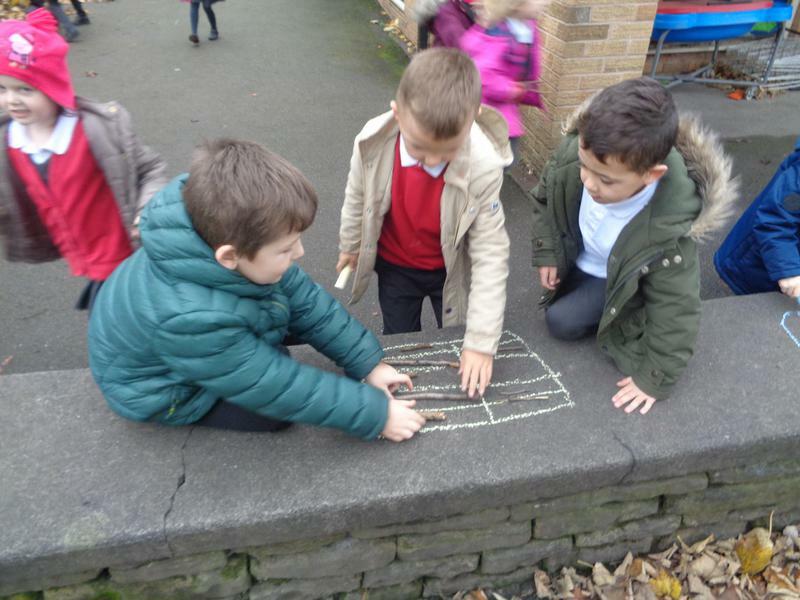 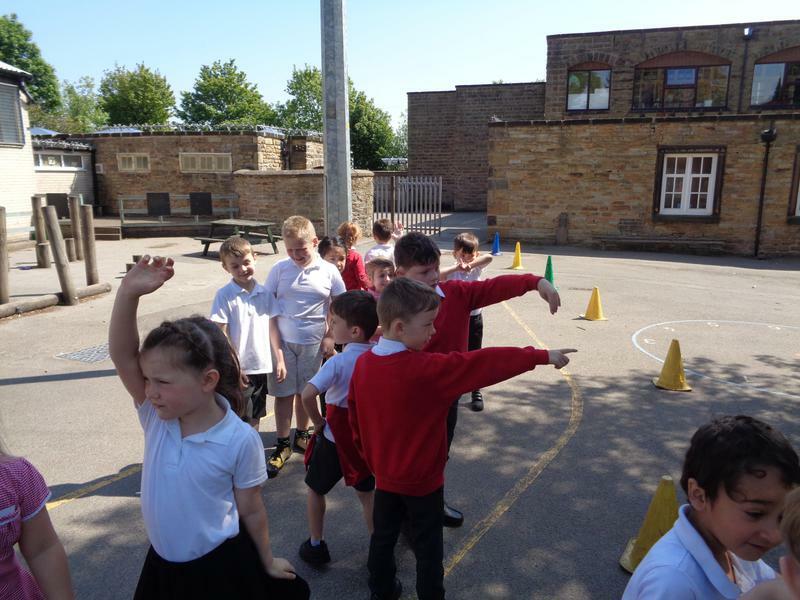 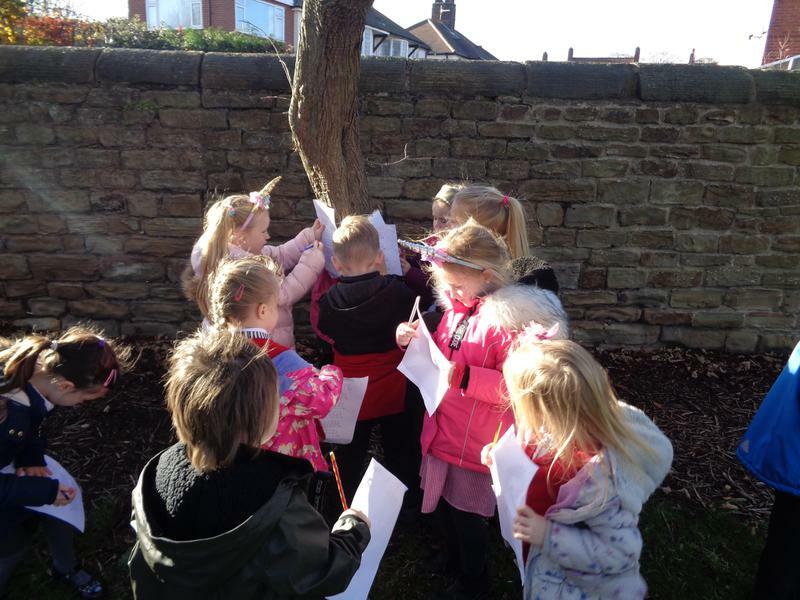 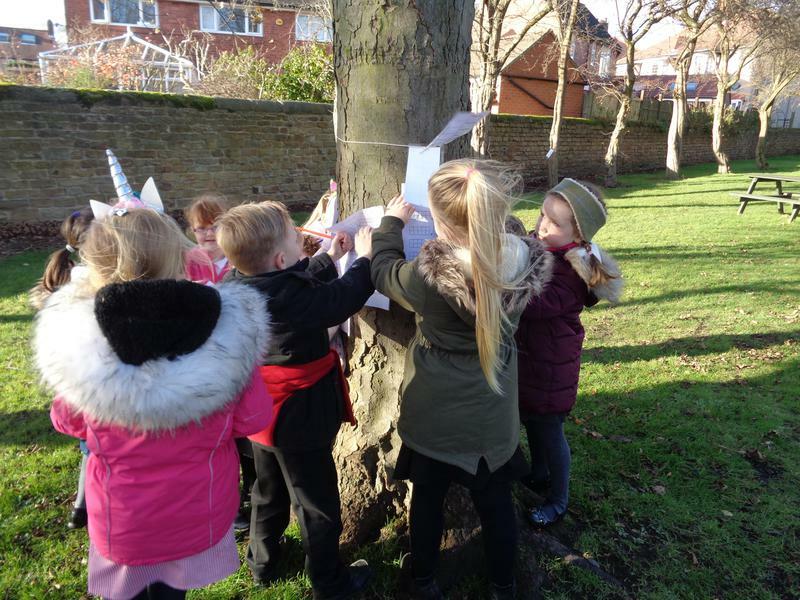 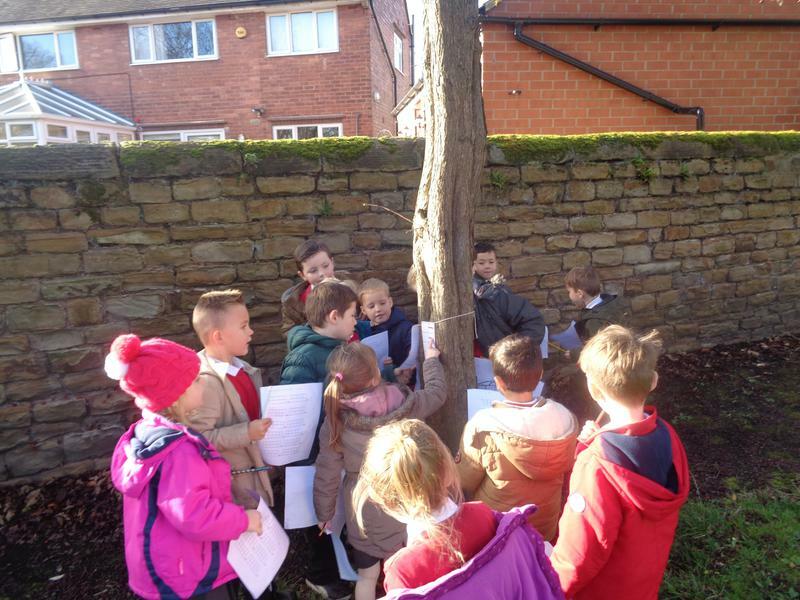 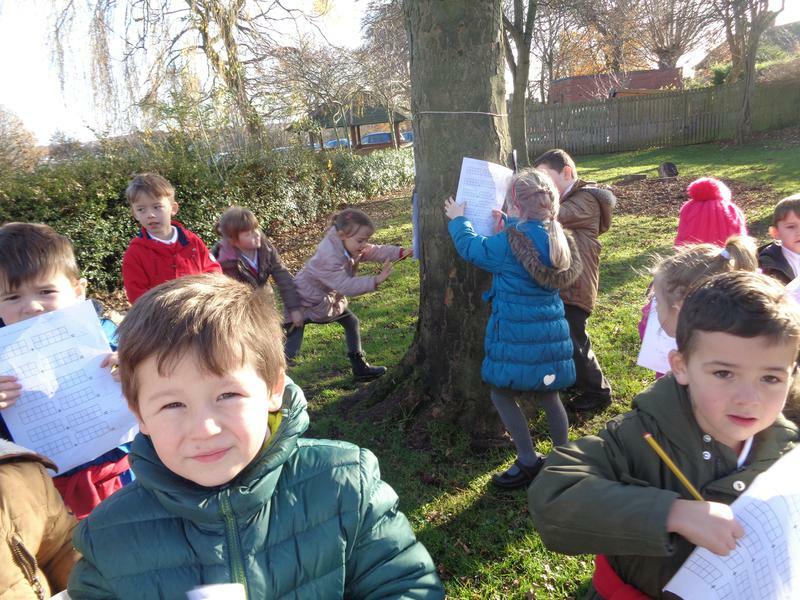 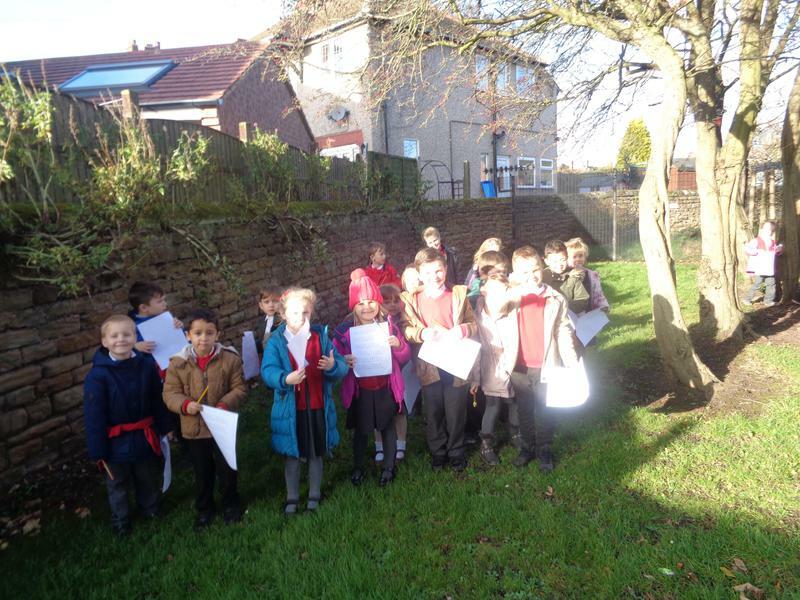 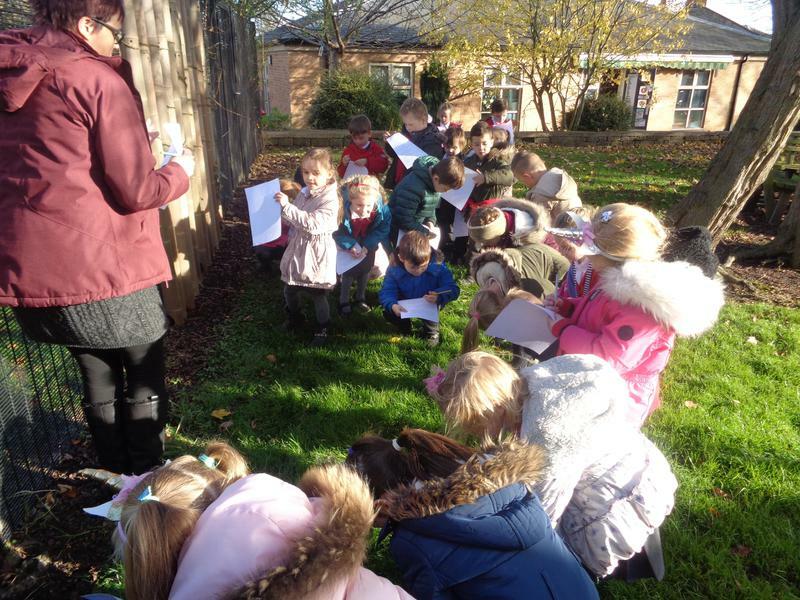 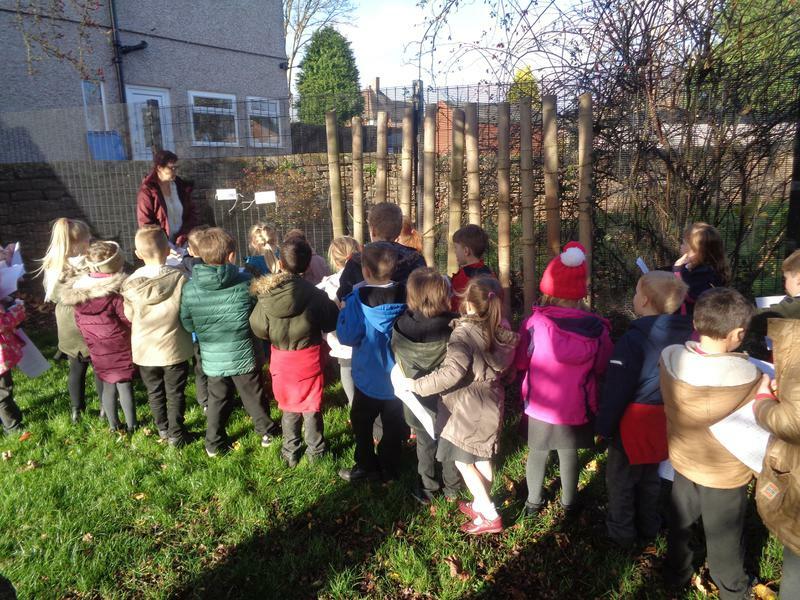 After investigating shapes inside, we ventured outside for a shape hunt. 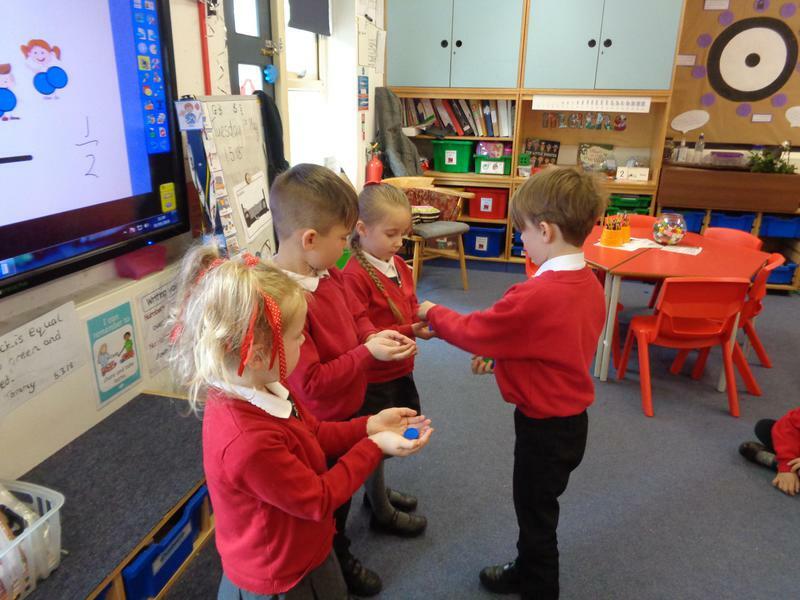 We used lots of language to describe the properties of shapes we could see to help us decide which shapes we had found! 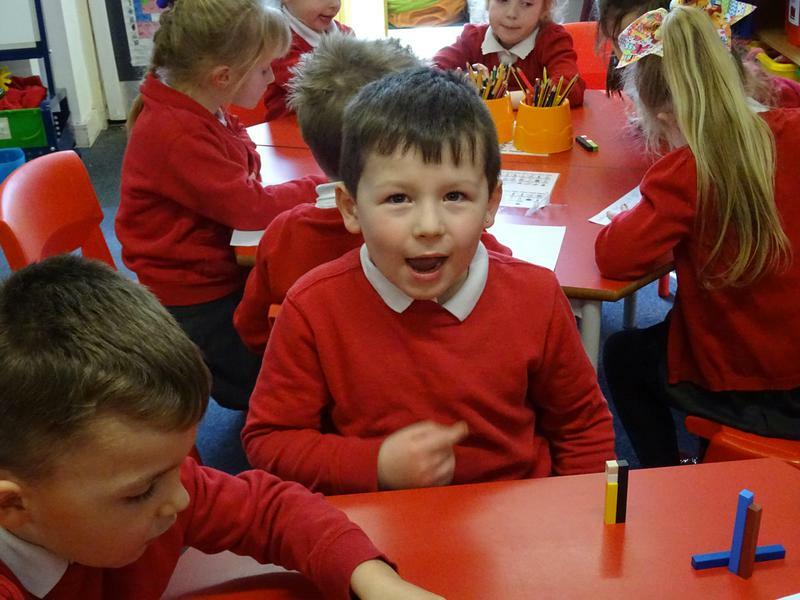 We noticed the oblong face of a cuboid in the bricks!